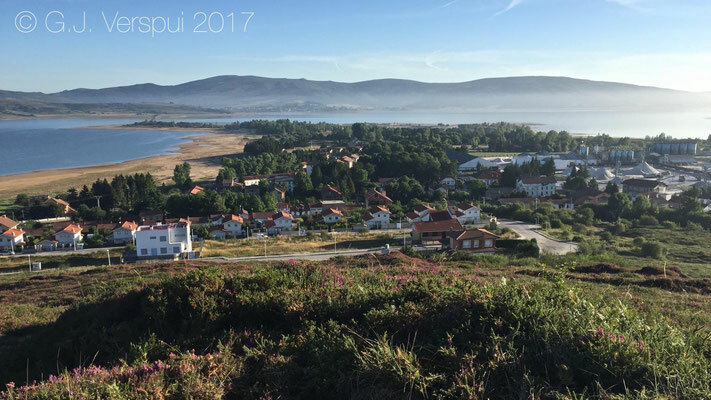 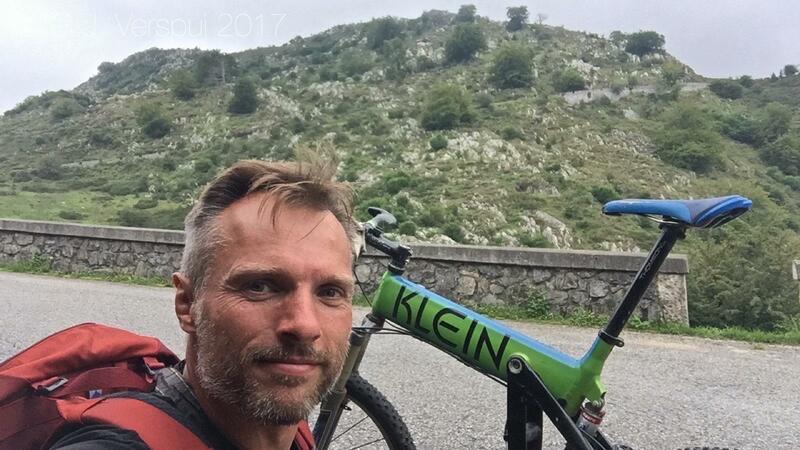 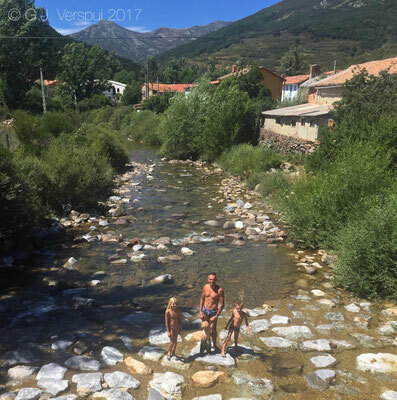 Summer holidays 2017, its always difficult to find a good place to spend the summer, but thank God I have a hobby that helps out at moments like that. 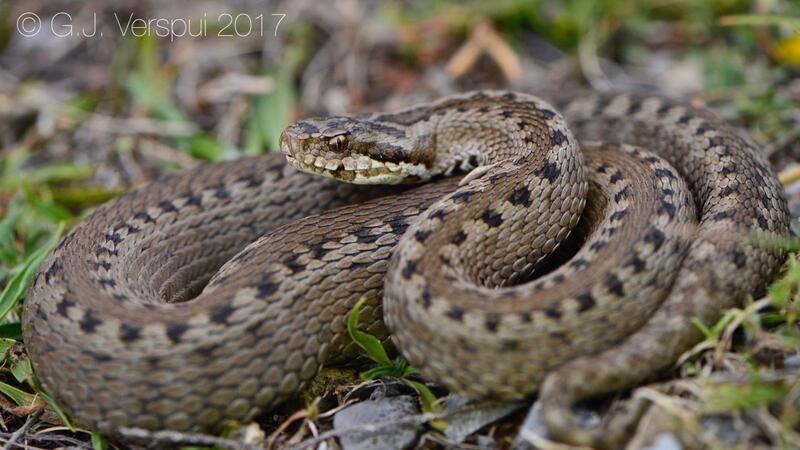 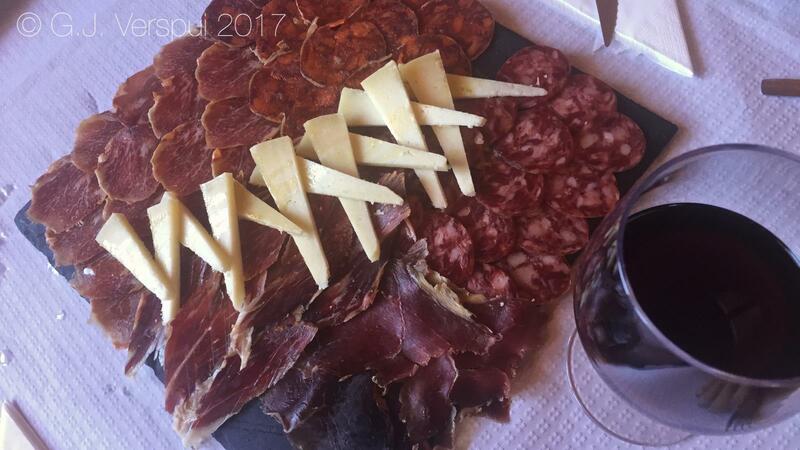 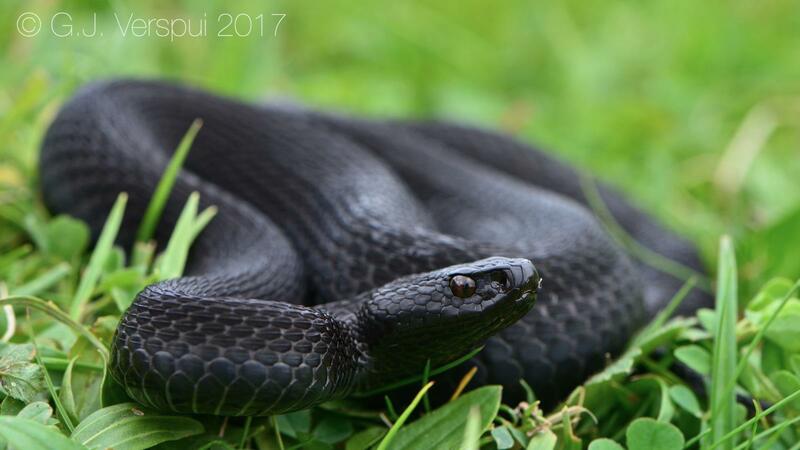 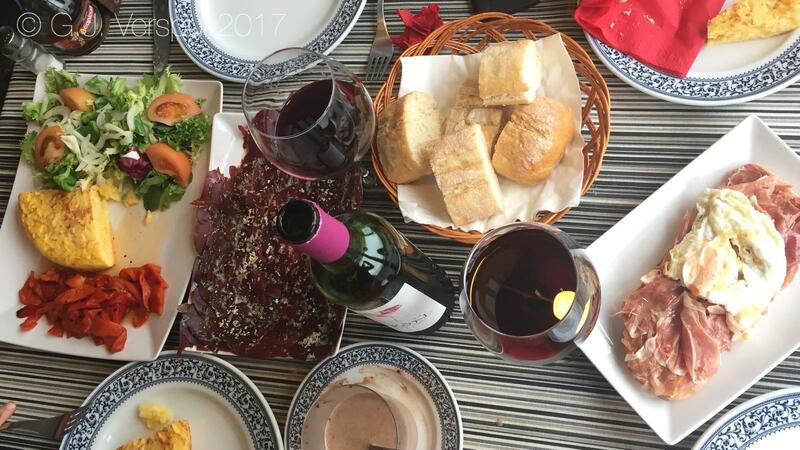 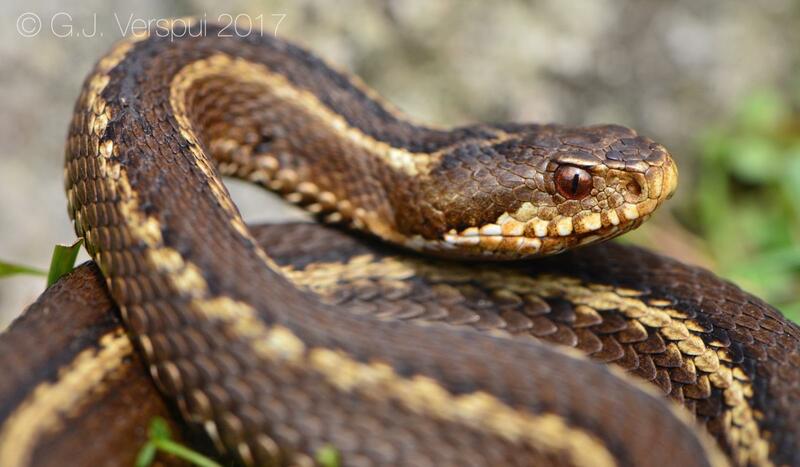 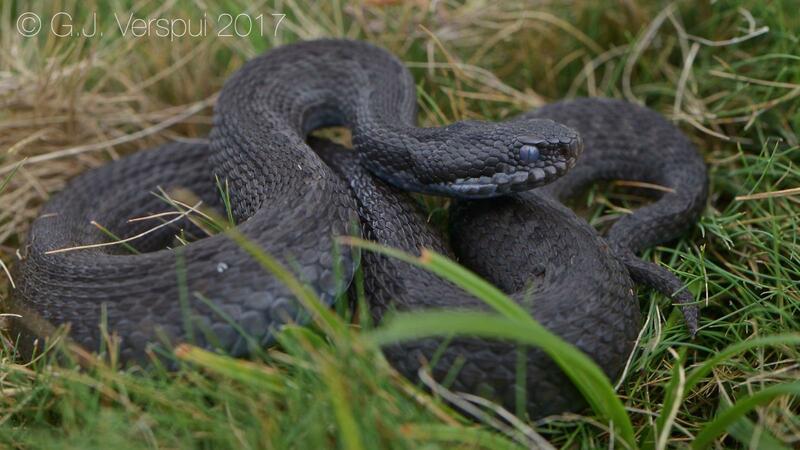 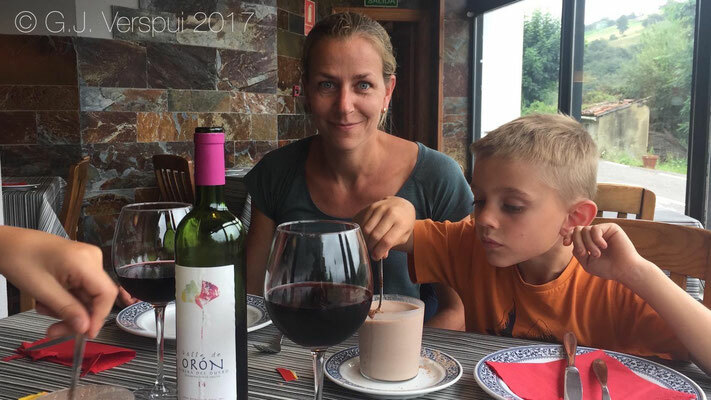 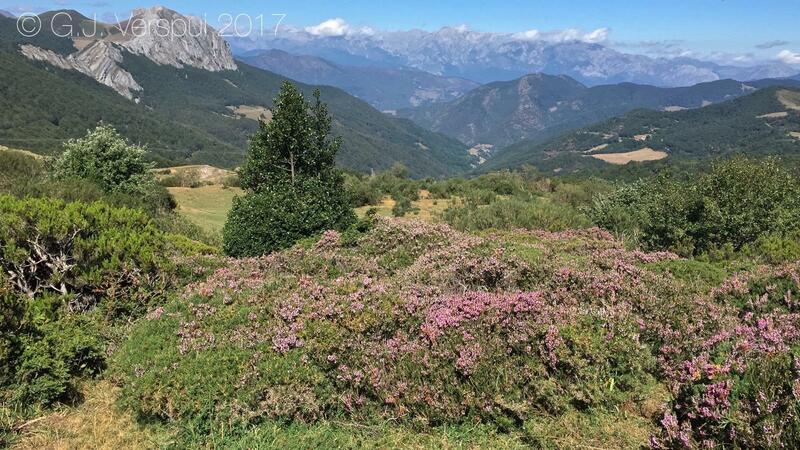 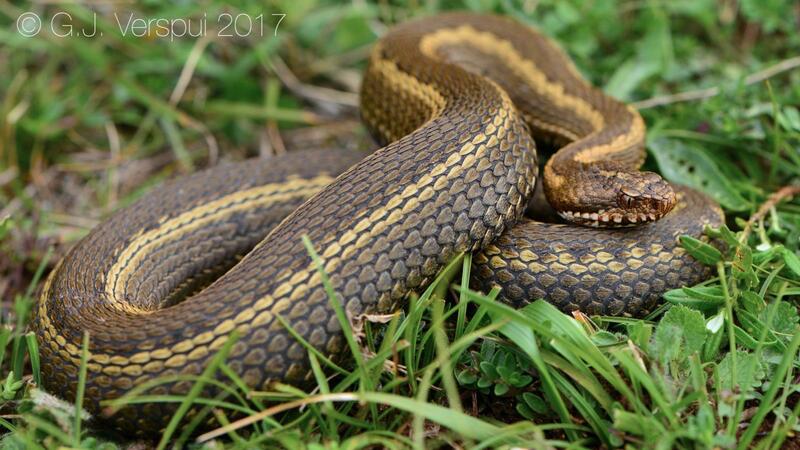 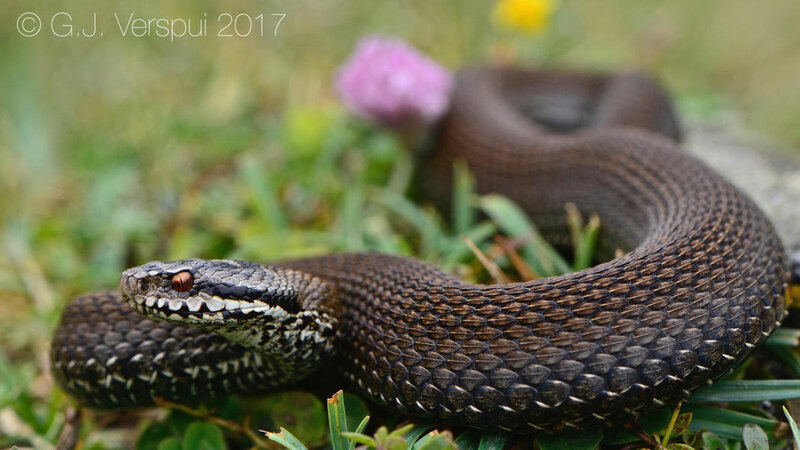 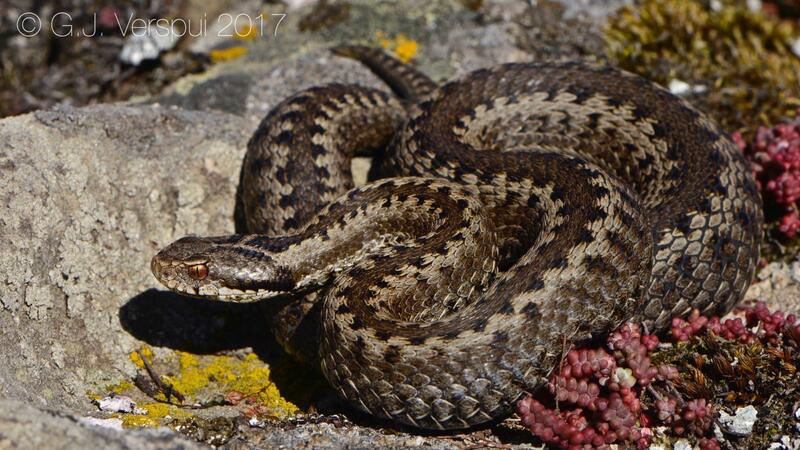 A combination of good food, beautiful nature and some Vipera species that are still active in summer were the ingredients for this year. 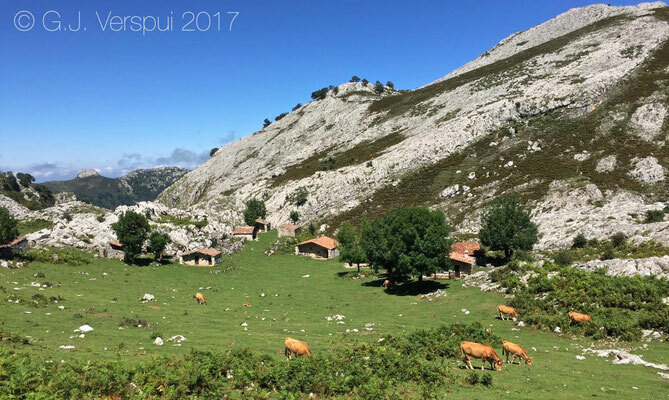 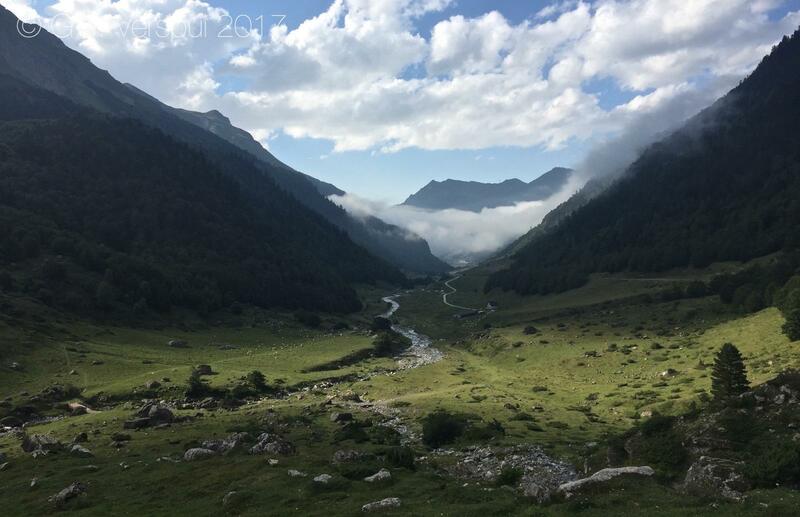 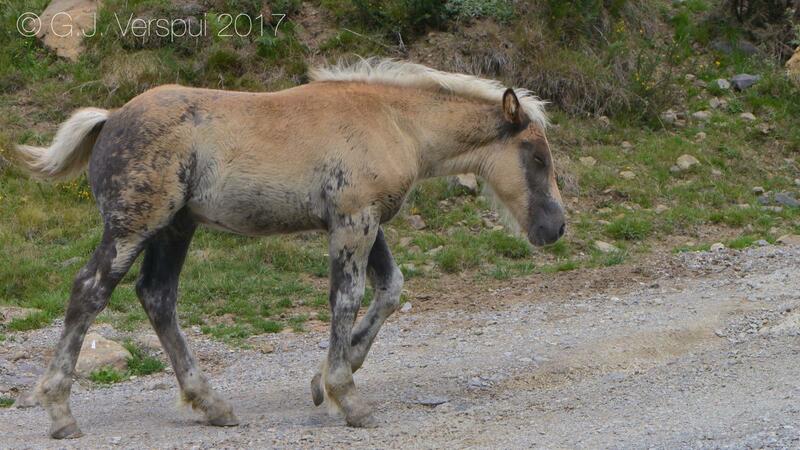 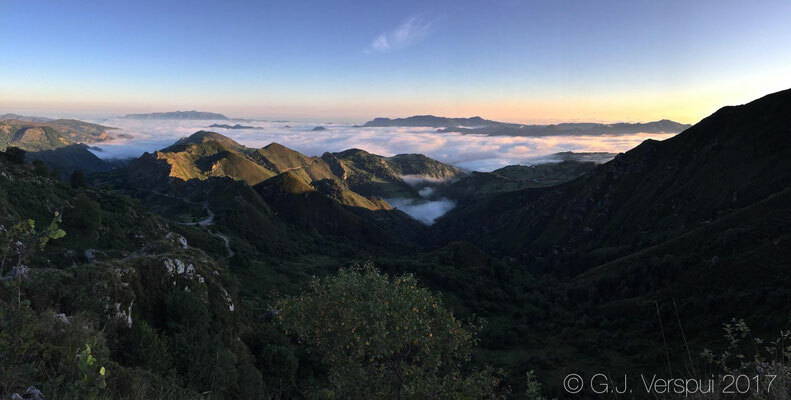 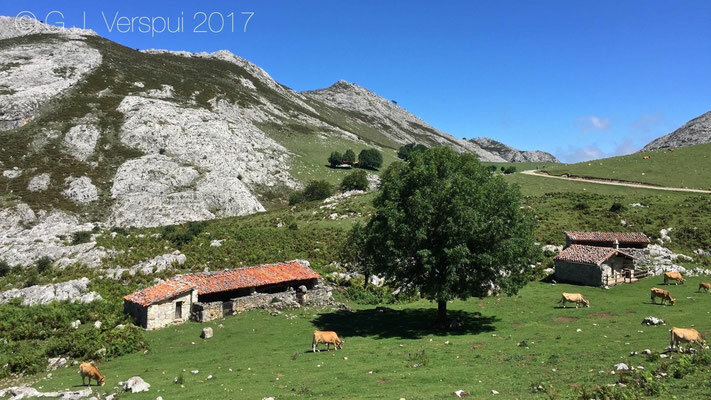 So the destination for this year was the western Pyrenees and the North West of Spain. 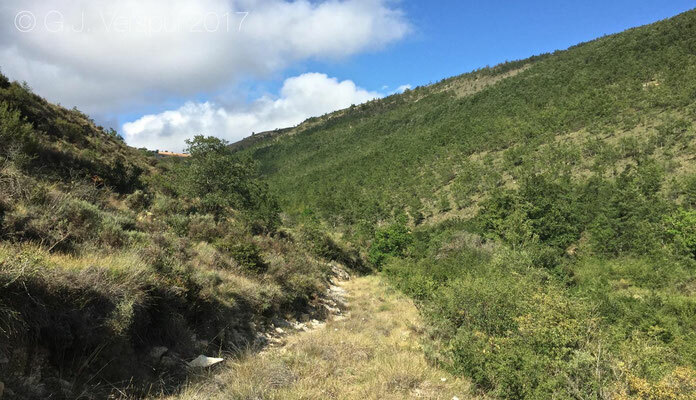 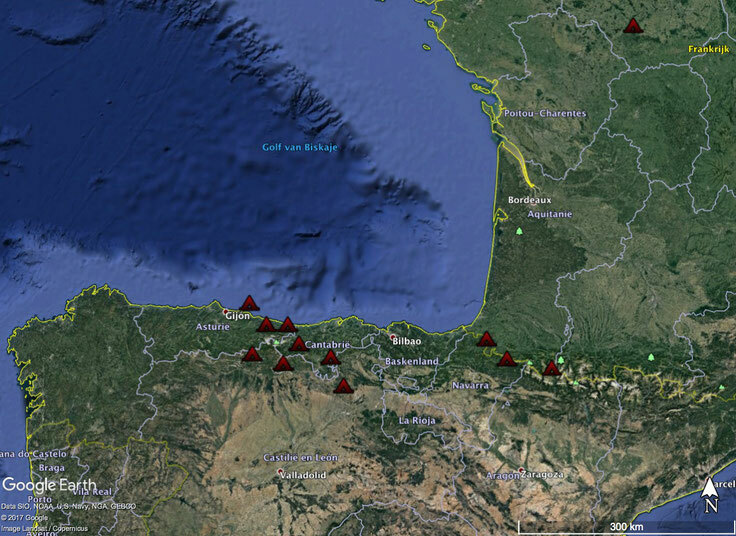 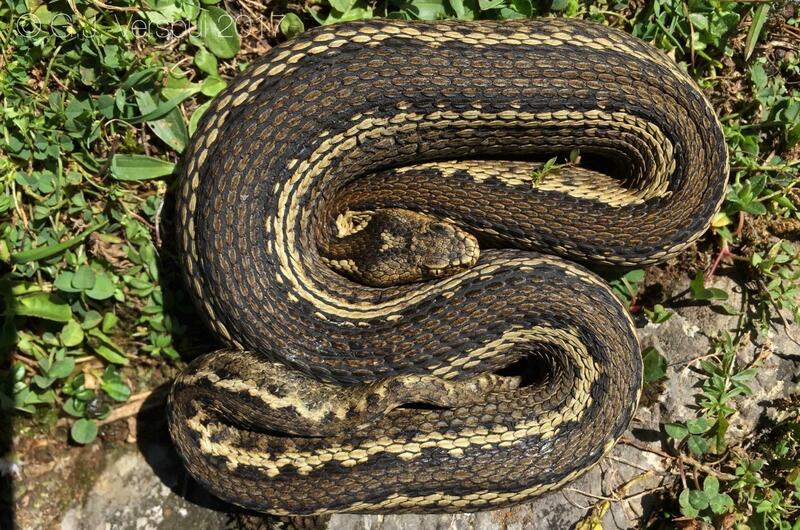 In that area it is possible to find 3 species of viper, Asp Vipers, Lataste's Viper and Seoane's Viper. 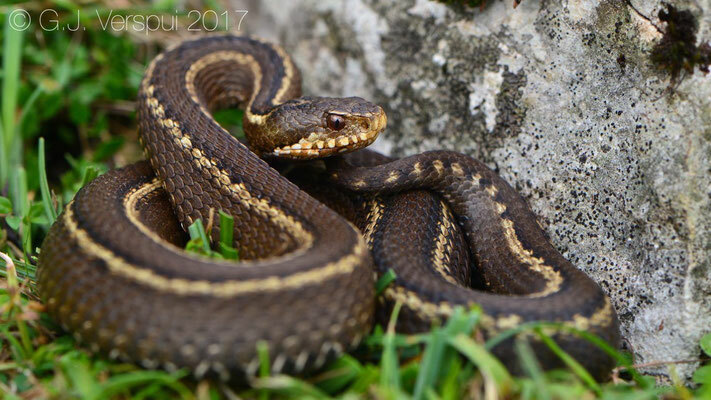 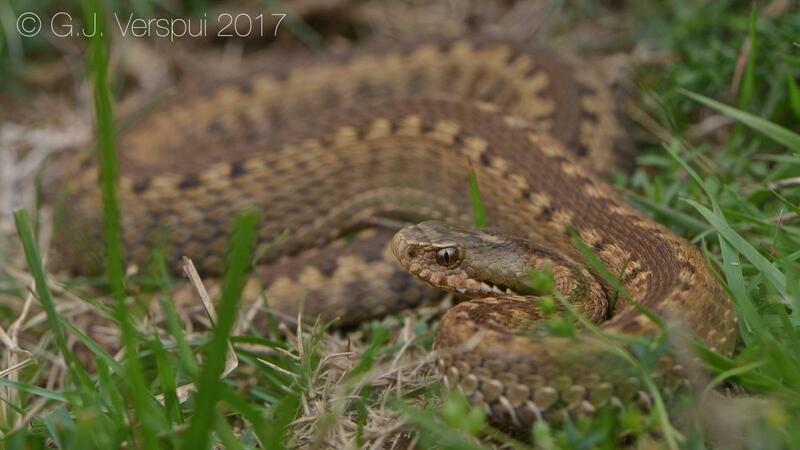 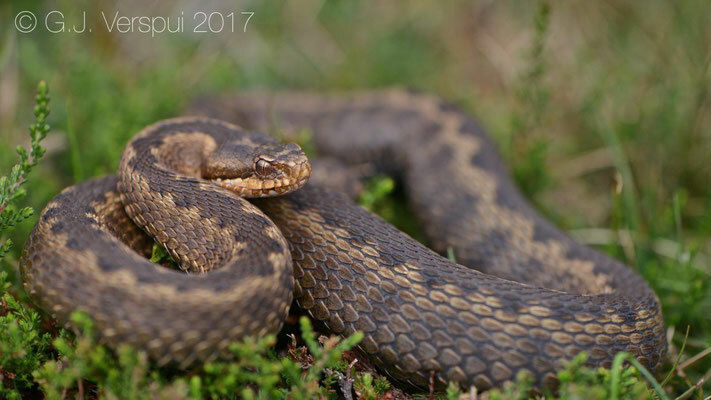 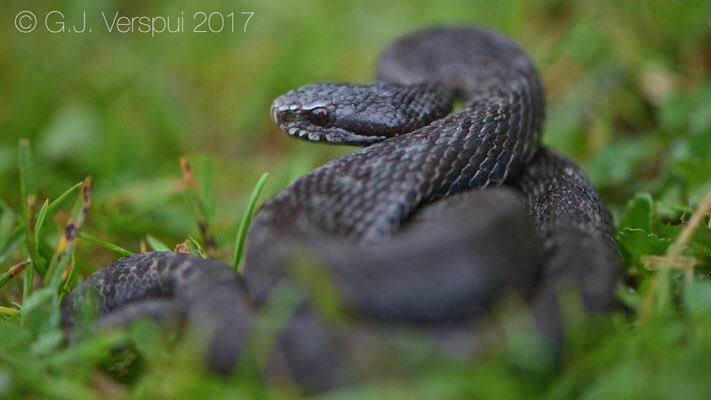 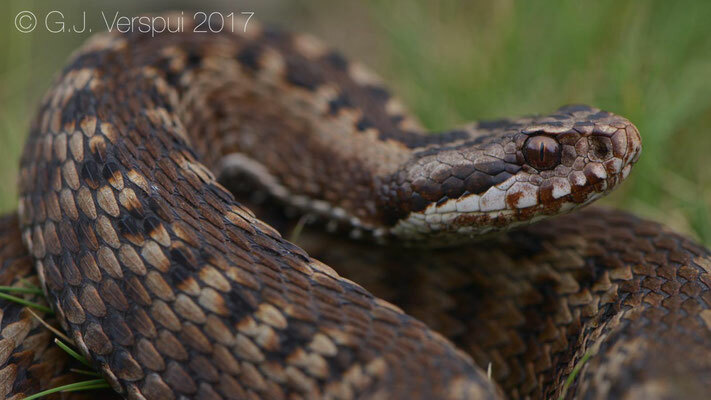 I think I saw more Seoane's Vipers in my life than any other viper if I doesn't count Vipera berus until now and still I would love to see many more of these. 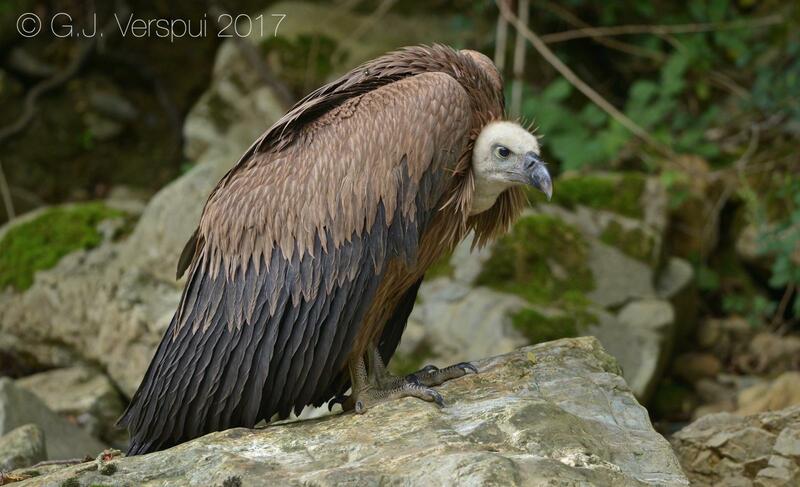 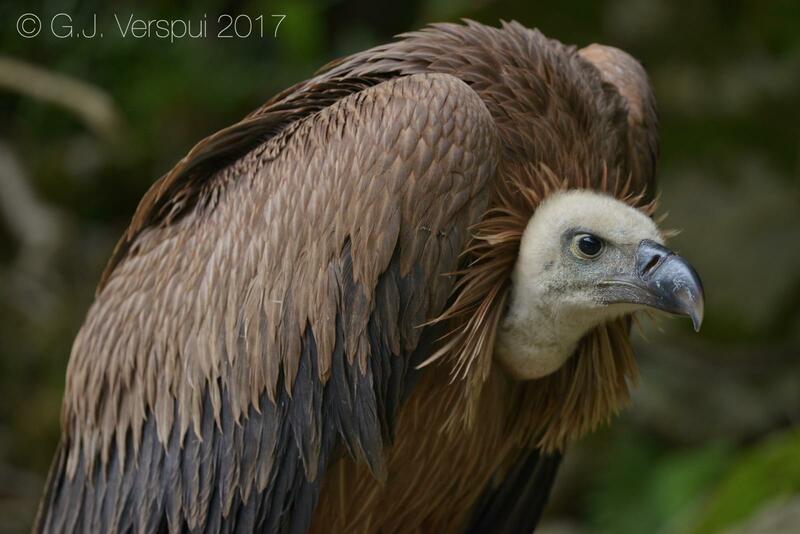 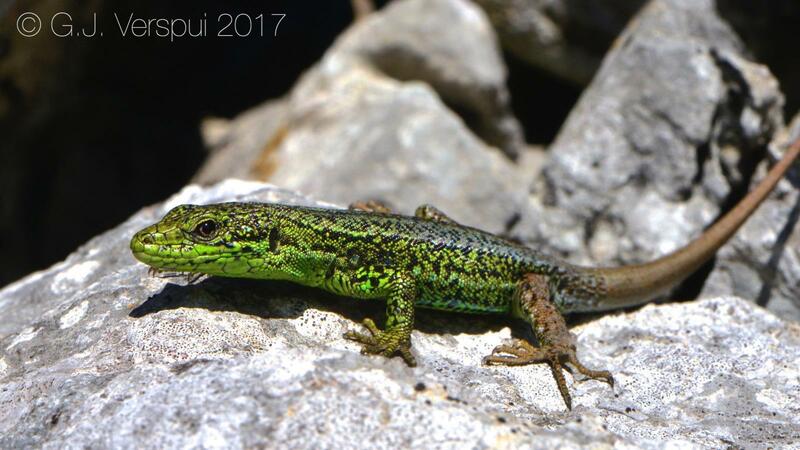 The reason for that is that there is so much variation in this species and the areas you can find them in are amongst my favorite places in Europe. 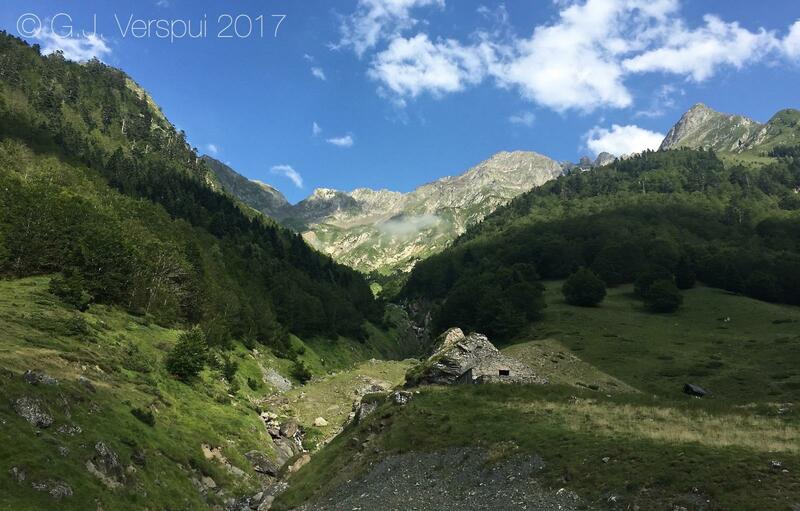 Very early in the morning we left home and wanted to reach our first spot in the french Pyrenees the same day, this was not easy, but just before it got dark we arrived. 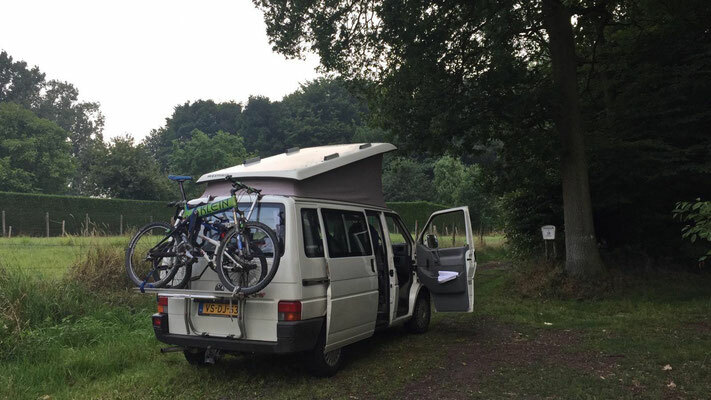 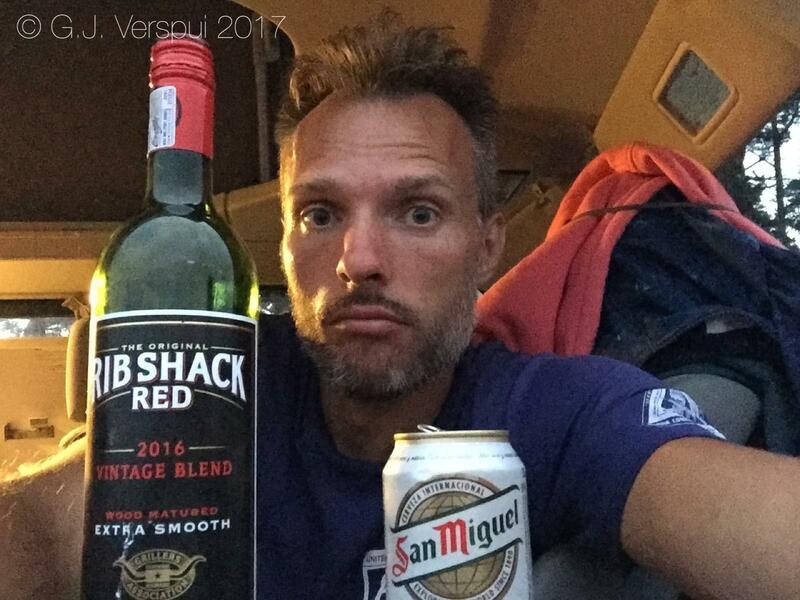 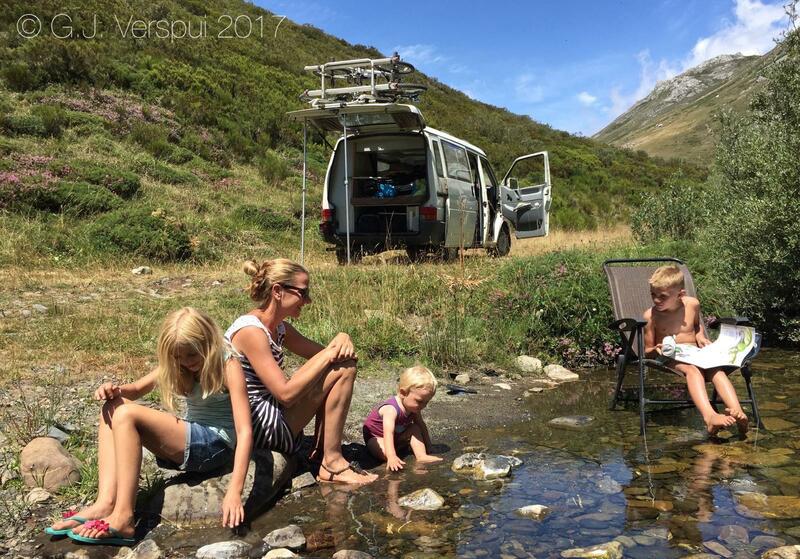 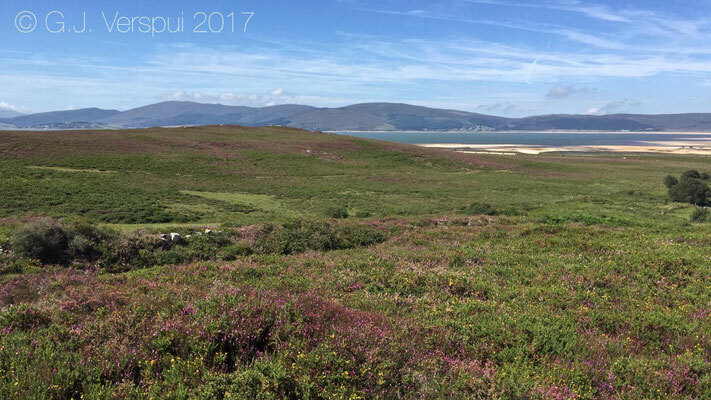 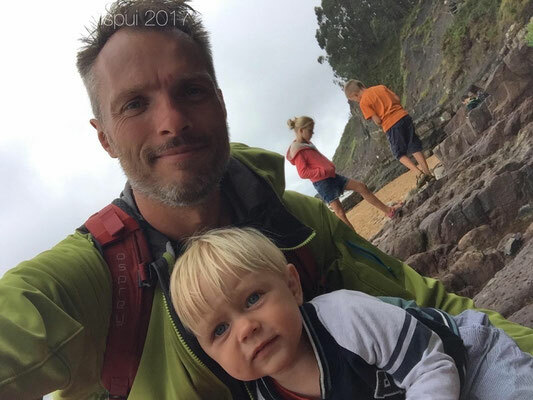 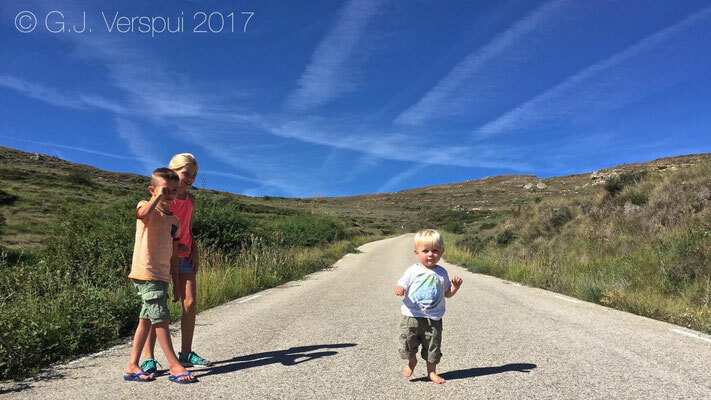 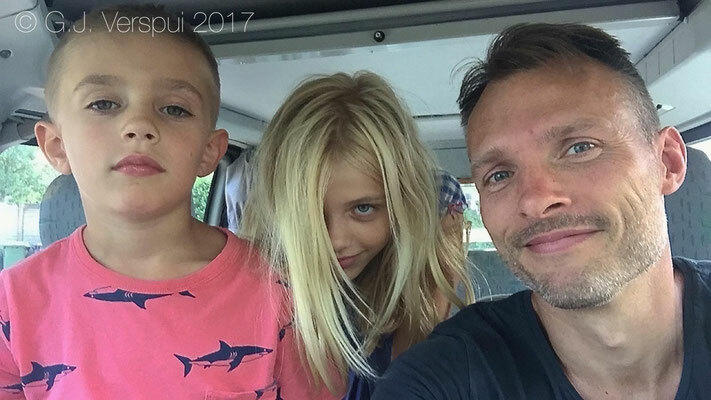 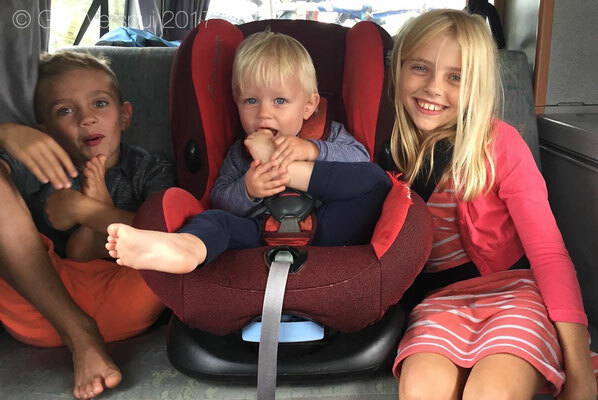 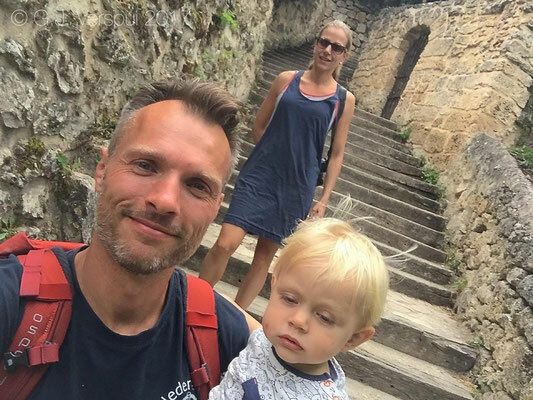 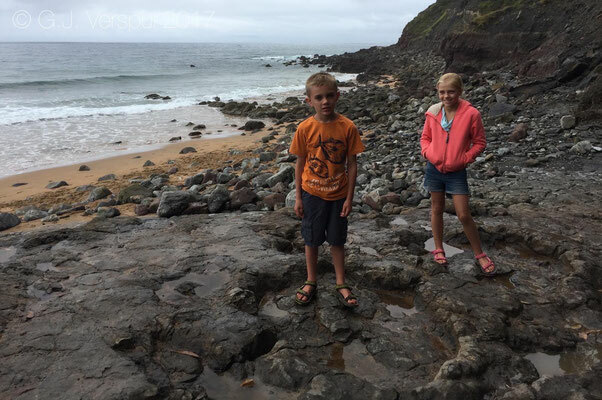 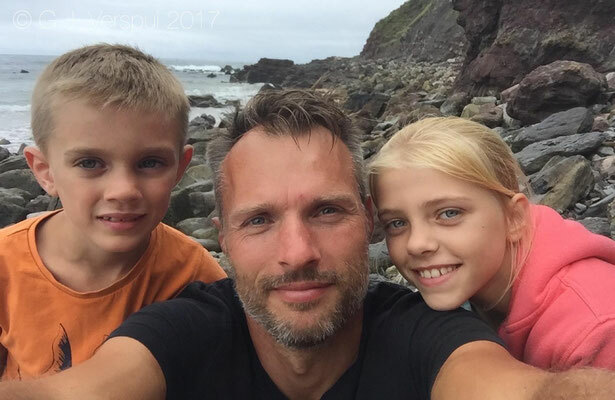 This year we rented an 18 year old Volkswagen california campervan and that was a good choice for what we wanted to do, it was a bit small with 5 persons, but we managed. 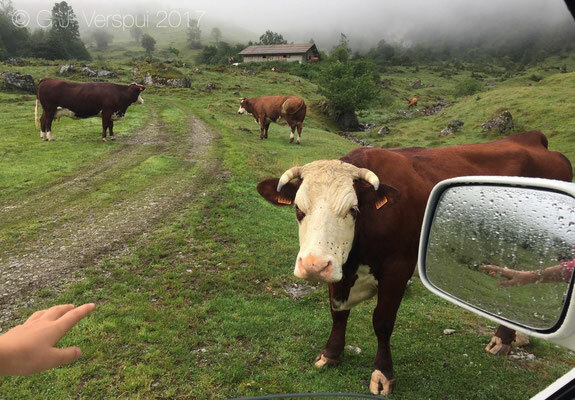 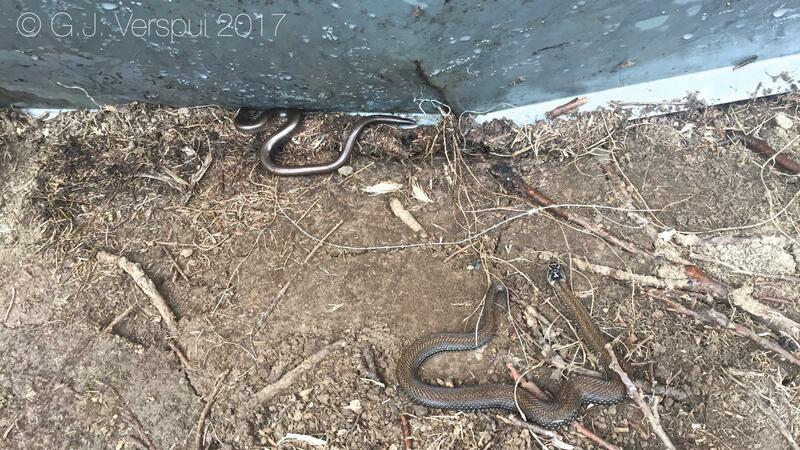 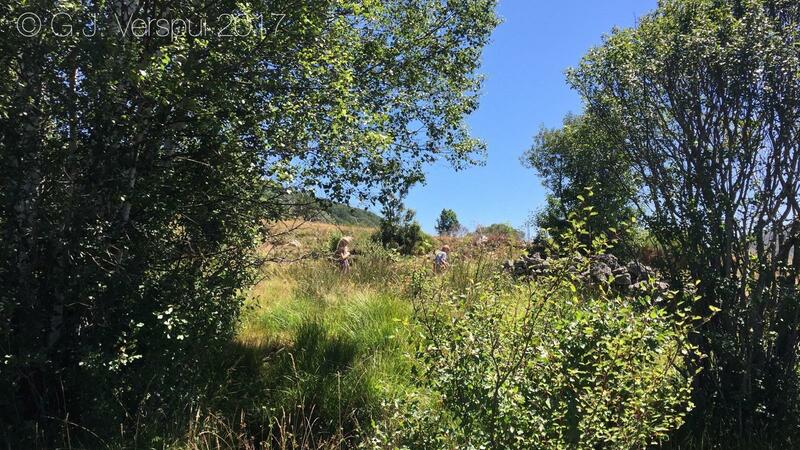 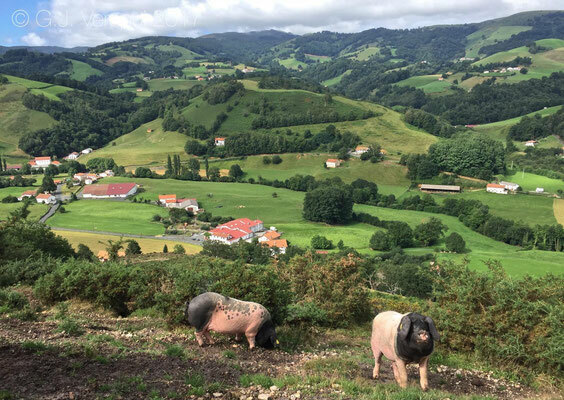 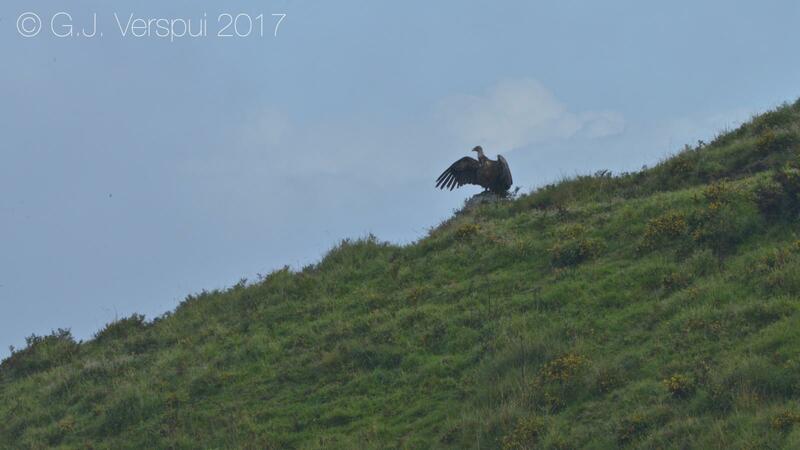 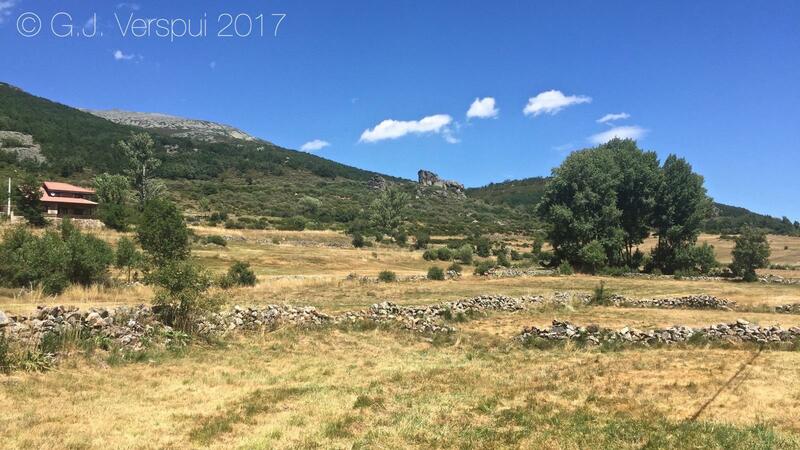 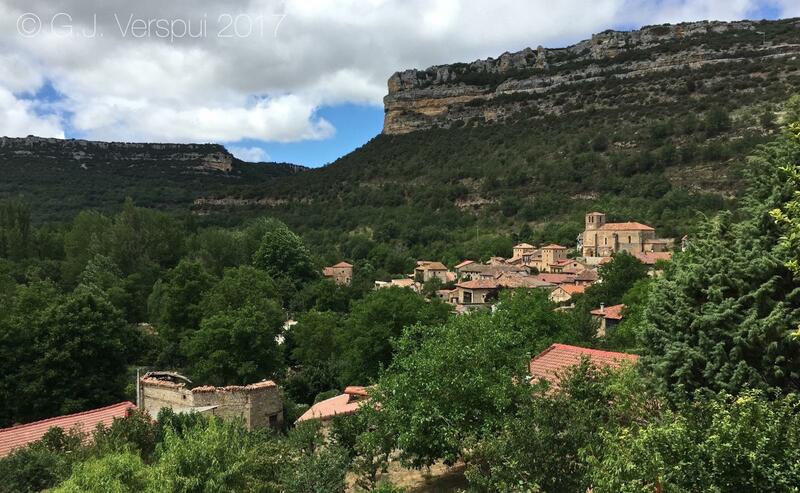 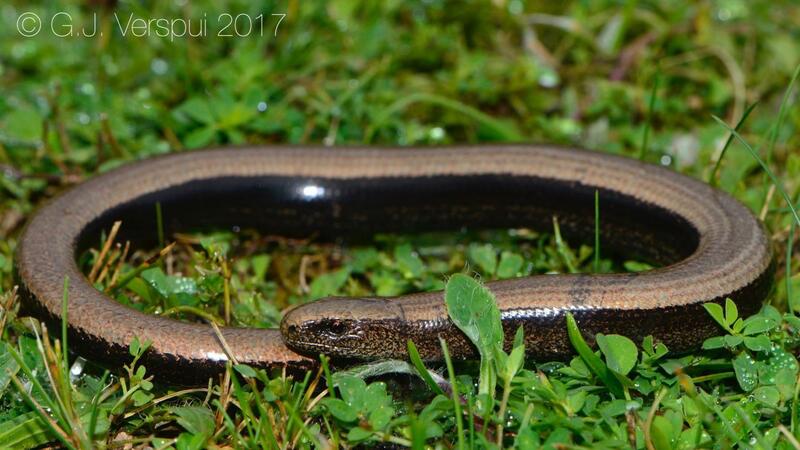 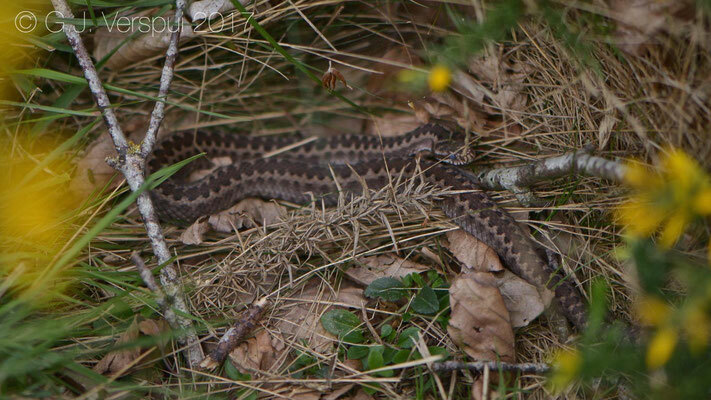 The first place we went to was in the Haut Pyrenees and next to lots of cows we did see some reptiles as well, a Slow Worm and a yearling Asp Viper. 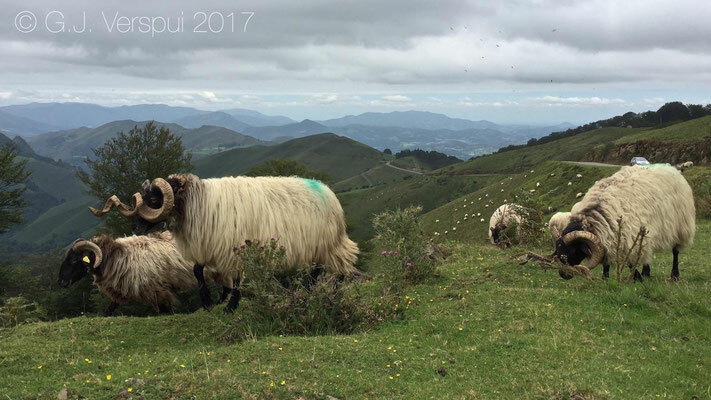 The weather in the Pyrenees was very wet and cold, so we decided to drive into Spain first and visit some more places in the Pyrenees on our way back. 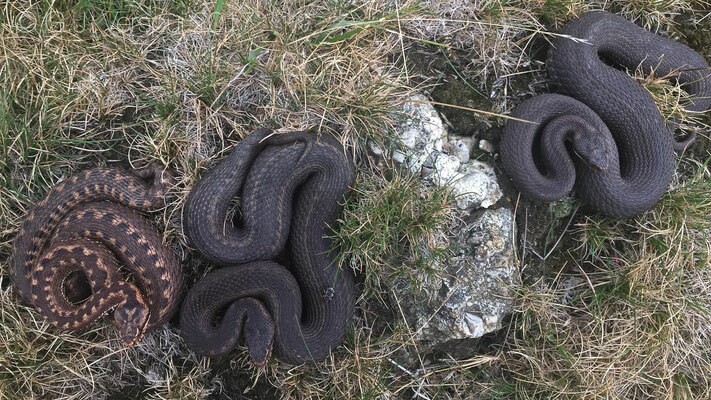 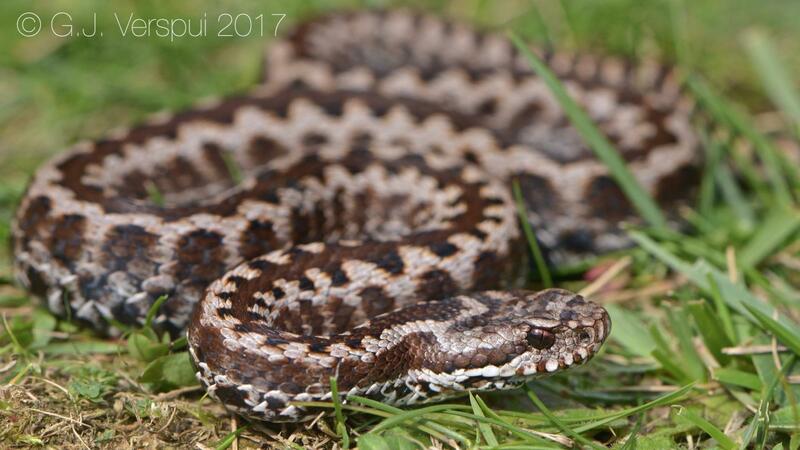 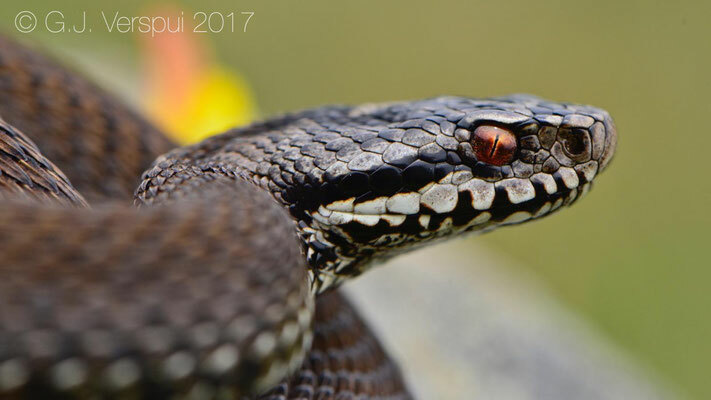 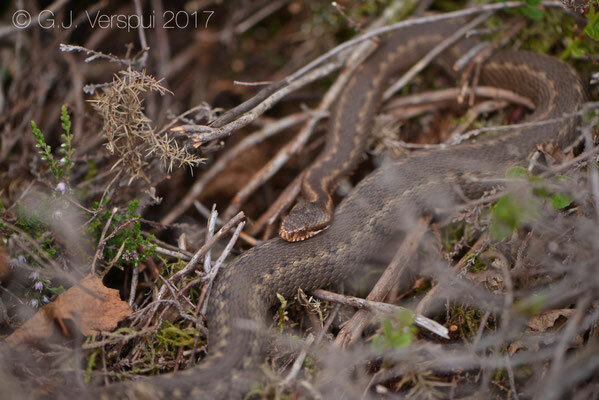 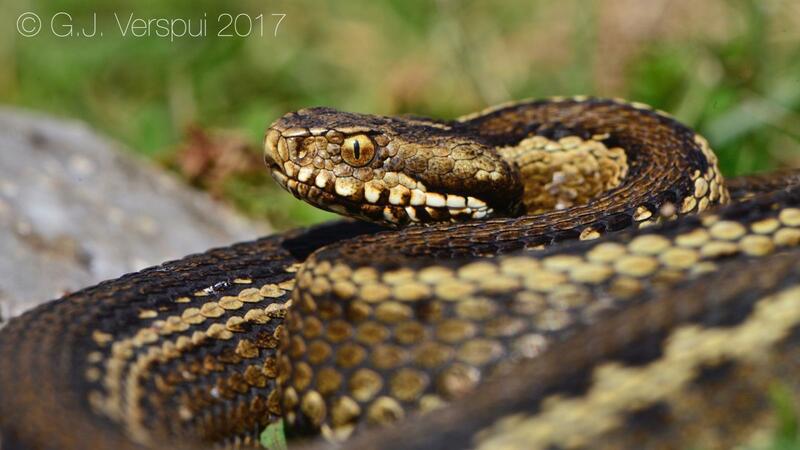 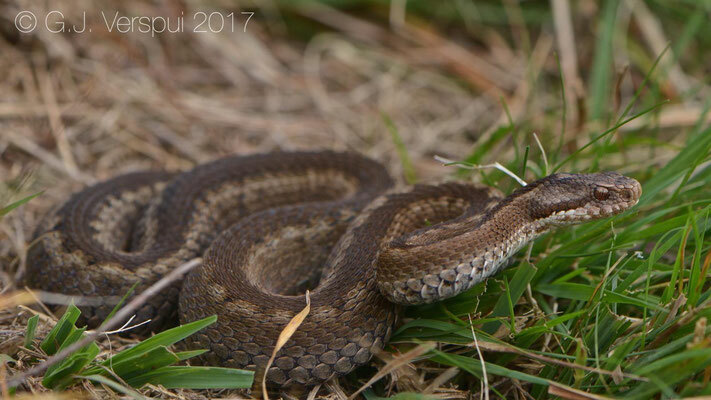 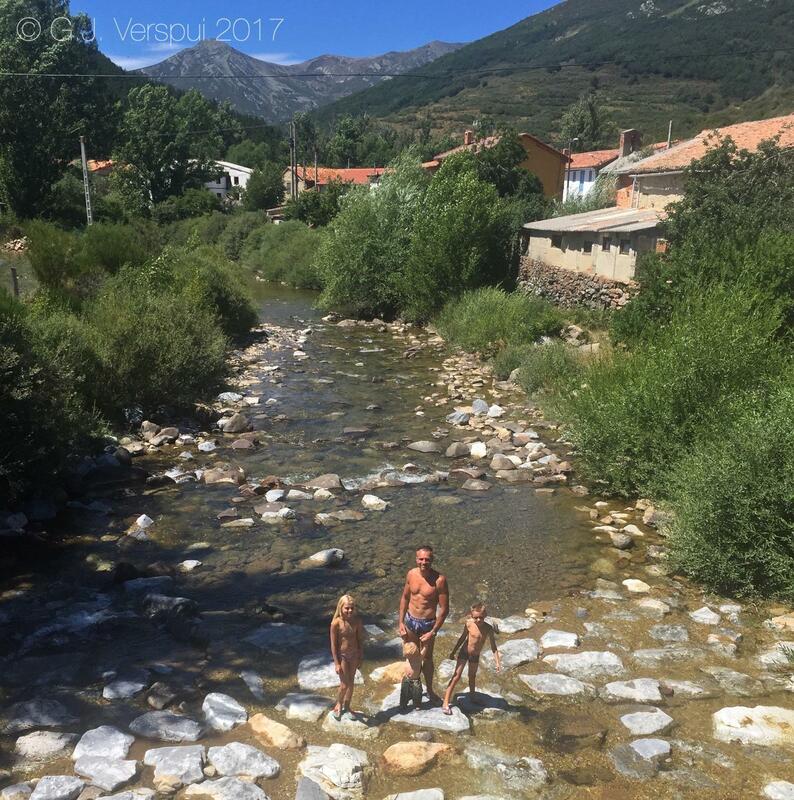 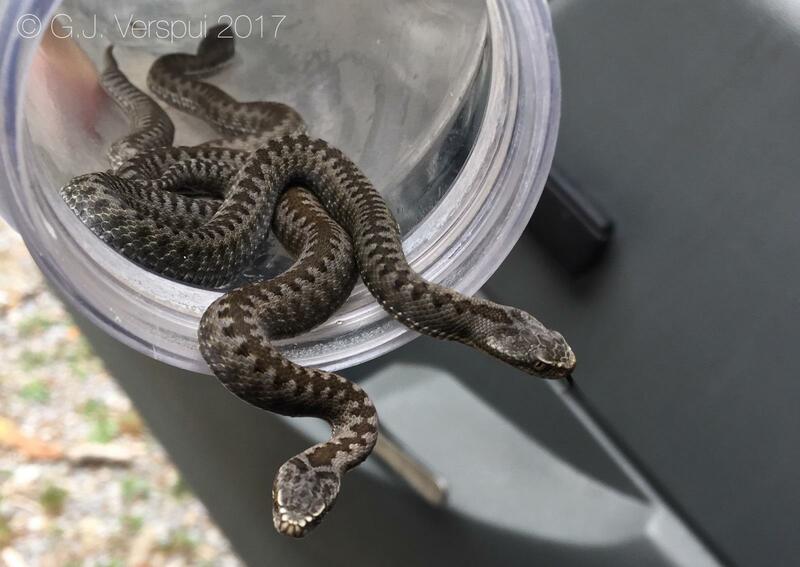 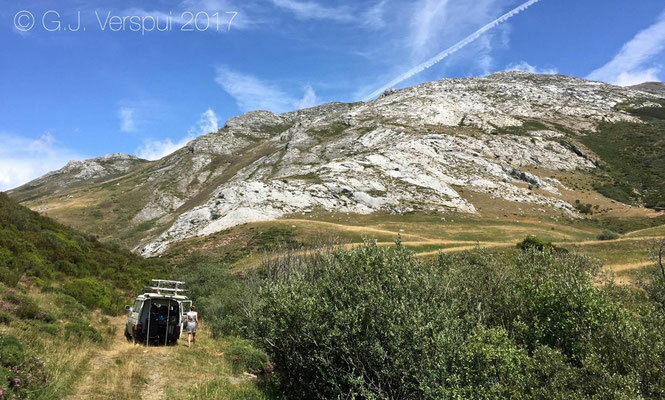 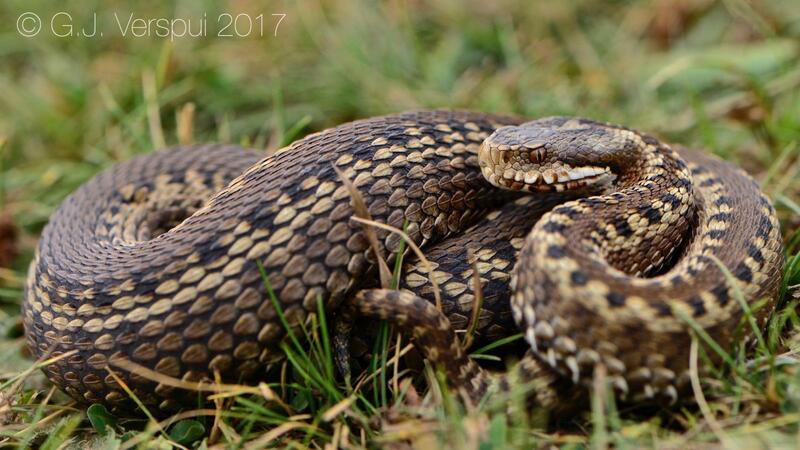 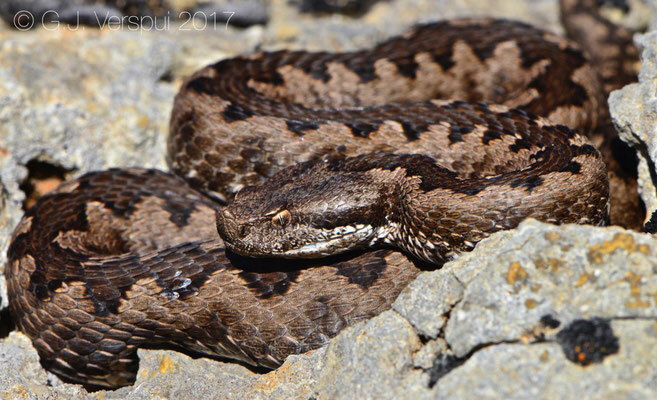 From the Pyrenees we drove to an area close to the city of Burgos, here you can encounter 3 viper species living close to each other: Vipera aspis, Vipera Latastei and Vipera seoanei. In 2012 we saw the Asp Viper already here, so I did not make any efforts for finding them now. 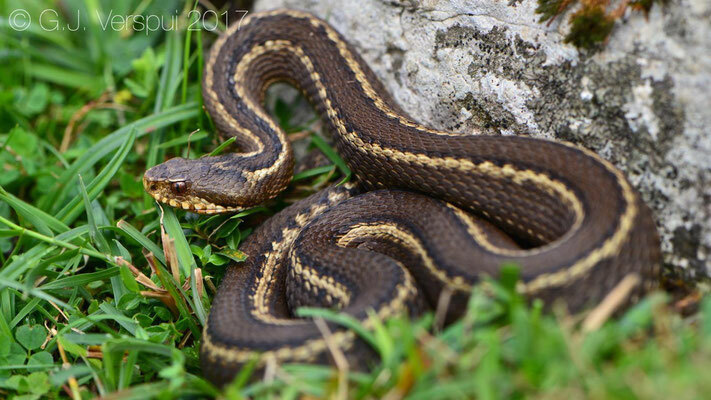 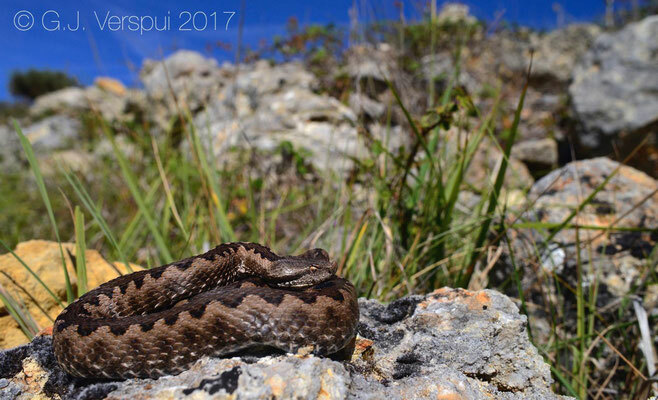 This time we went to an area where Asp Vipers and Lataste's Vipers are known to hybridize. 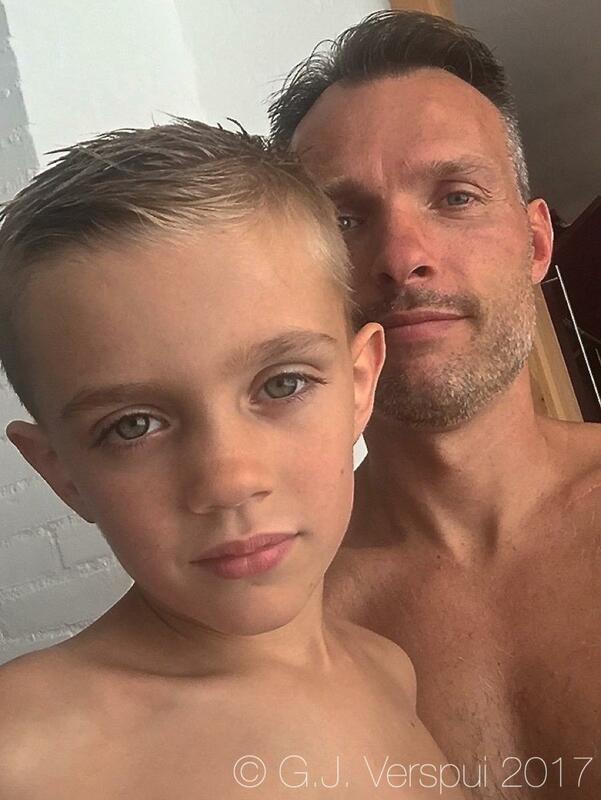 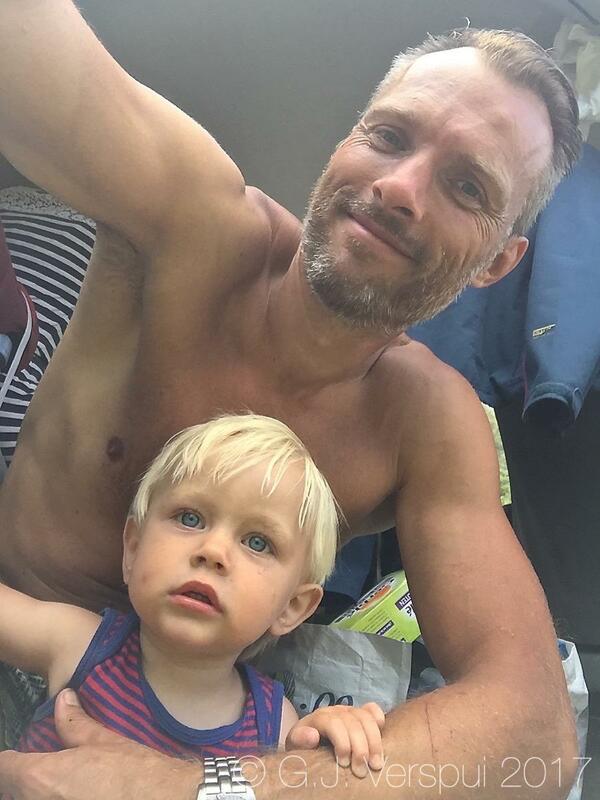 I only used the mornings and late afternoons for searching and the rest of the day was spend with family stuff. 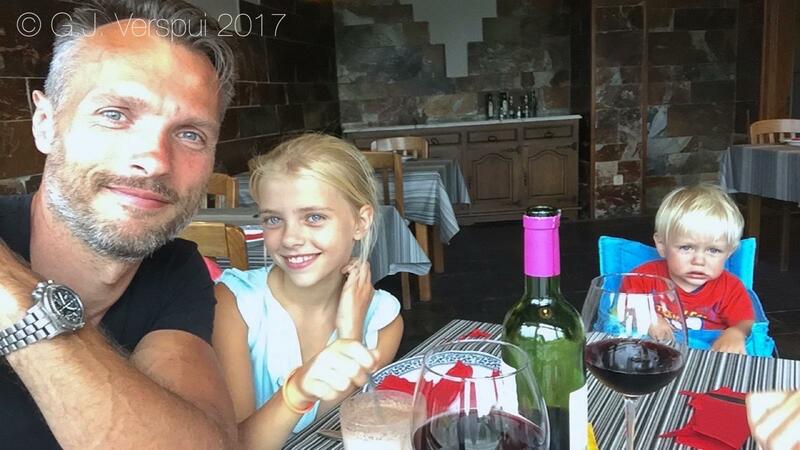 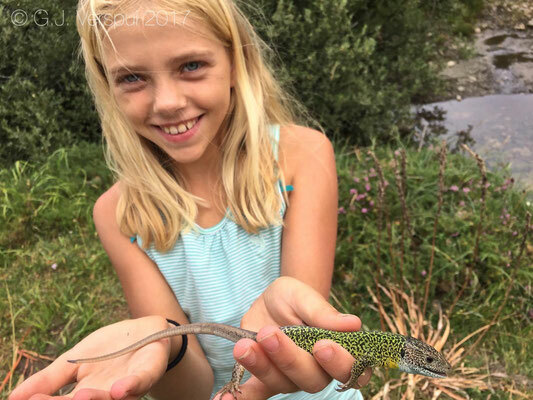 The first day was sunny and hot, so I was not surprised when no viper was found, we did find a nice Schreiber's Green Lizard female while we were doing family stuff like visiting pittoresk villages and eating ice creams. 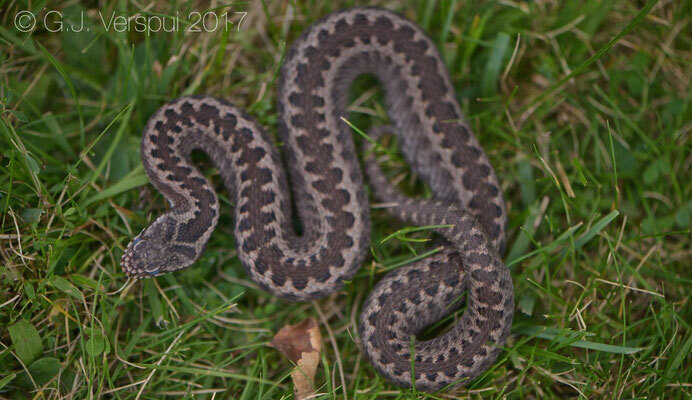 The next day was clouded and cold and it took some hours before the weather turned a bit snaky, but when it did I found 2 vipers that had both characteristics of Asp Vipers and Lataste's Vipers, one of them had a very bright color, but it did not feel and look very healthy, the other one was very big. 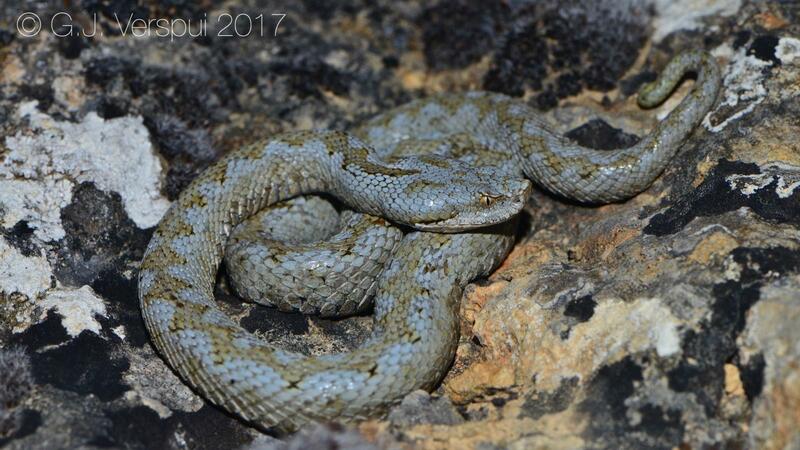 Next thing on the agenda was trying to find Lataste's Viper, in spring 2012 we found 3 in an area here, but in summer 2014 I could not find even one. 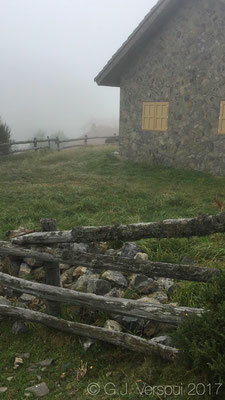 I wanted to reach first thing in the morning so we drove to that spot and slept there. 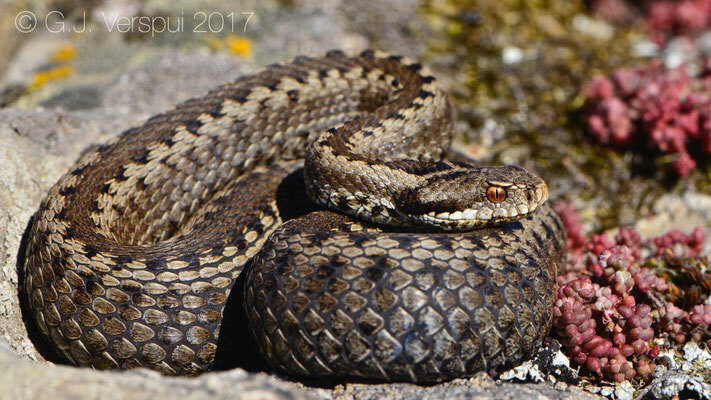 Around 07:30 I started and at 08:23 I found one and exactly 1 hour later a second one, after photographing and releasing the vipers we drove North to the Embalse del Ebro, a big lake with lots of good Seoanei Viper habitat around it. 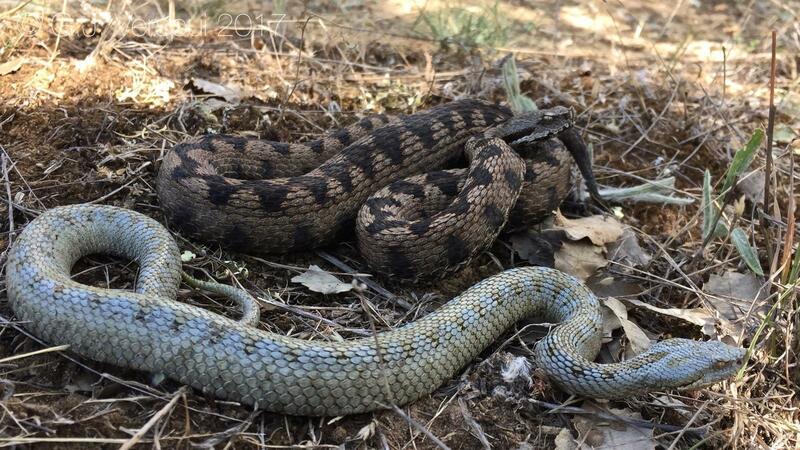 At Embalse del ebro we found ourselves a campsite and in the evening and the next morning I searched for vipers again and 5 females were found. 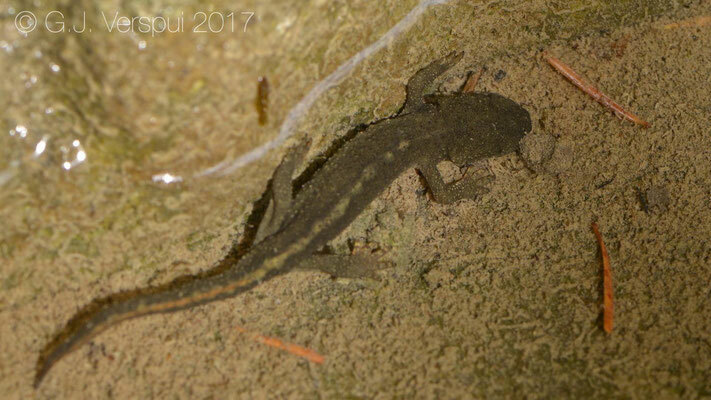 Close to the lake is also an old washing building with some amphibian species, always fun to check that spot out! We stayed here only one night and moved further west from here. 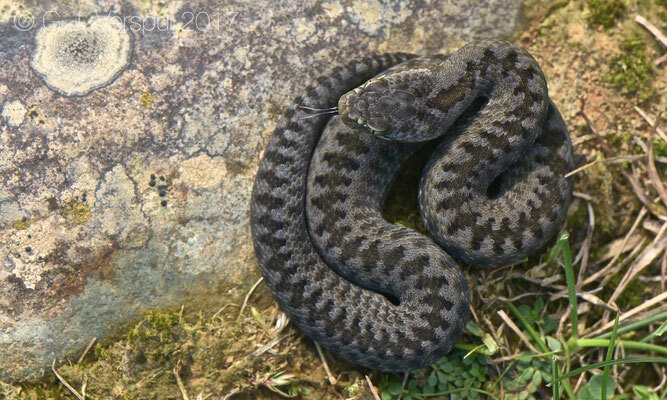 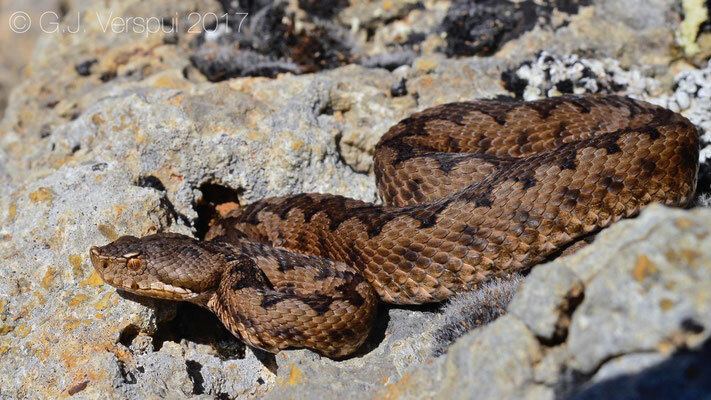 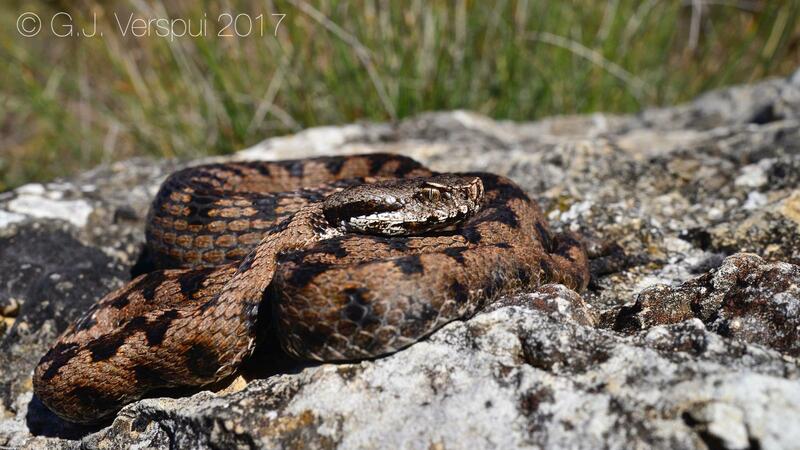 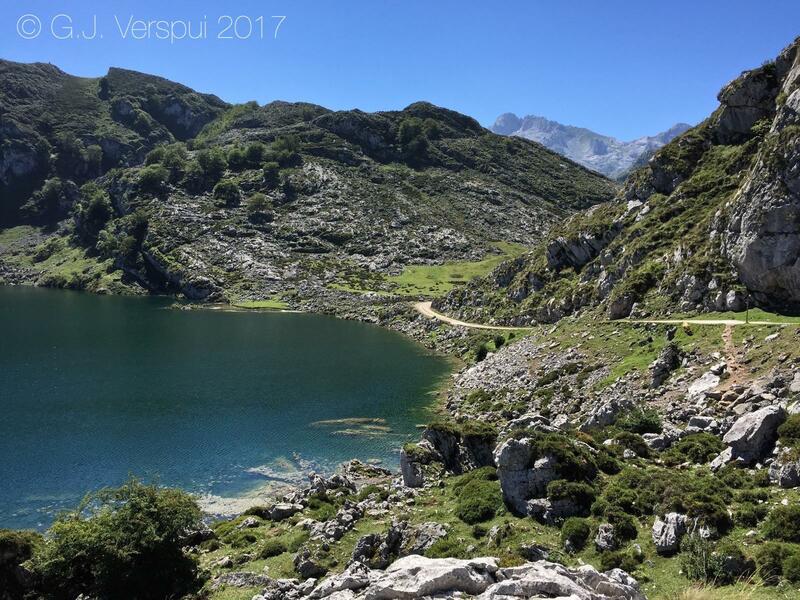 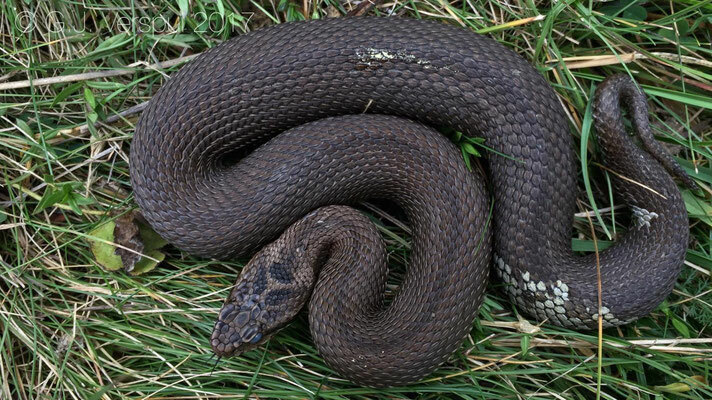 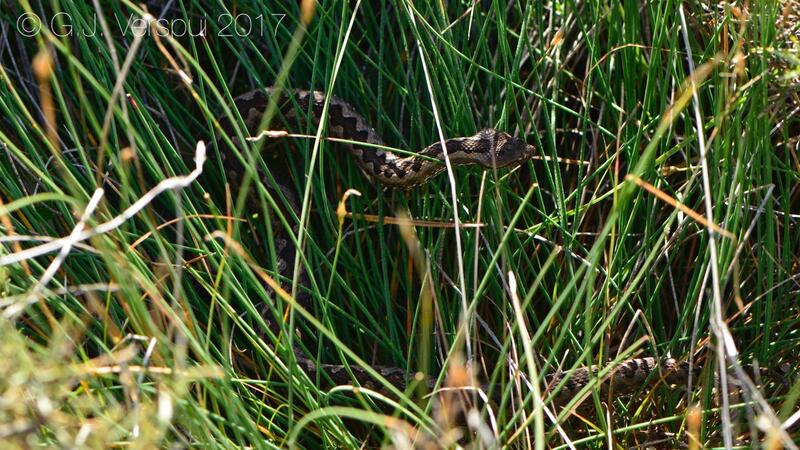 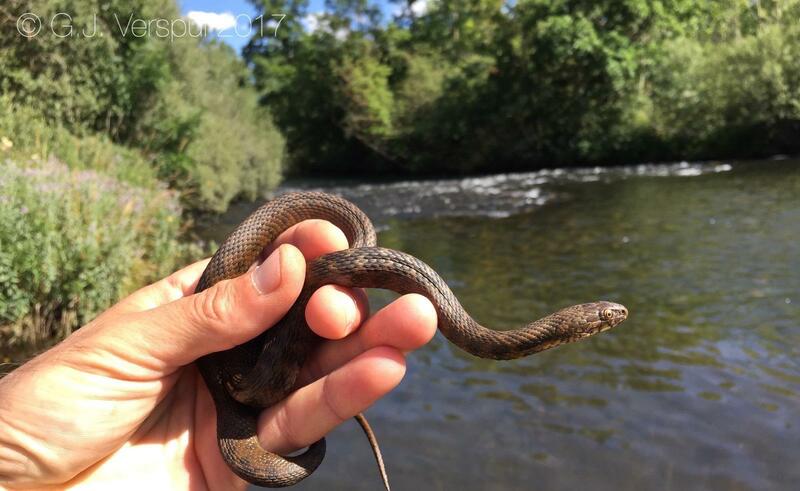 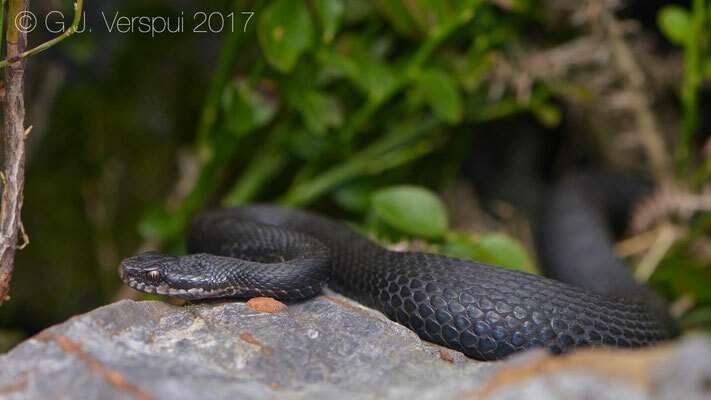 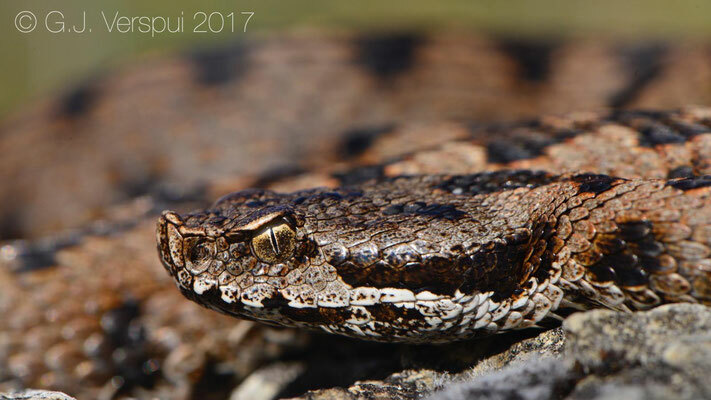 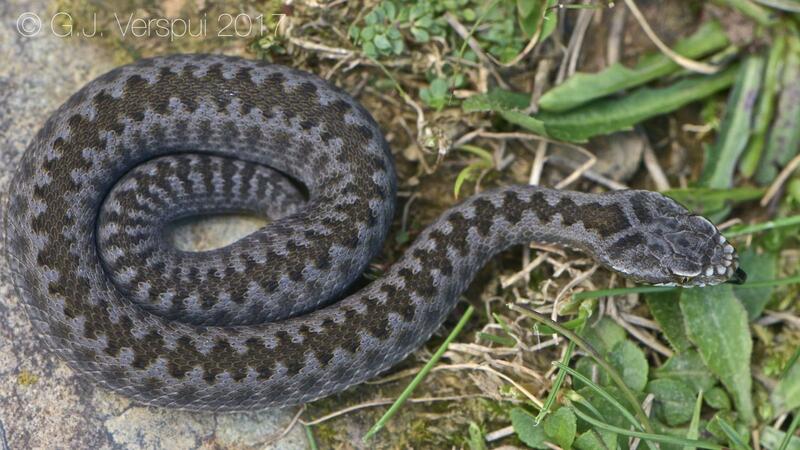 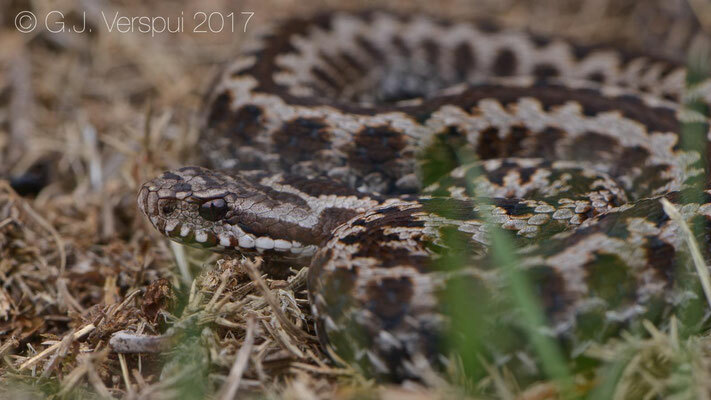 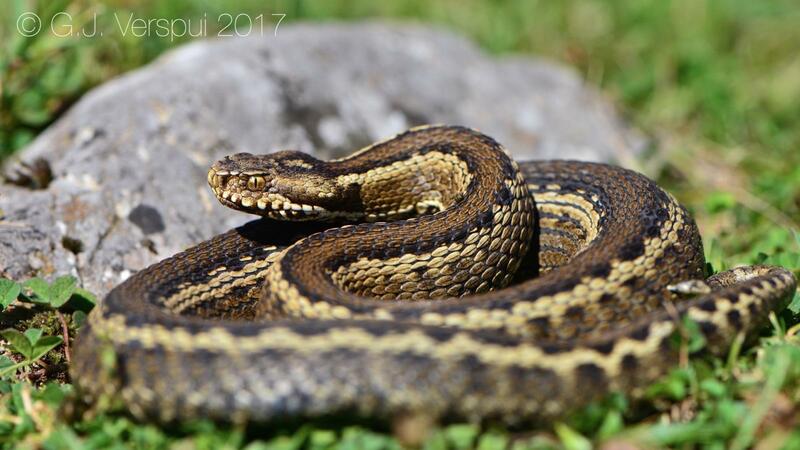 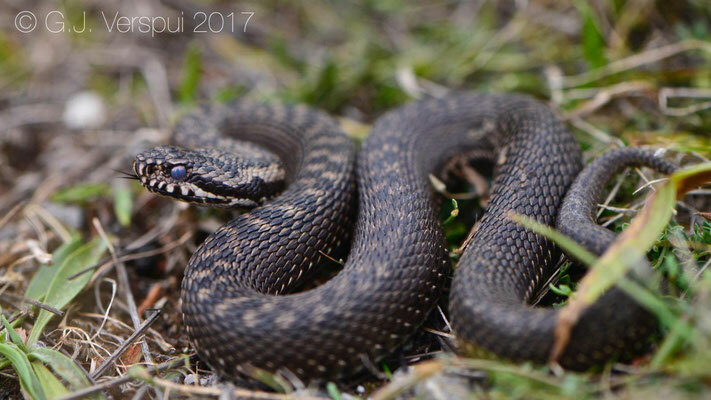 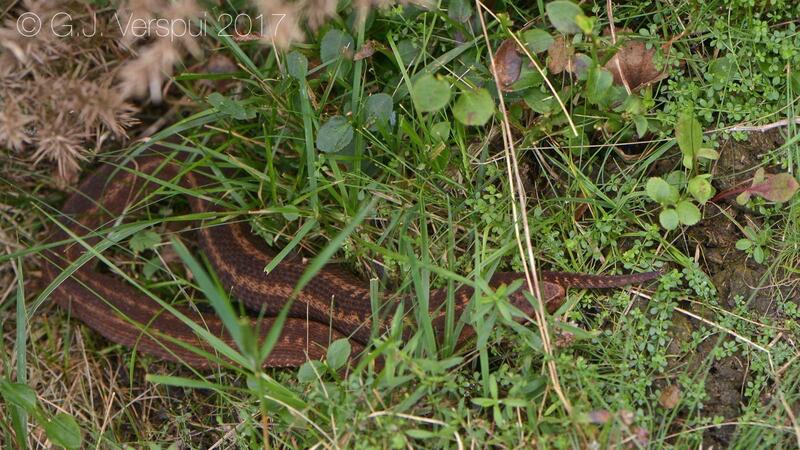 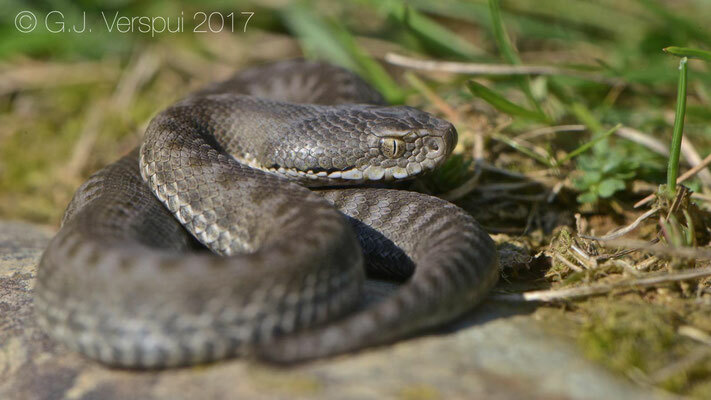 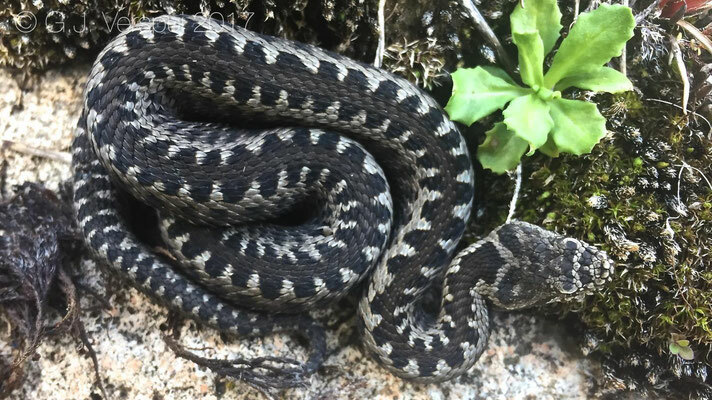 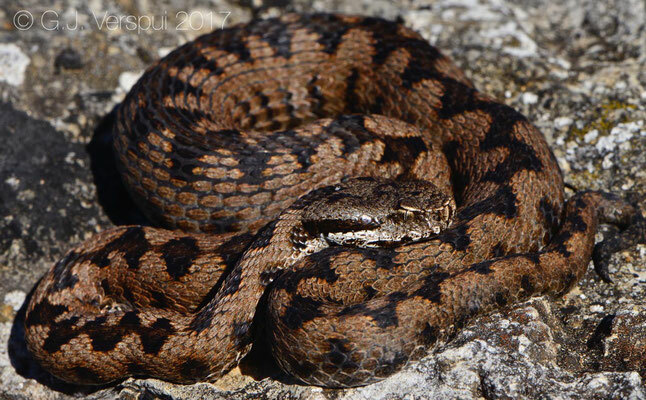 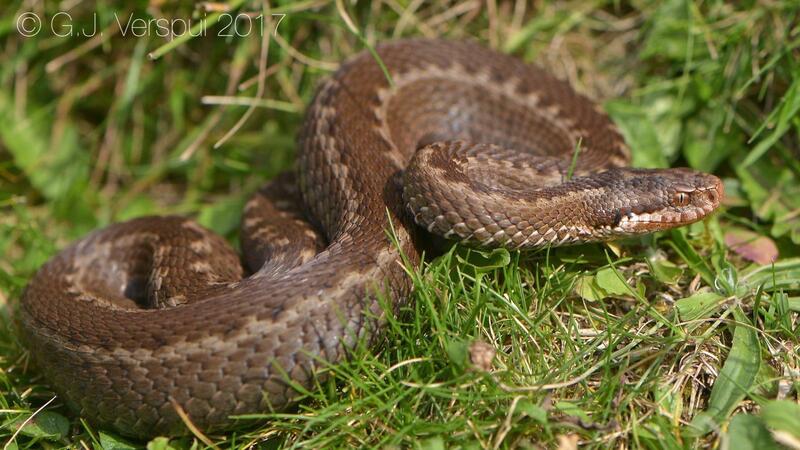 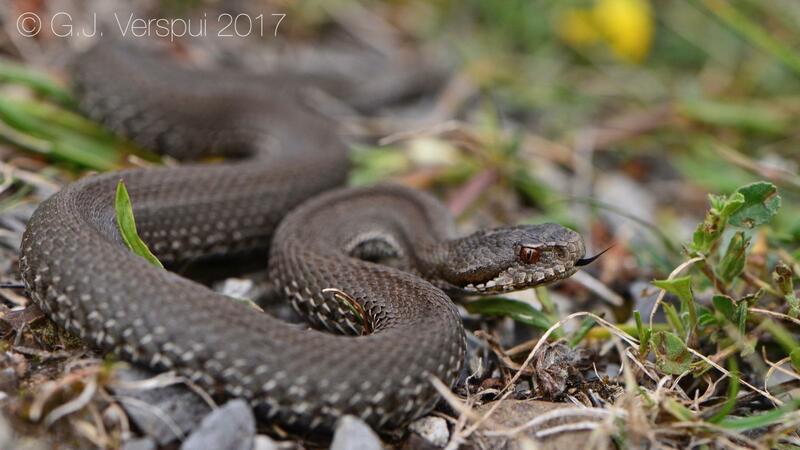 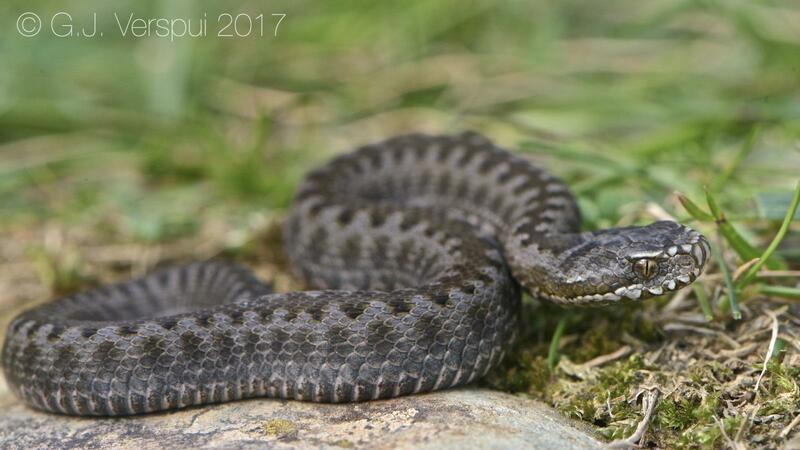 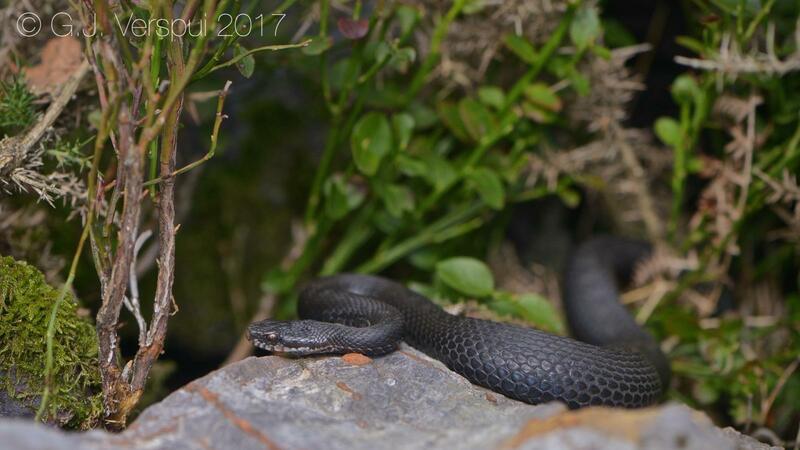 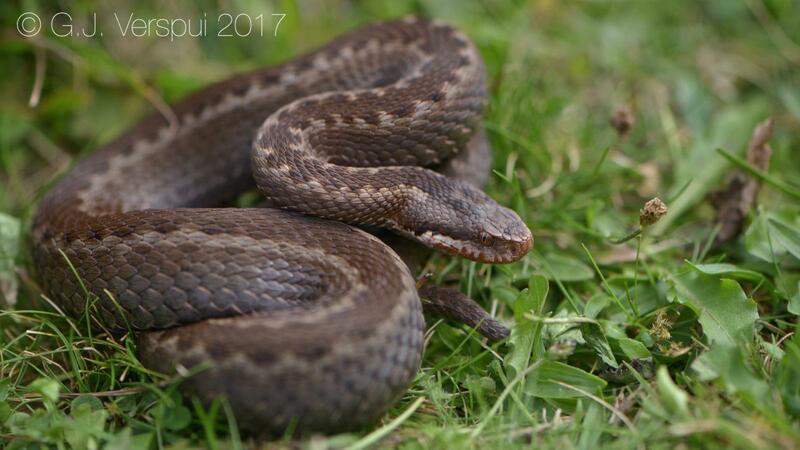 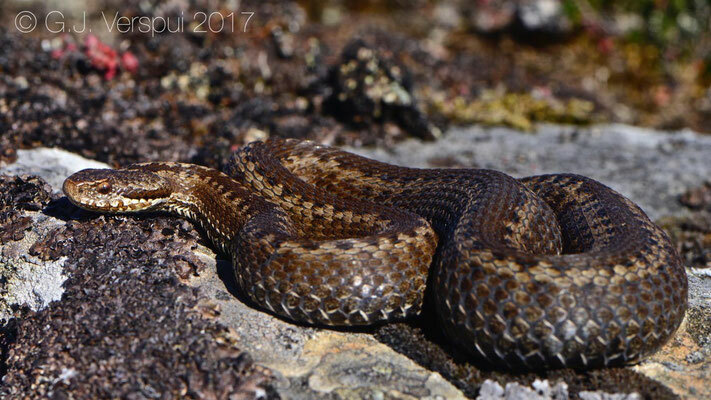 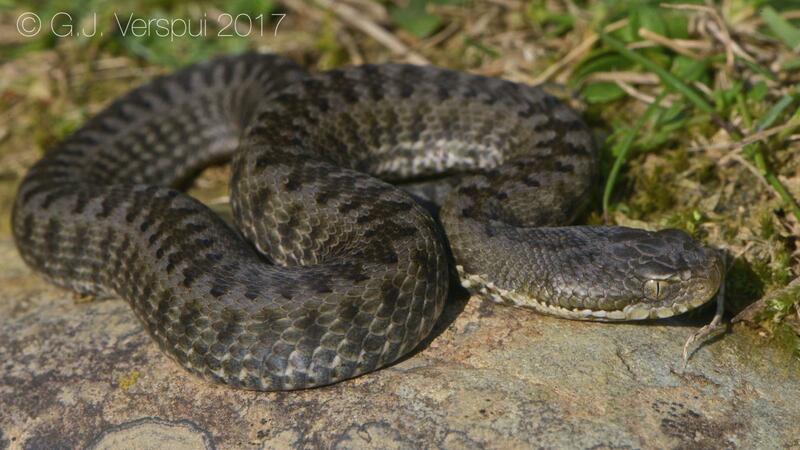 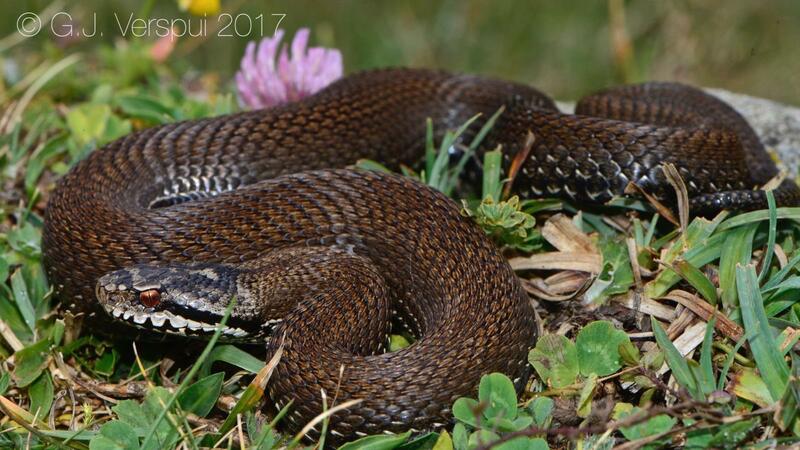 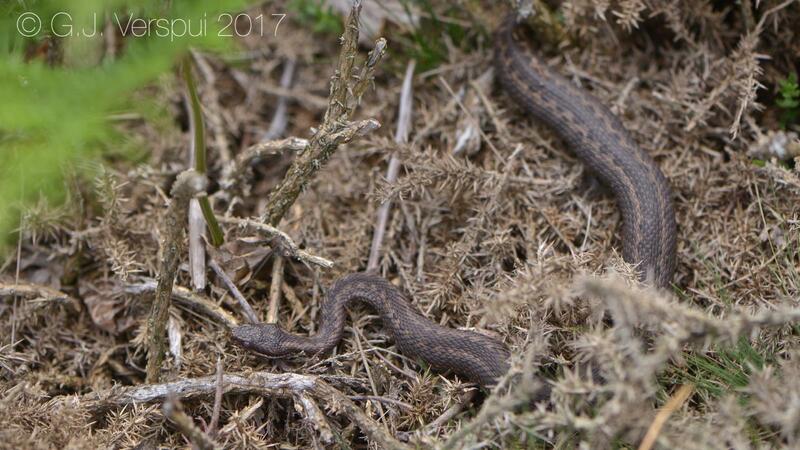 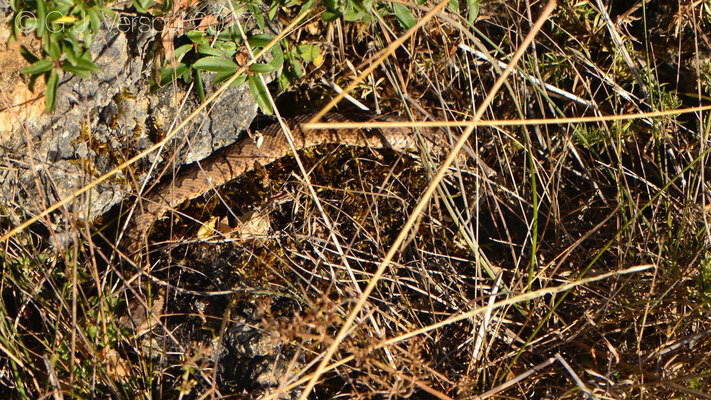 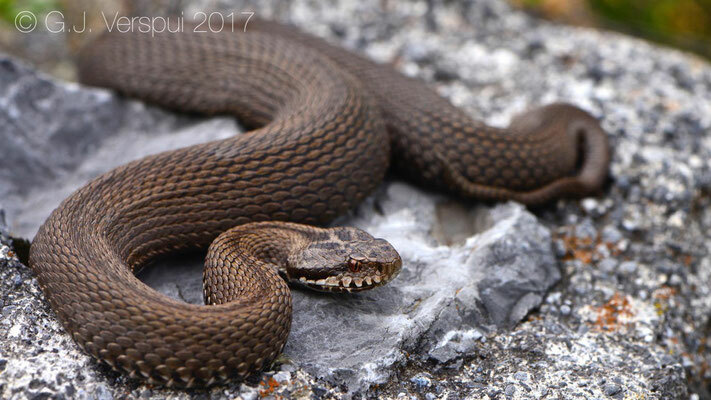 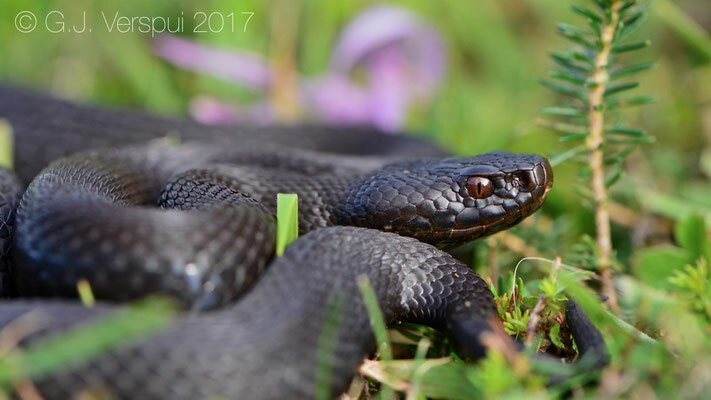 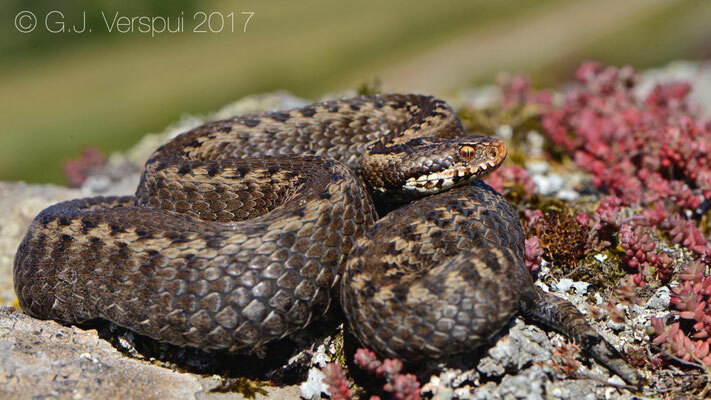 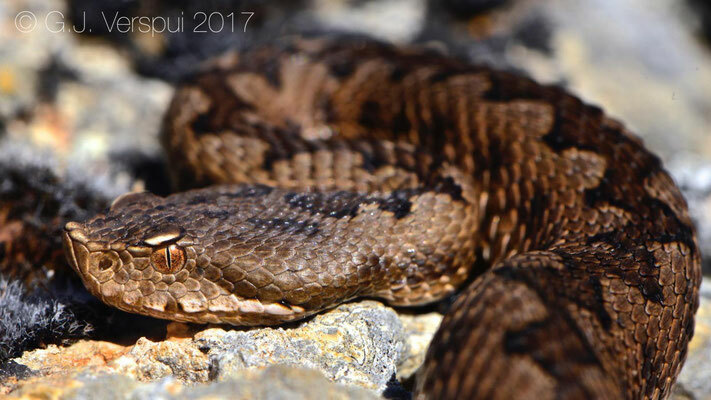 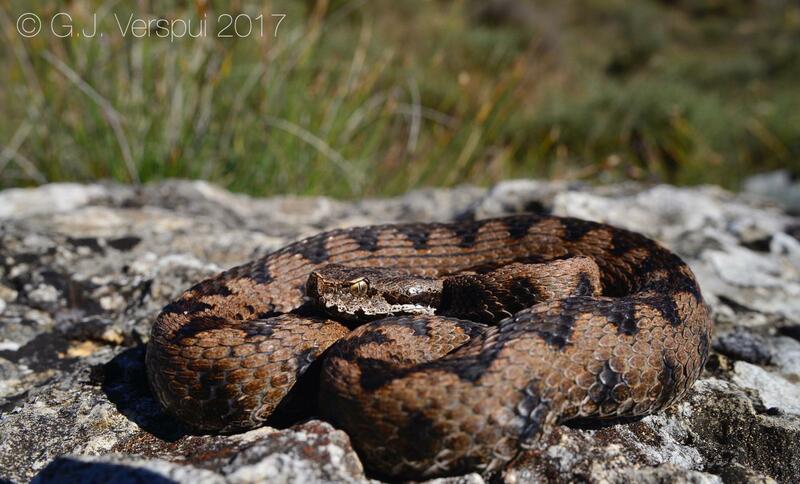 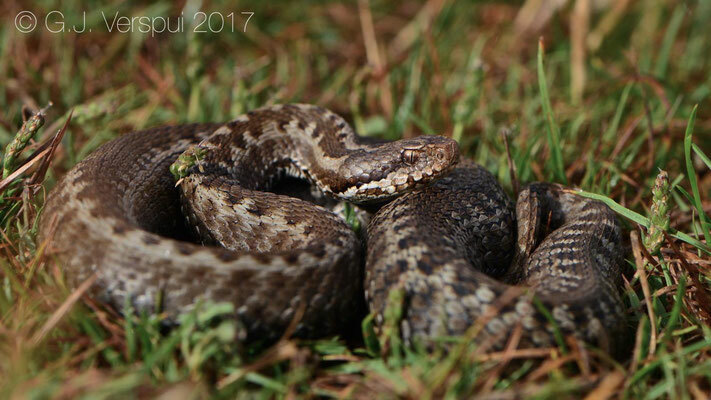 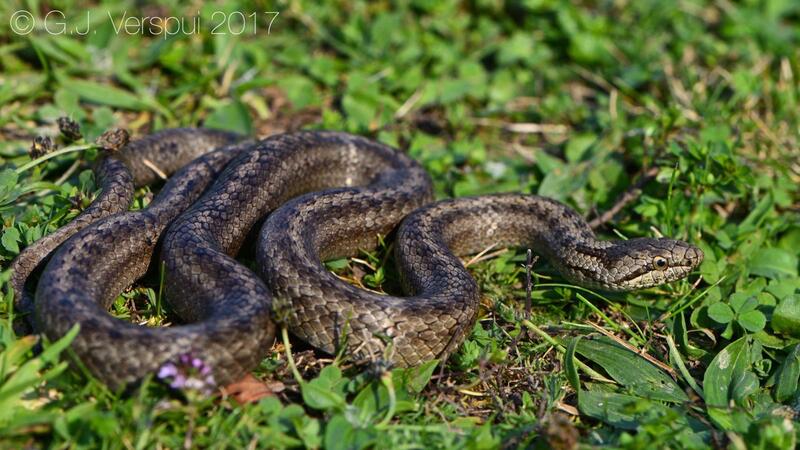 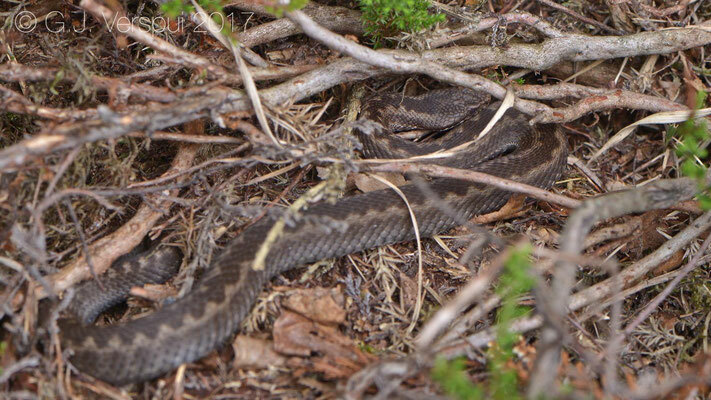 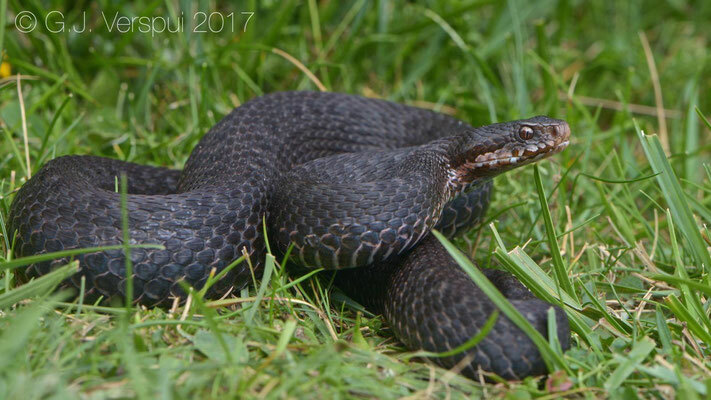 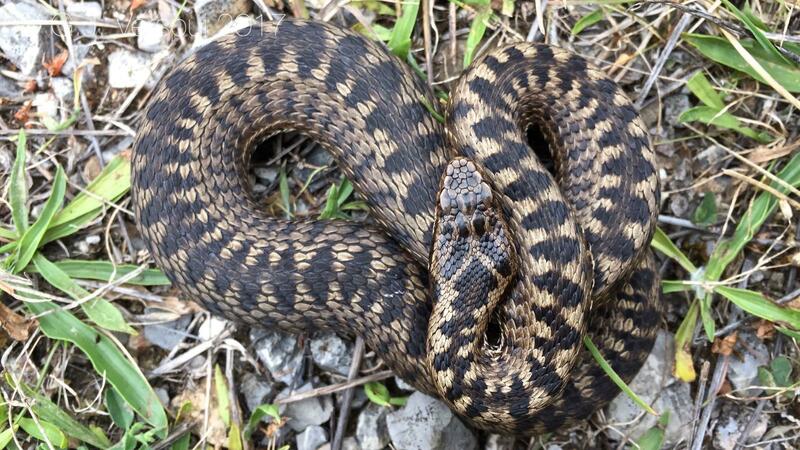 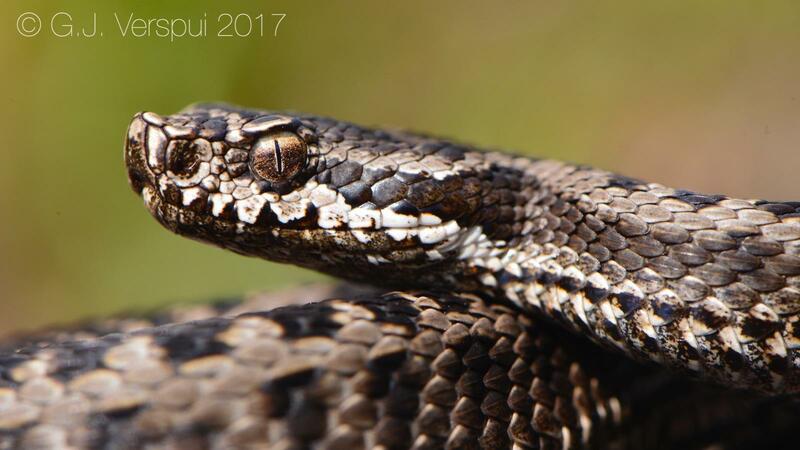 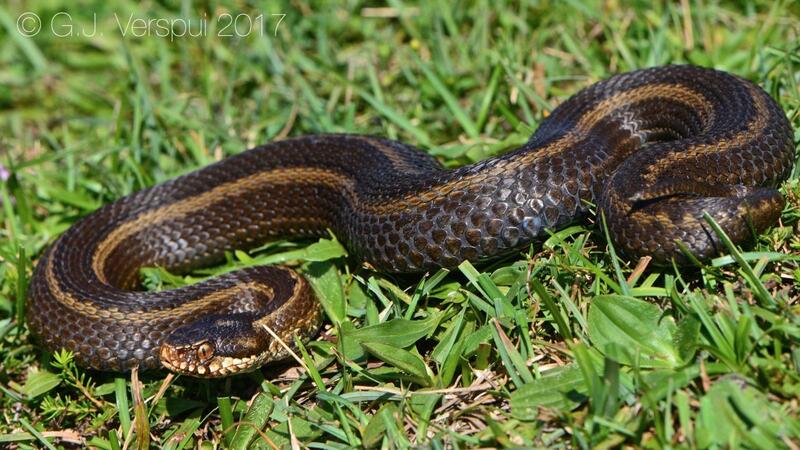 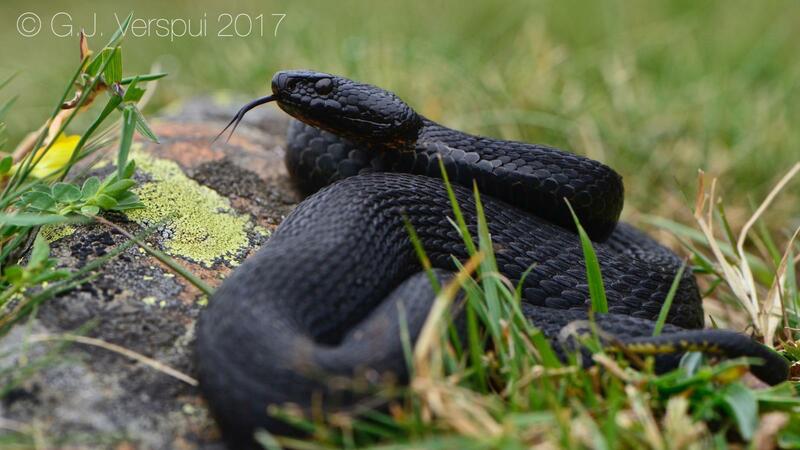 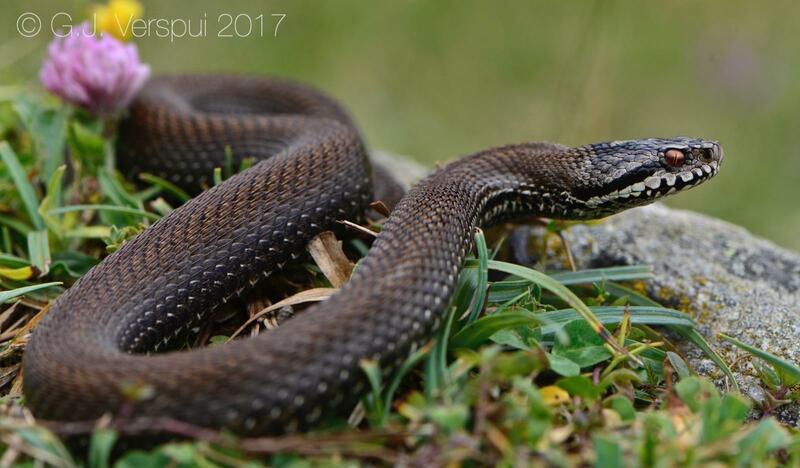 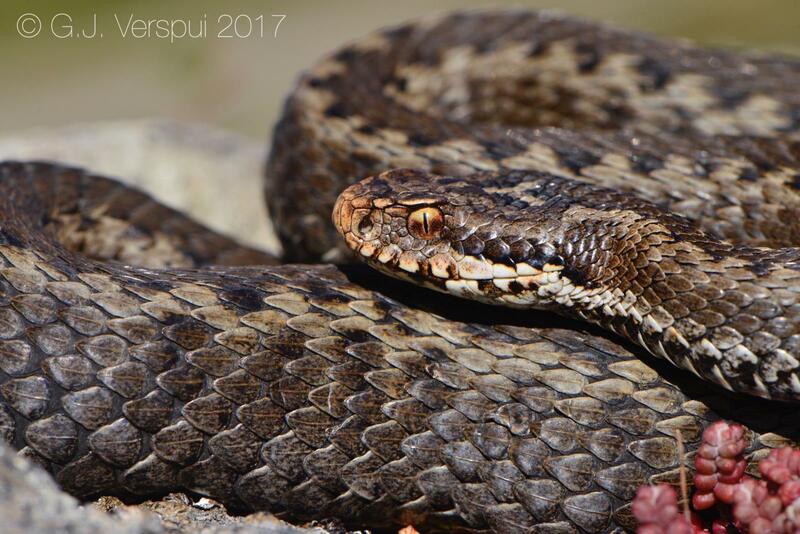 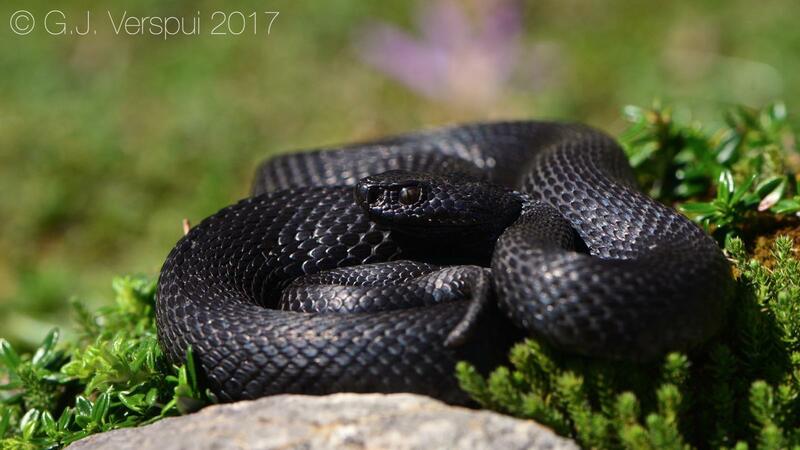 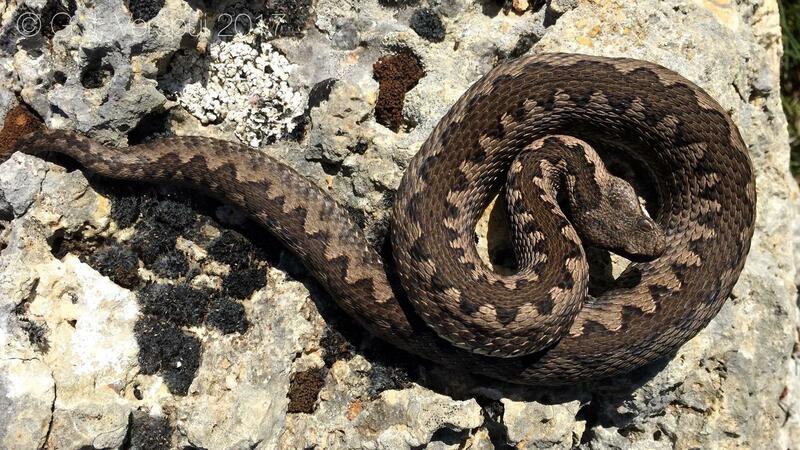 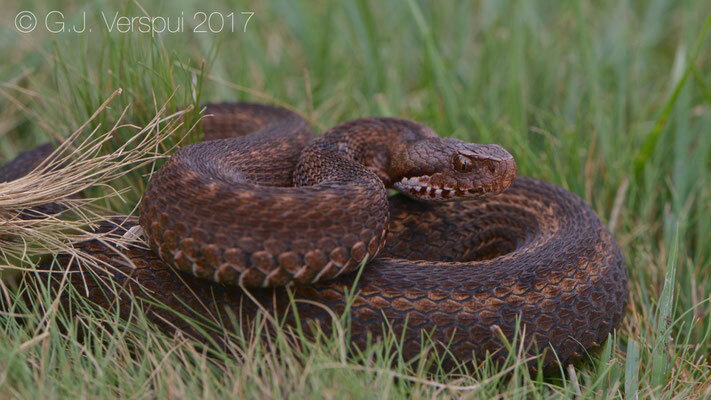 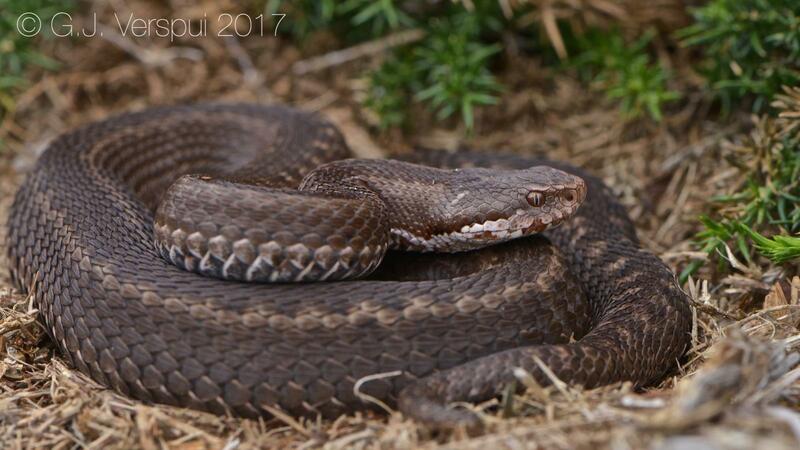 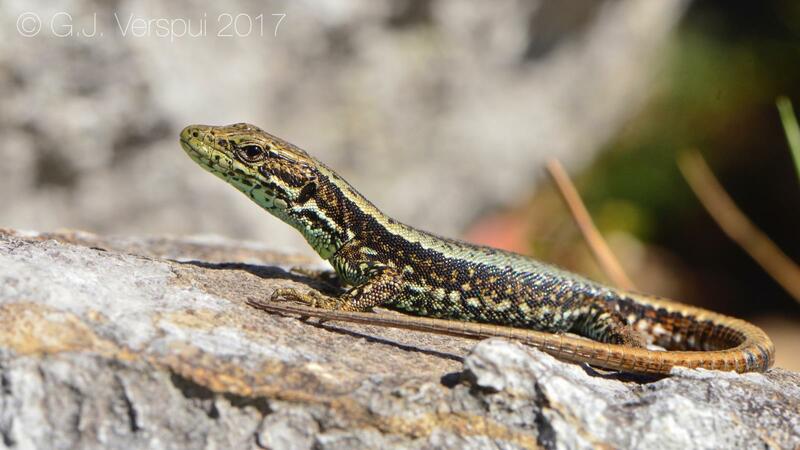 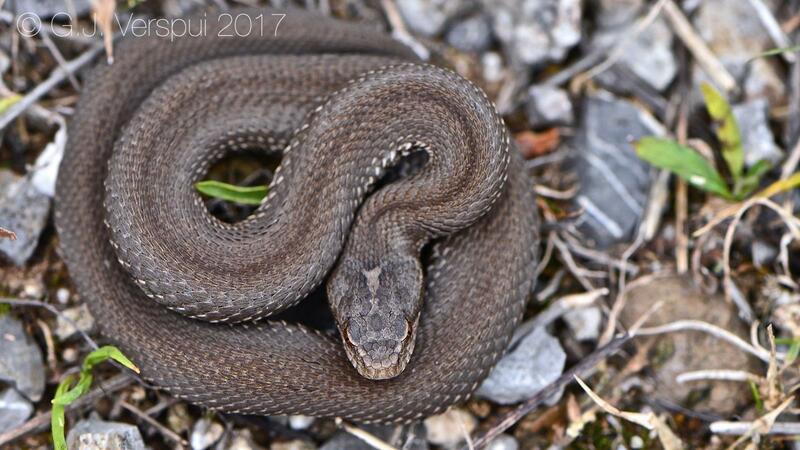 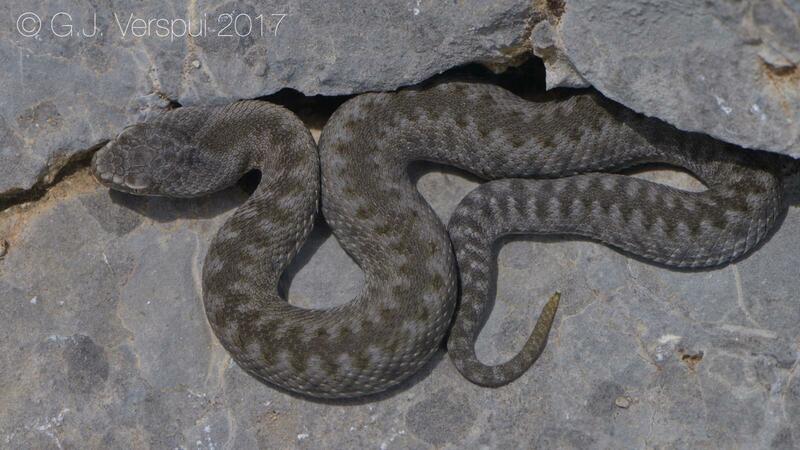 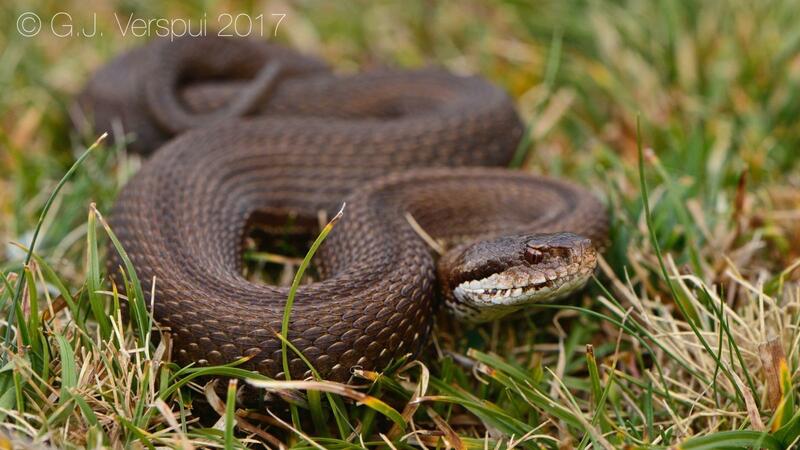 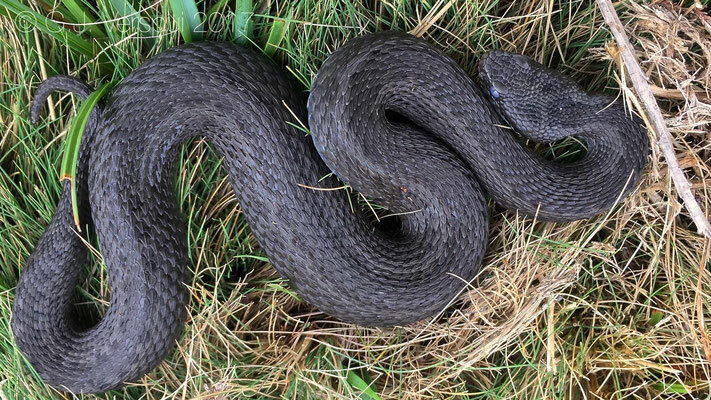 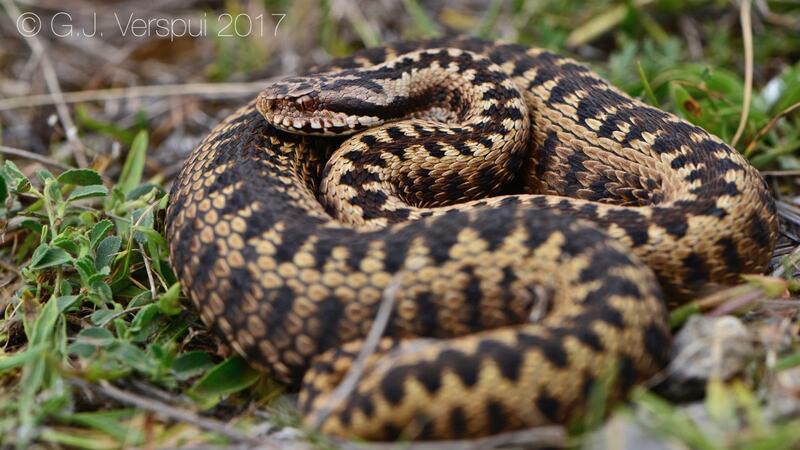 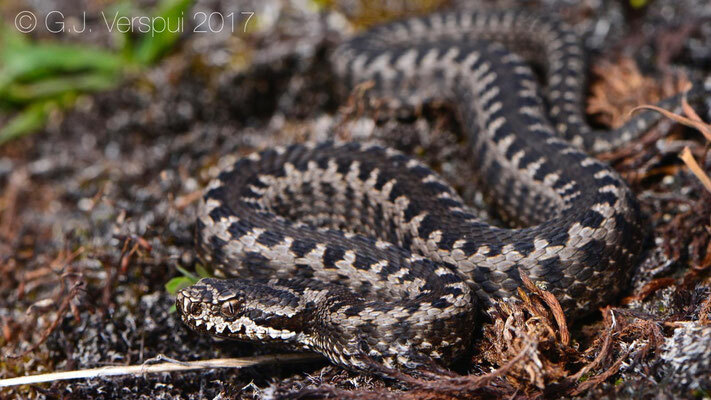 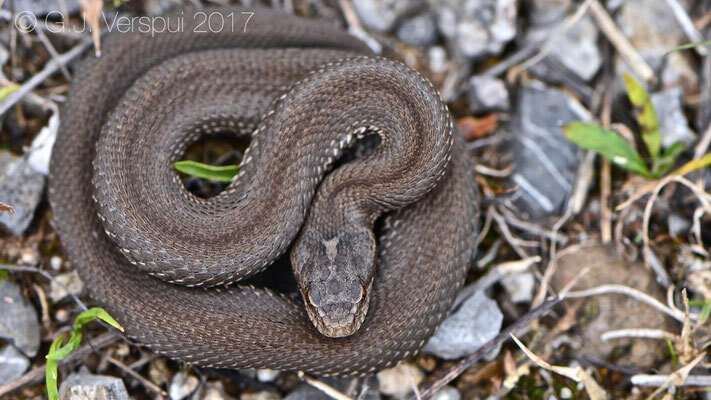 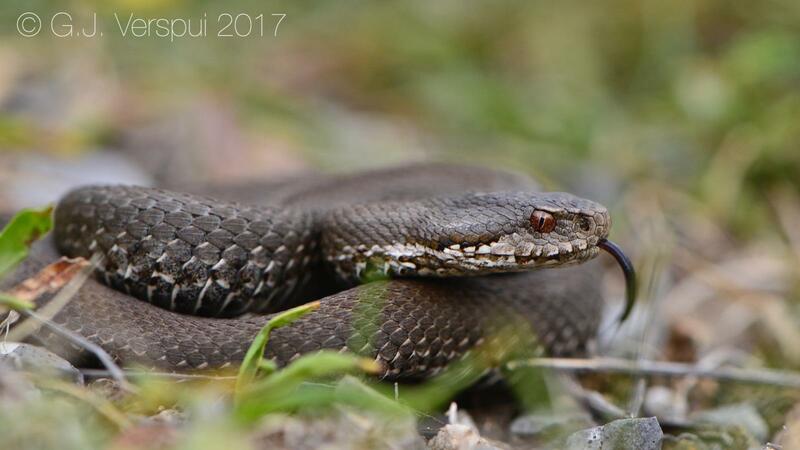 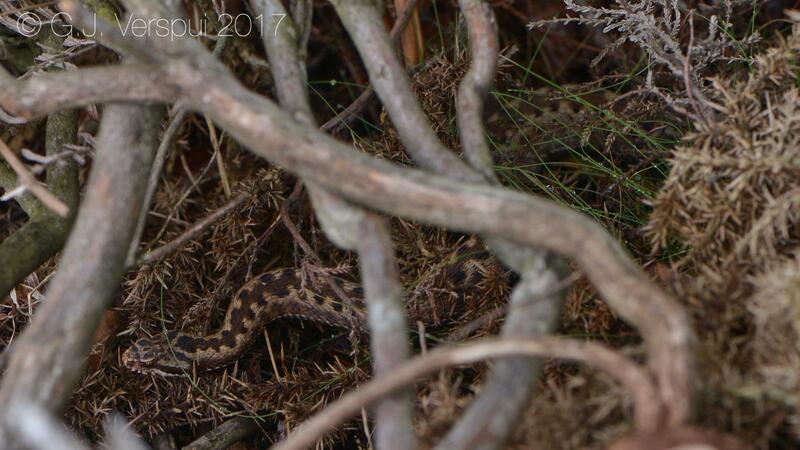 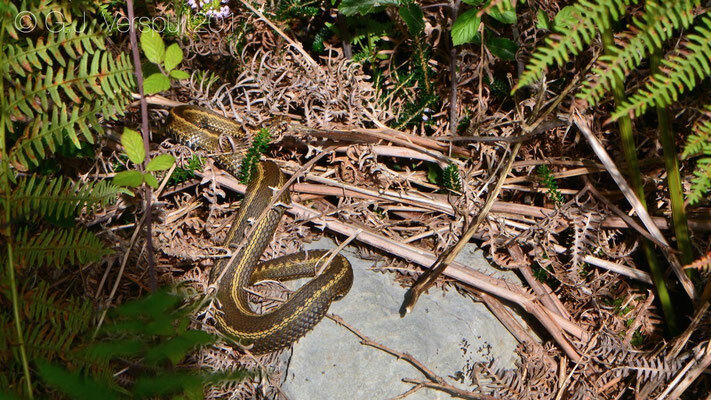 Next couple of days we were at several places at Montaña Palentina and the south side of the Picos de Europa, here you could find the Vipera seoanei cantabrica, but the hot weather that made sure we could swim every day was also the reason we did not see a lot of reptile activity. 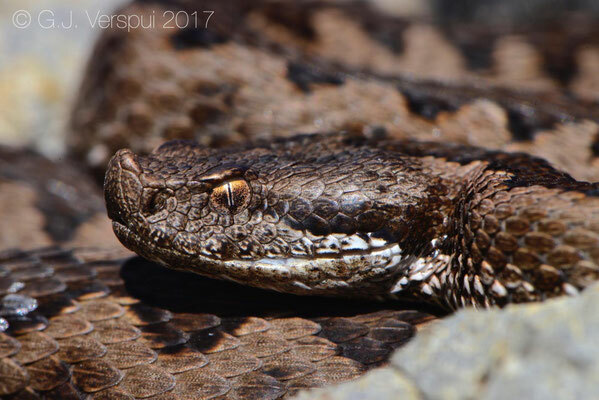 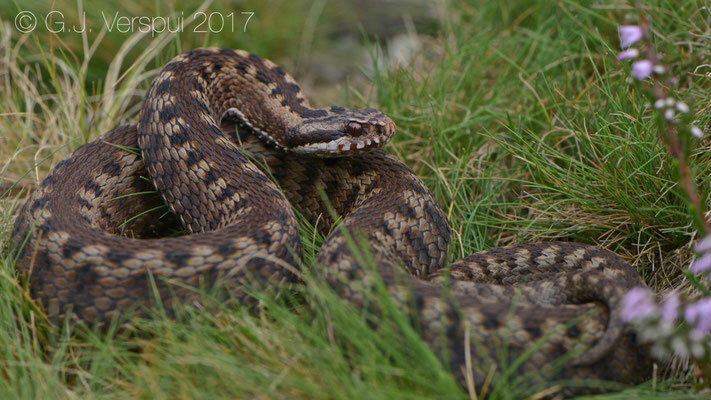 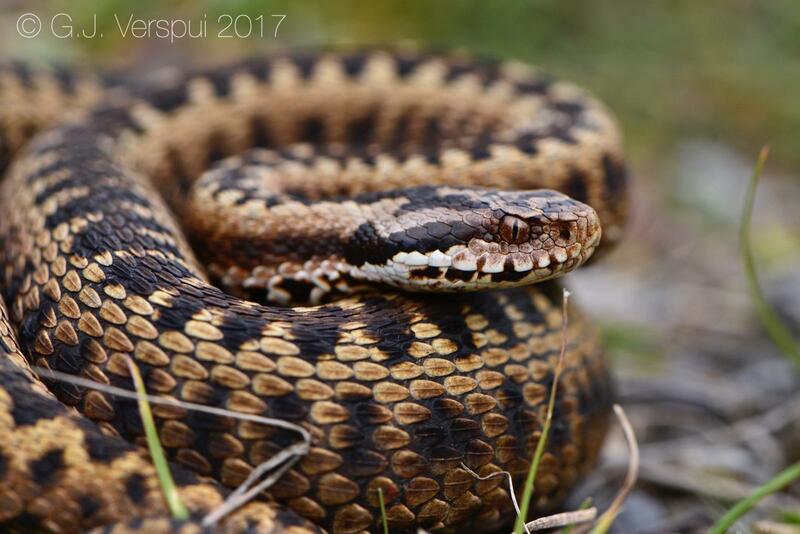 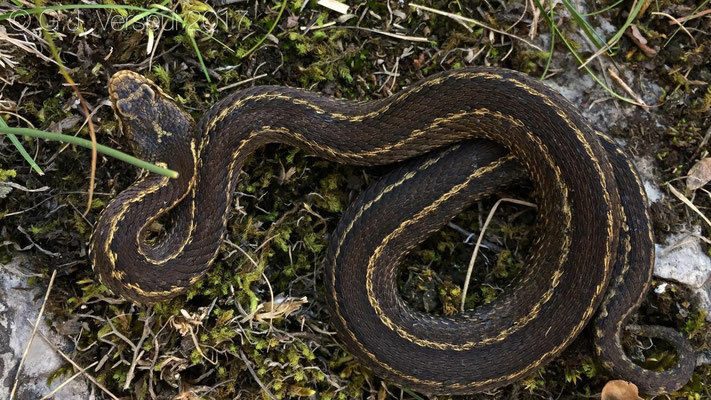 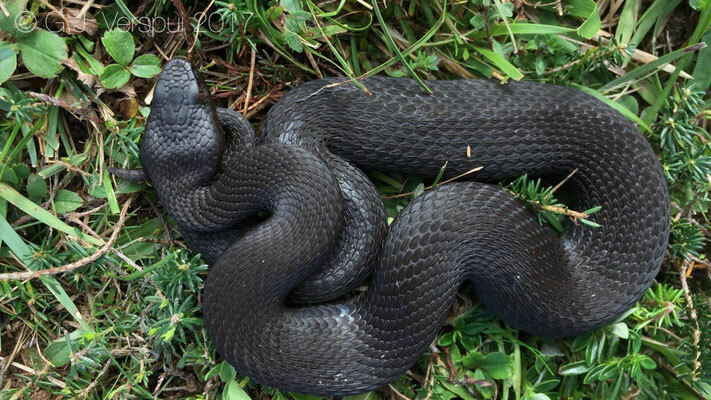 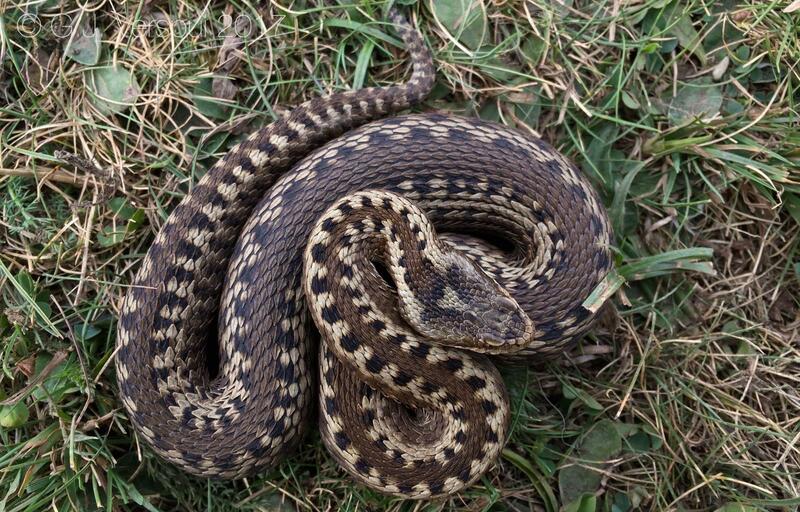 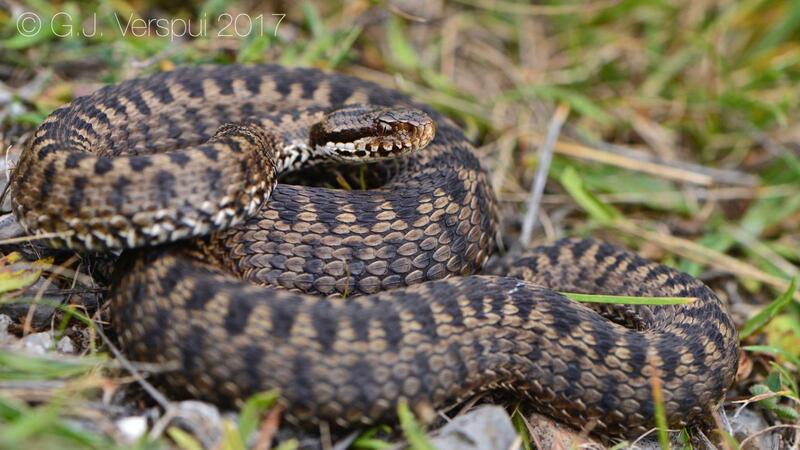 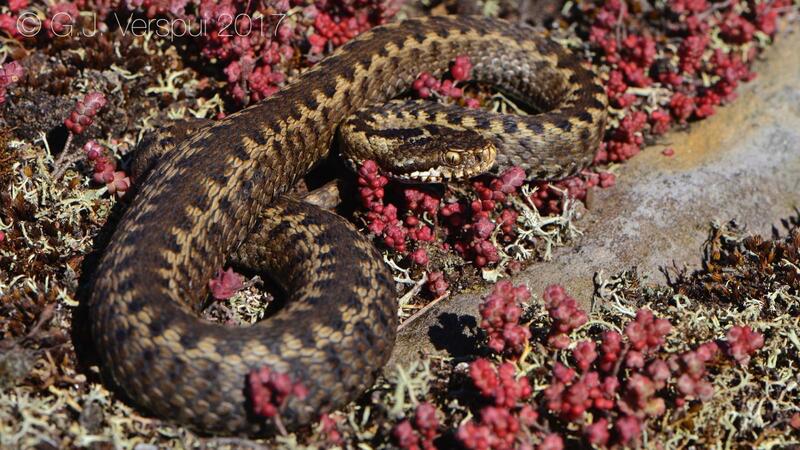 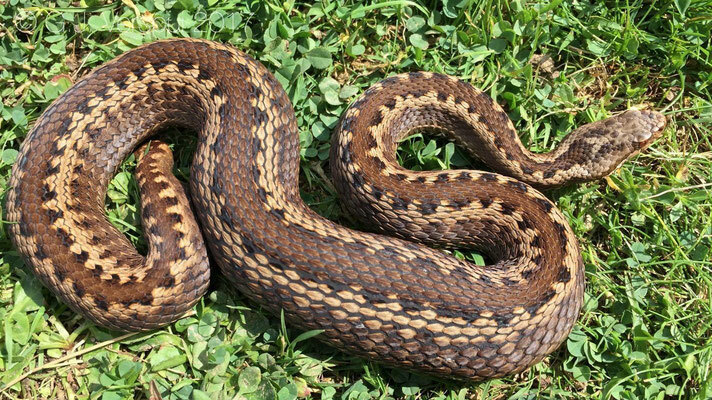 The vipers here are always more difficult to find, because it is much hotter and because of this they might not be as active as the ones found in colder and wetter areas more north. 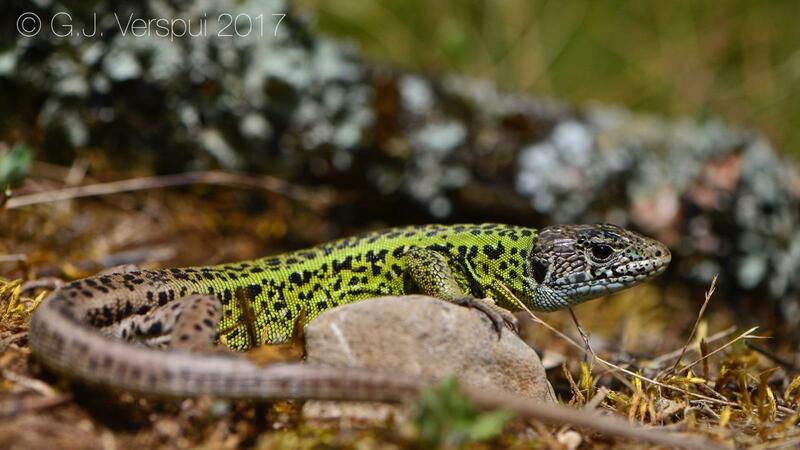 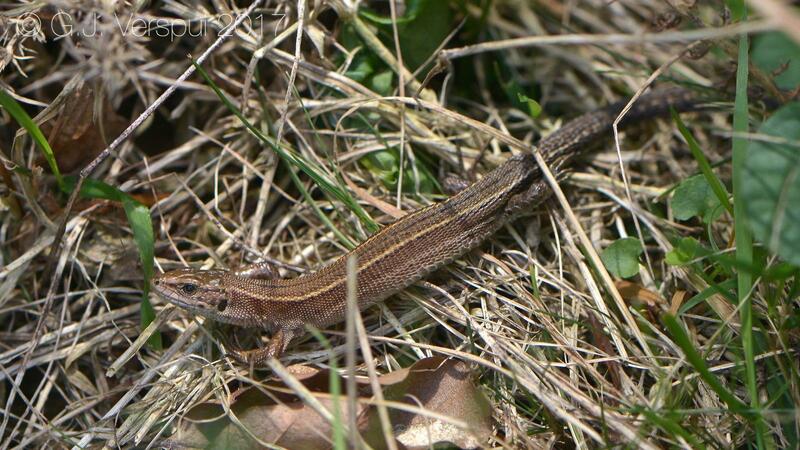 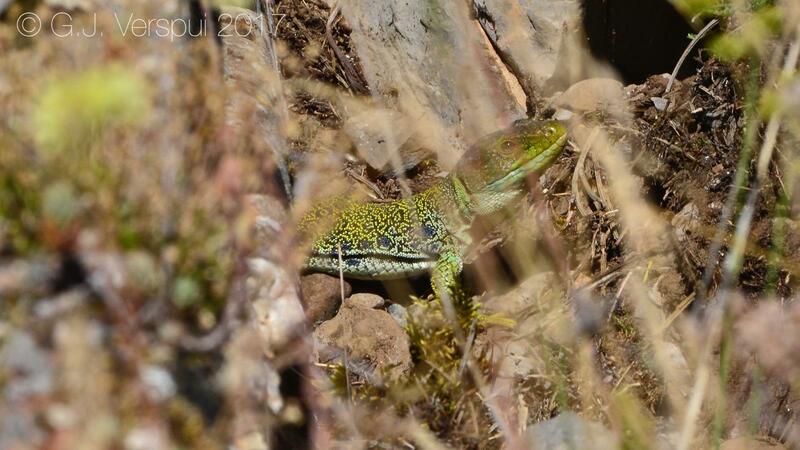 The species we did see were Schreiber's Green Lizard, Ocelated Lizard and some Spanish Wall Lizards. 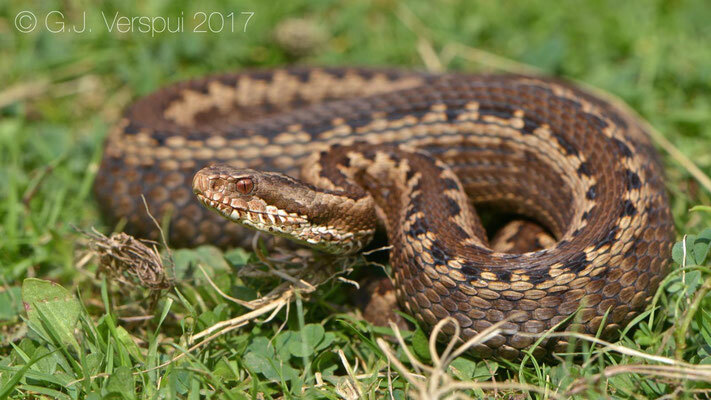 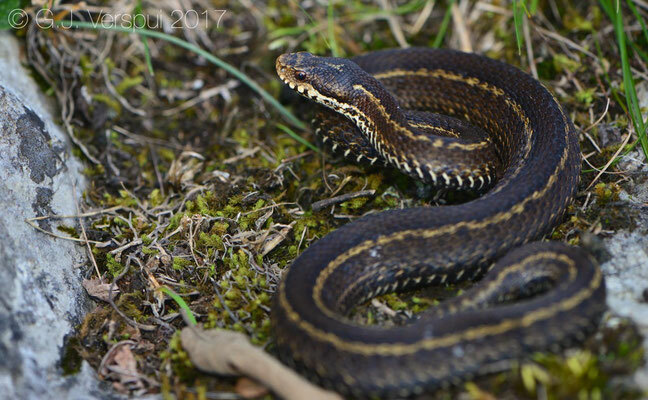 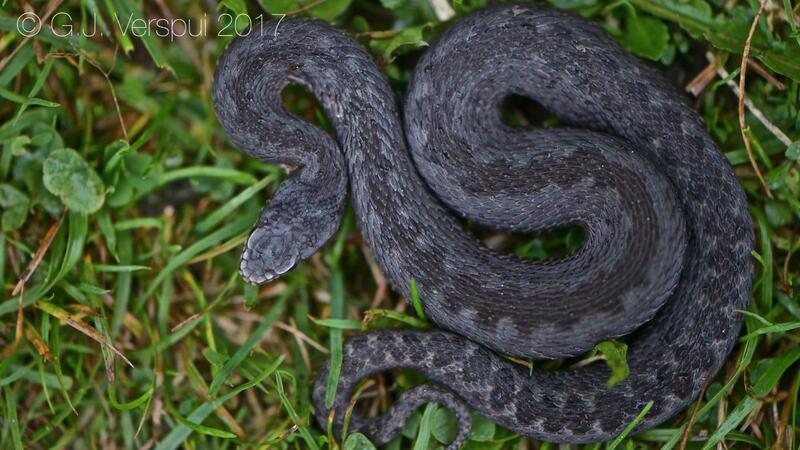 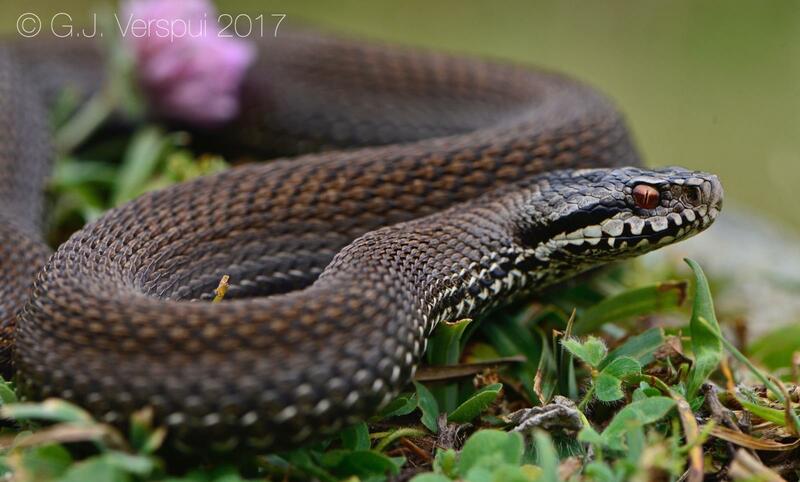 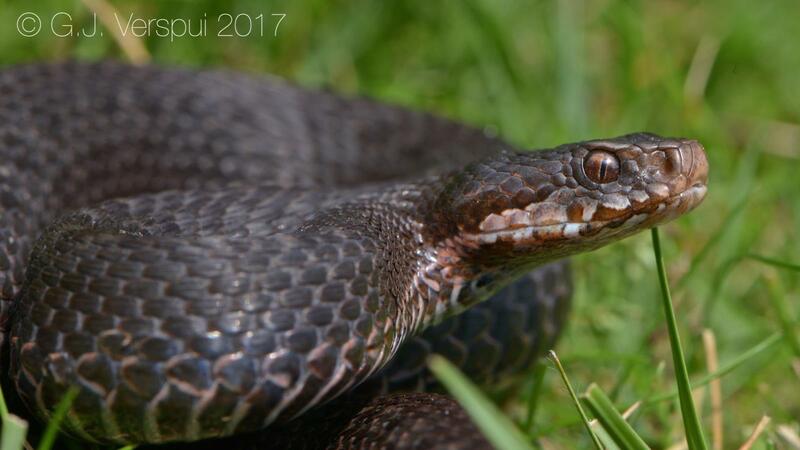 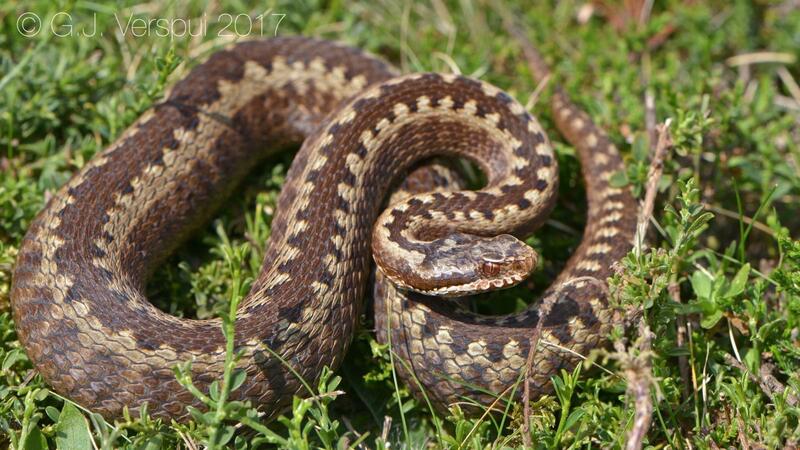 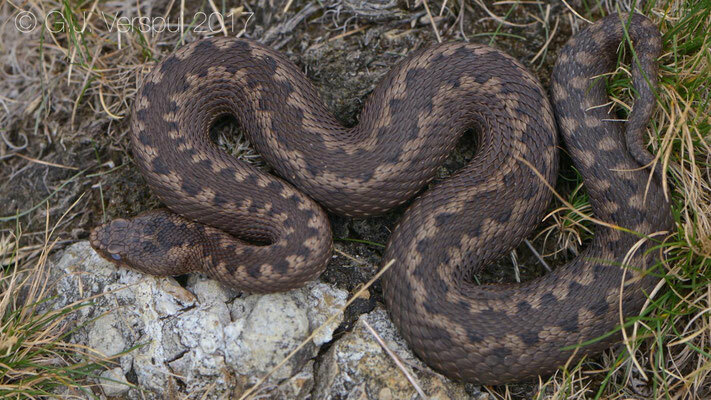 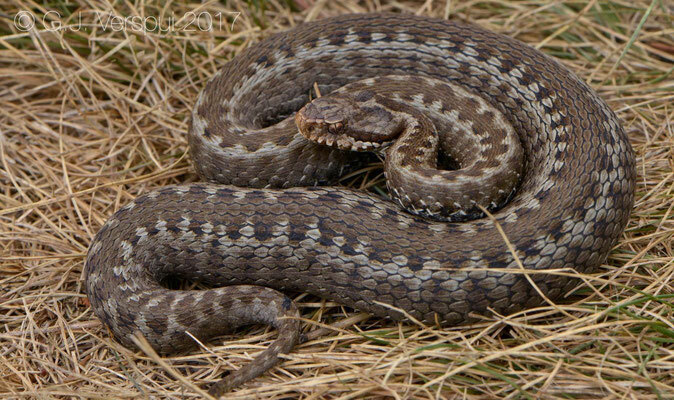 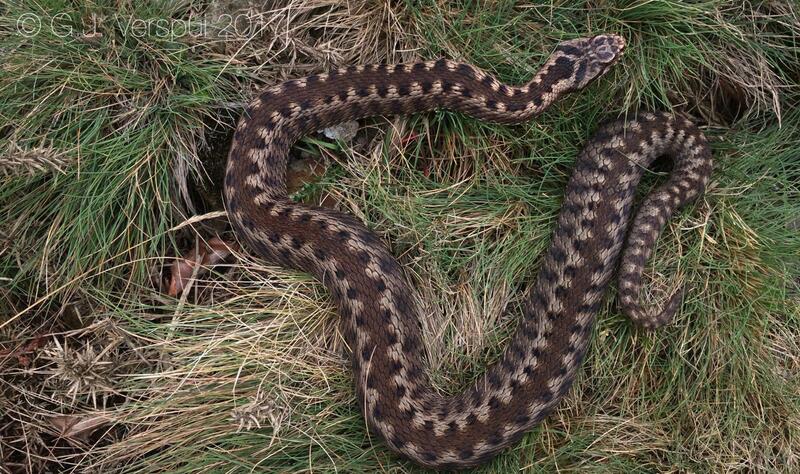 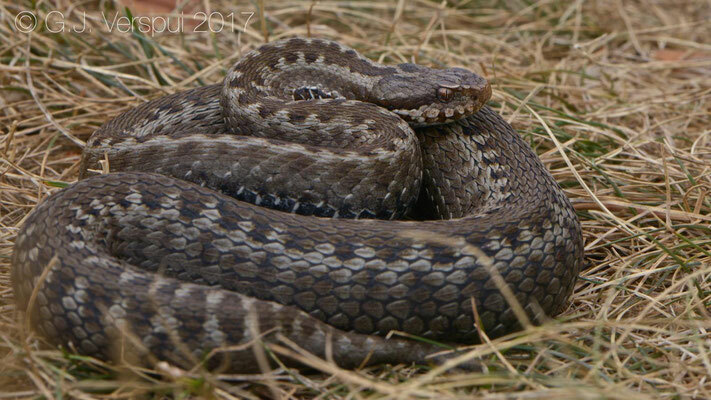 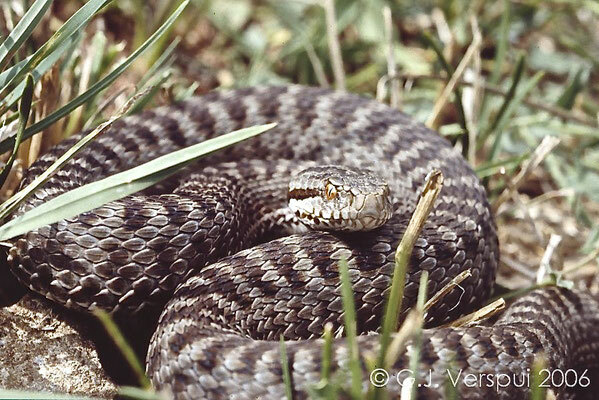 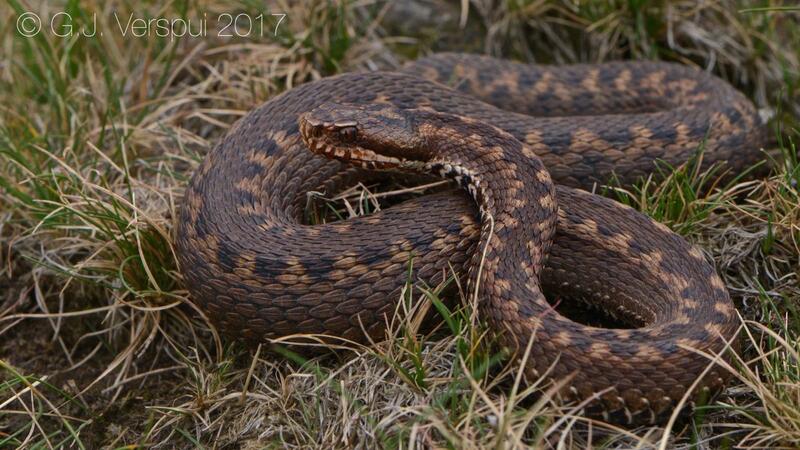 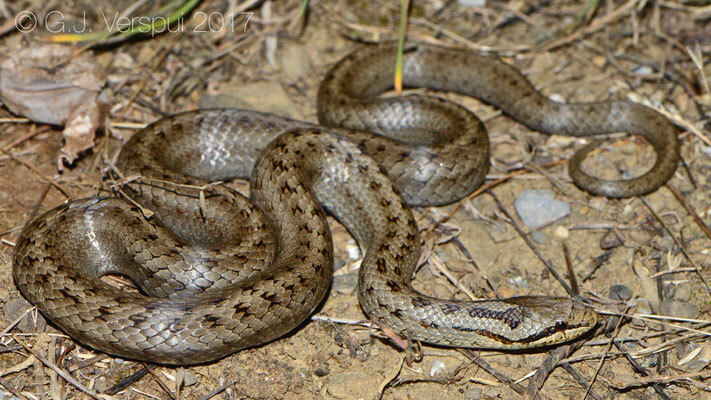 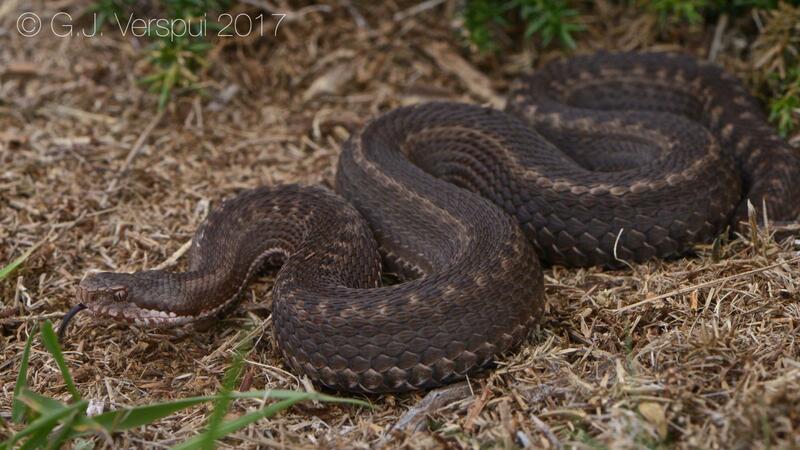 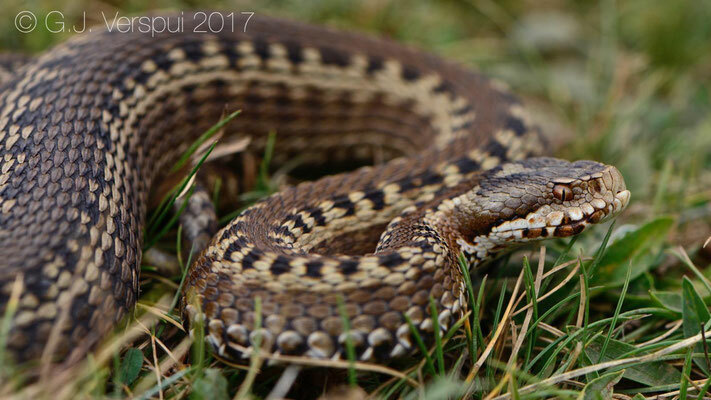 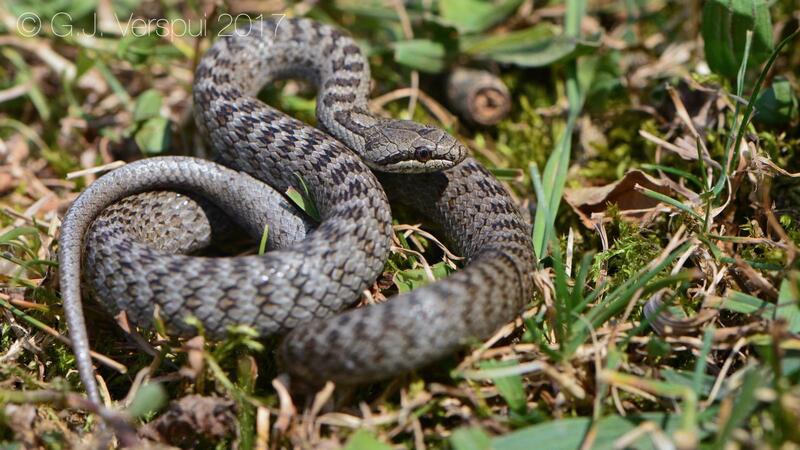 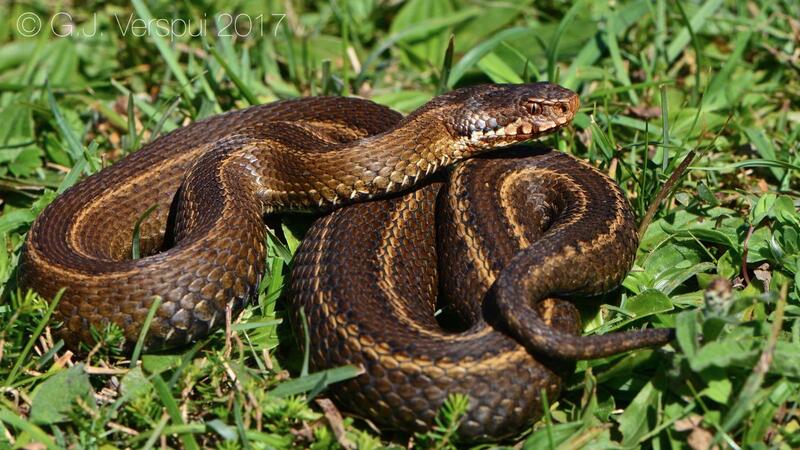 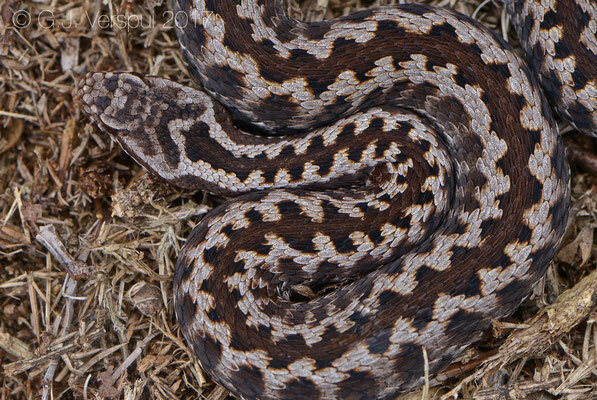 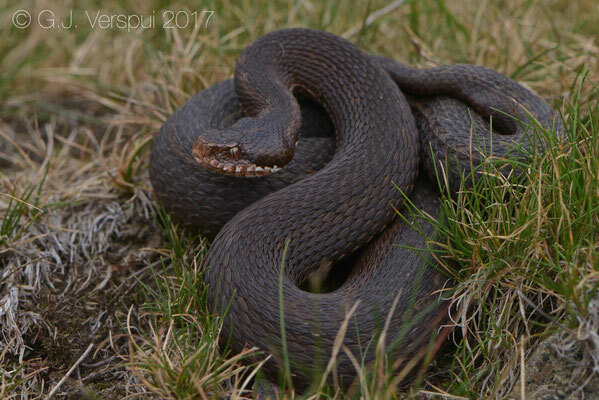 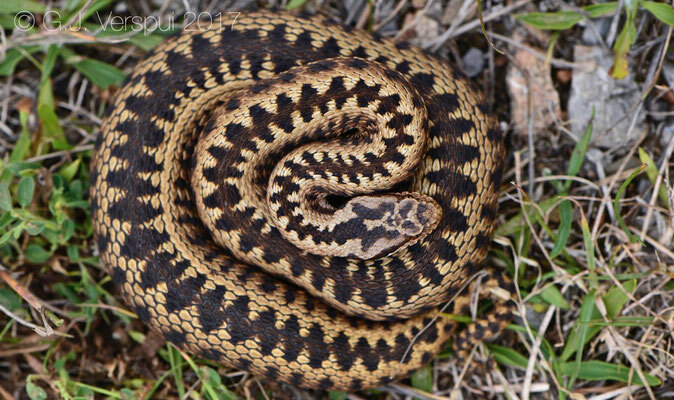 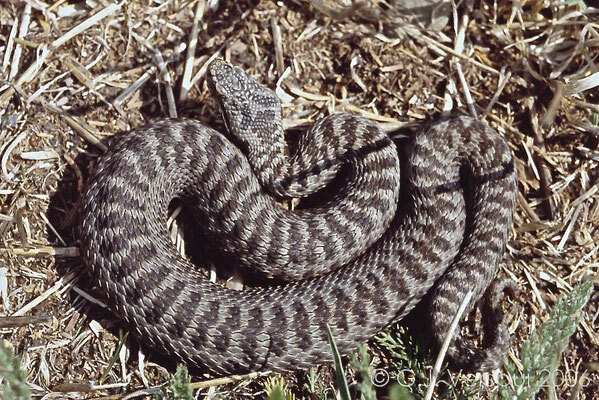 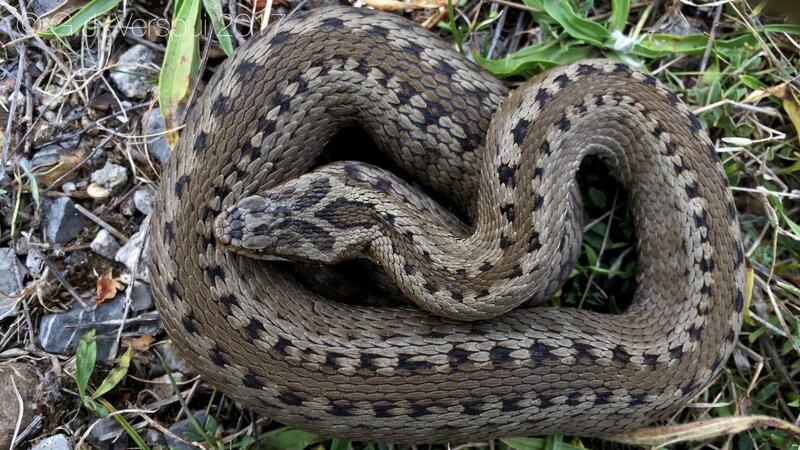 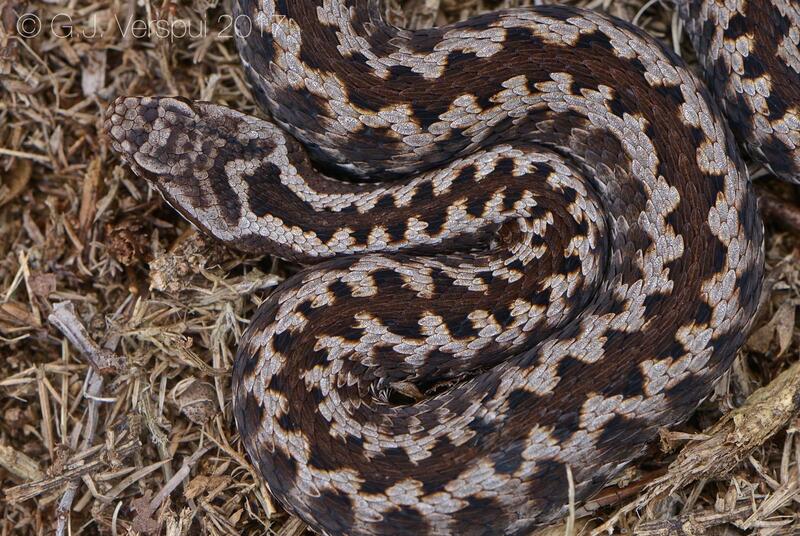 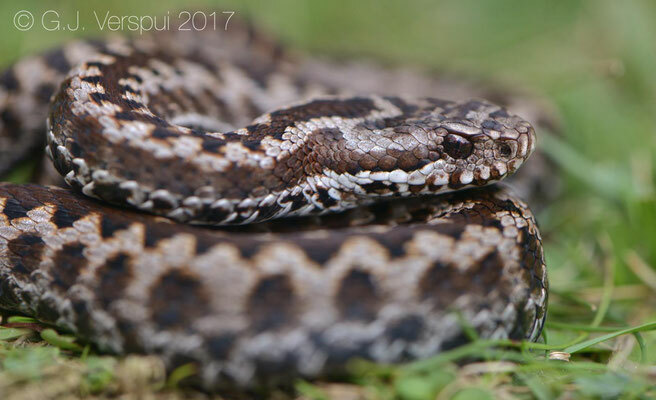 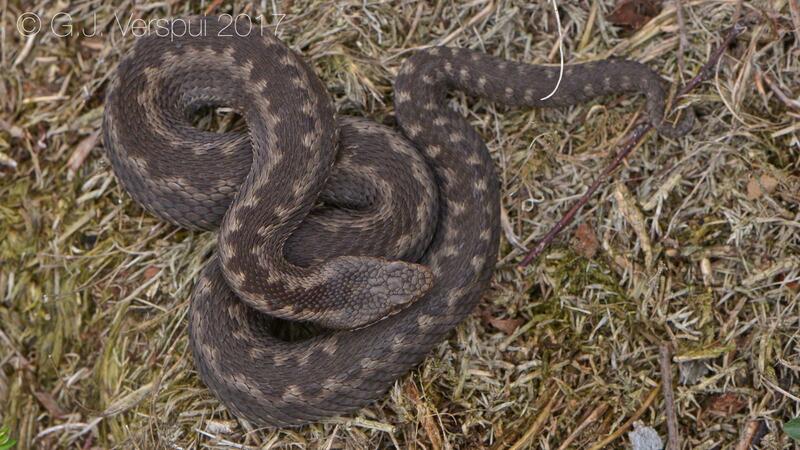 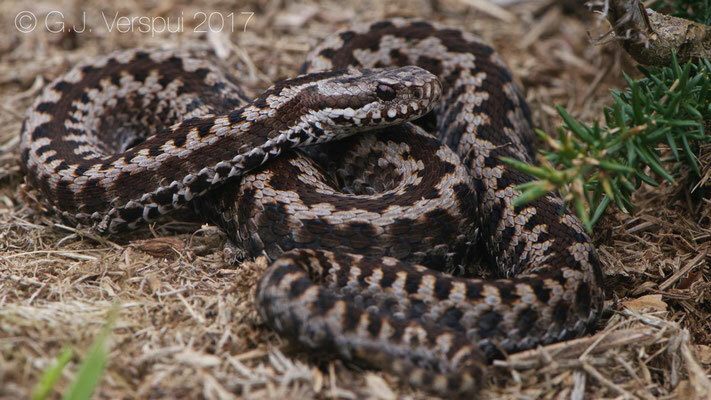 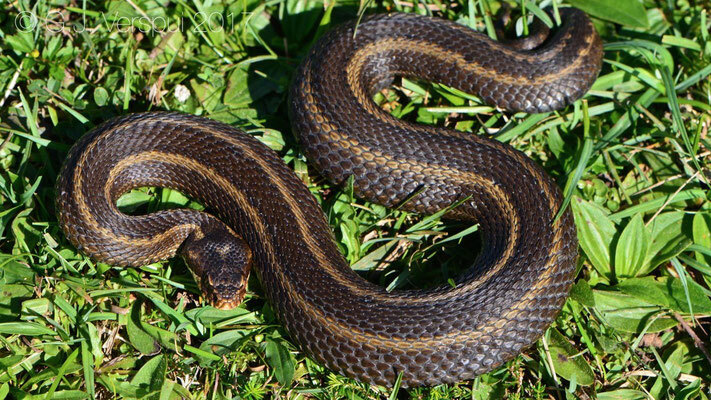 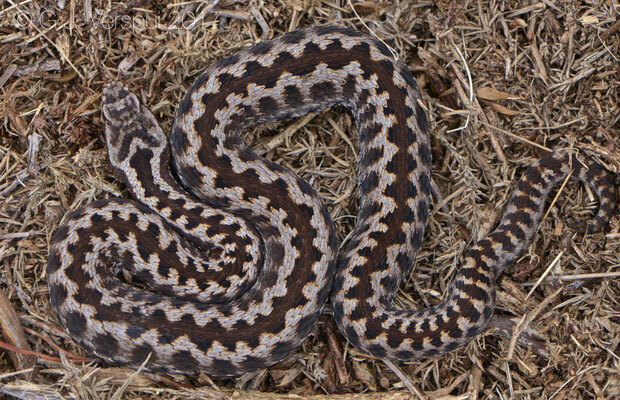 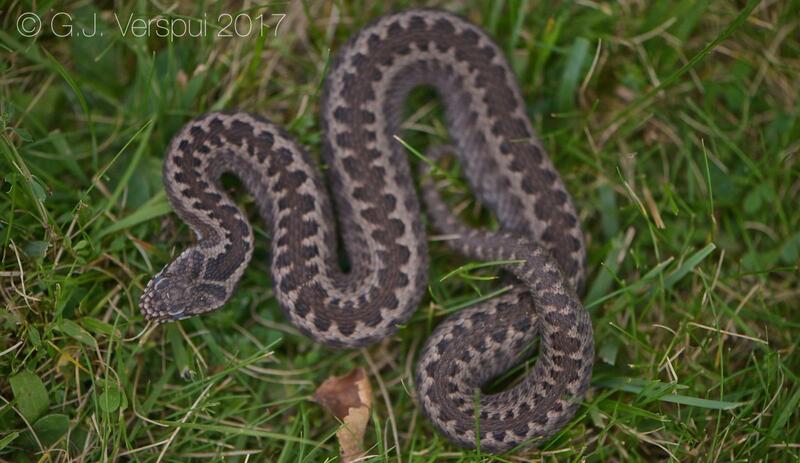 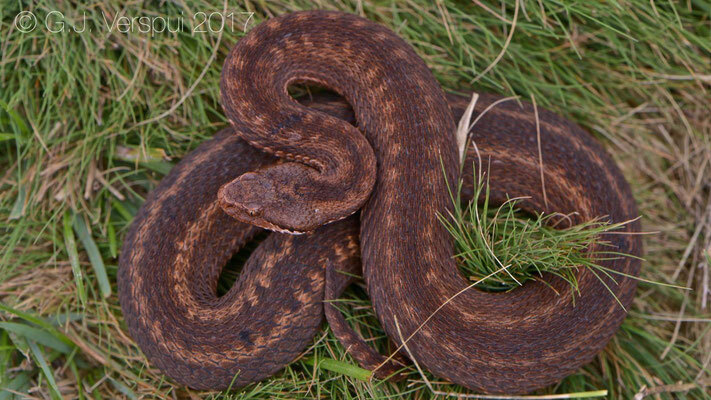 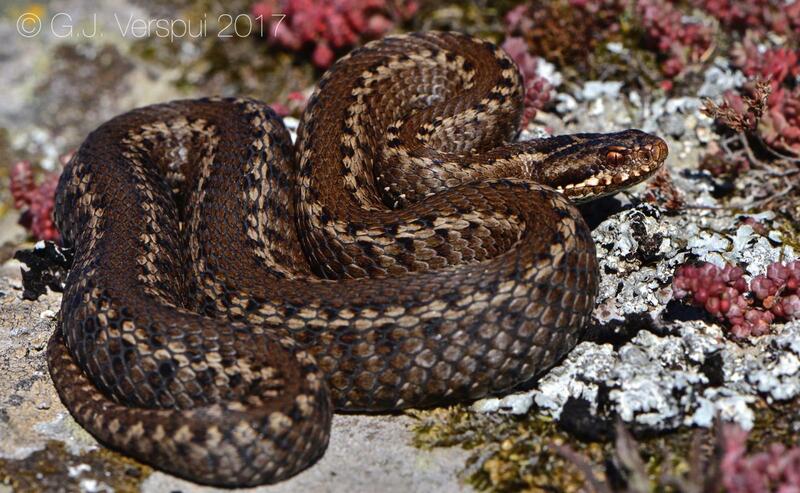 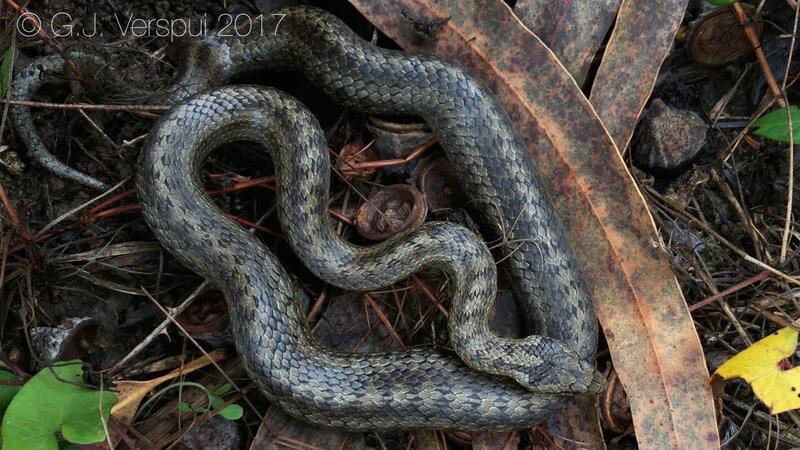 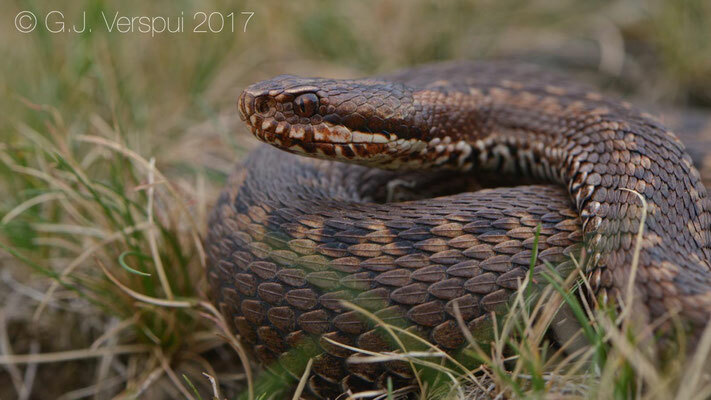 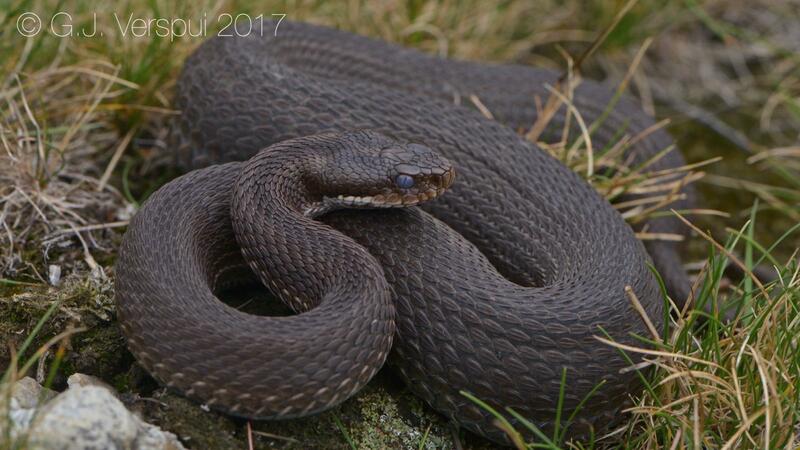 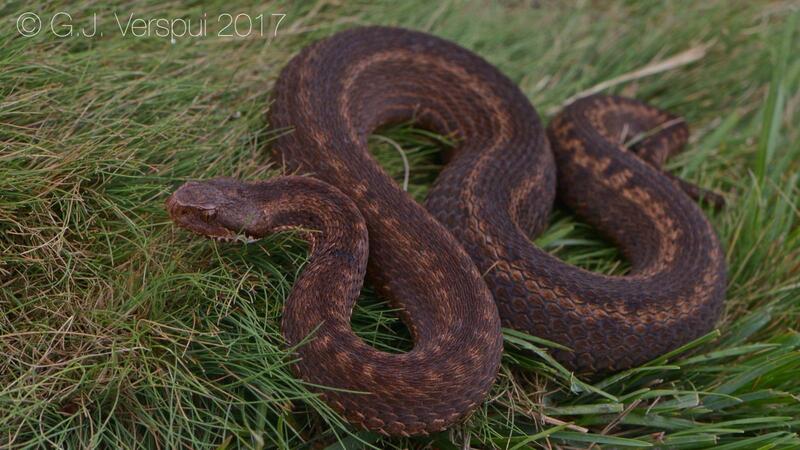 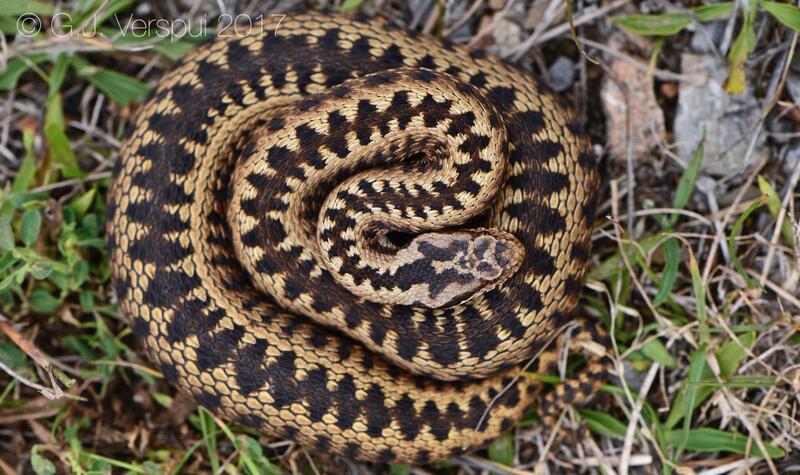 I put 2 photo's (old slides) in the gallery from a Vipera seoanei cantabrica that I found in 2006, so you can compare. 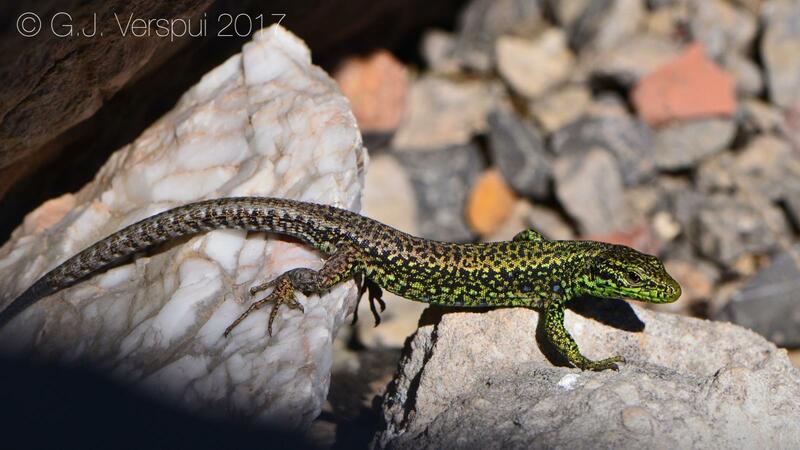 When we got closer to the higher mountains we had a nice and warm day which was spend at 1500 m absl in a small valley, here were many Common Wall Lizards and Schreiber's Green Lizards, in the evening we drove to an other place, the weather changed, lots of rain at night, that could be good! The morning started as a cloudy day with rain and low temperatures, in the morning I walked around a bit with Elin, but it was close to 6 Celsius, after flipping some stuff we found 2 very nice vipers and when the sun tried to come through the clouds I found many more in a small valley close to where the first 2 were found. 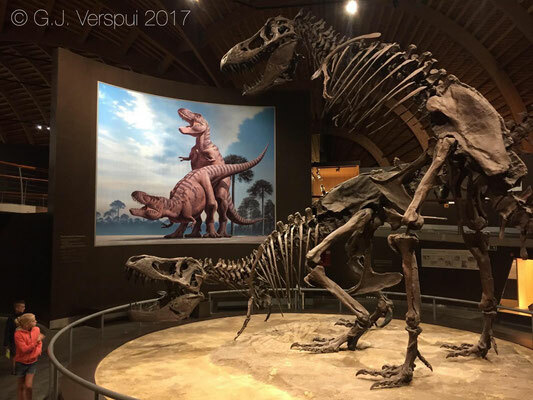 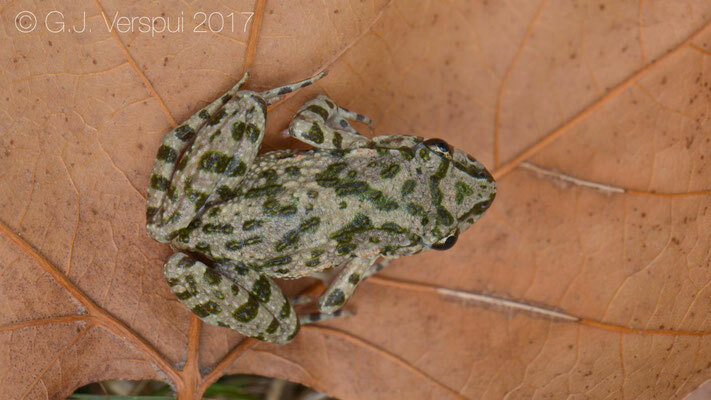 Even within this small area was some variation already, uniform colored, melanistic and animals with a familiar seoanei pattern were found. 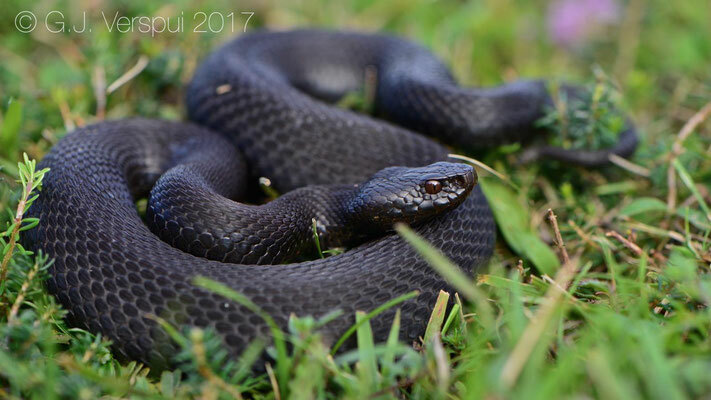 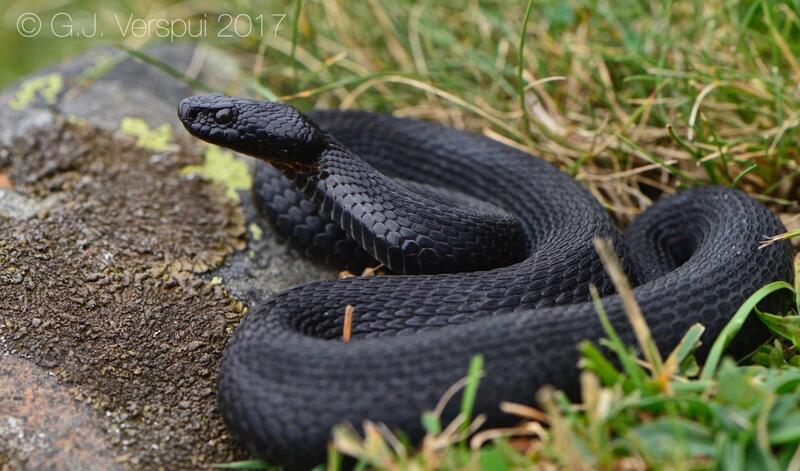 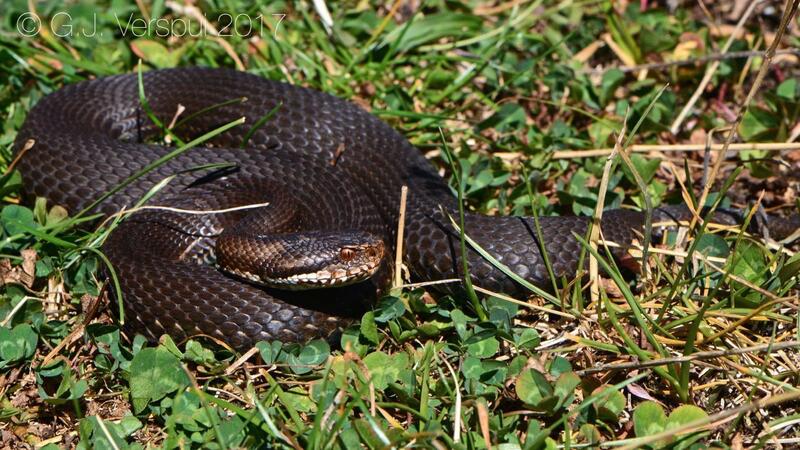 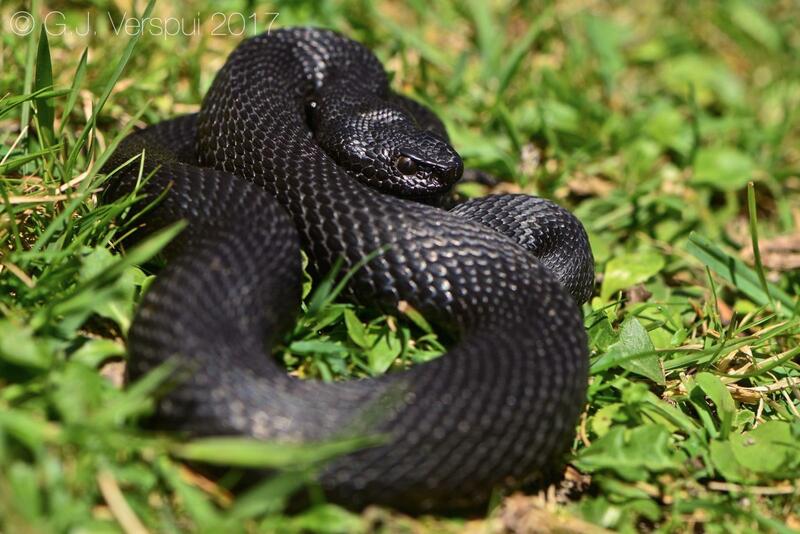 Other species found here were melanistic Viviparous Lizards, Grass Frogs and a Smooth Snake. 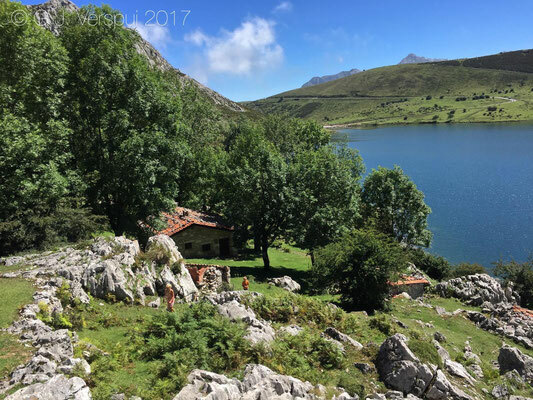 Next place we wanted to go to was the northside of the Picos and the coast close to it. 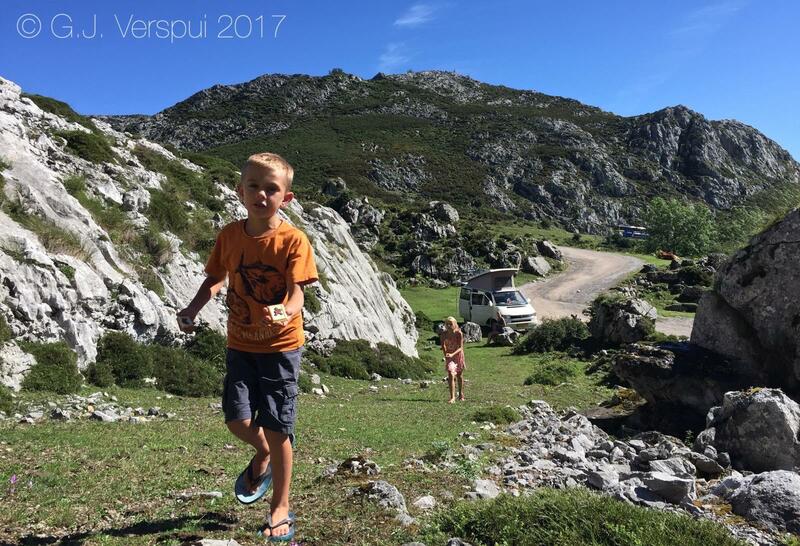 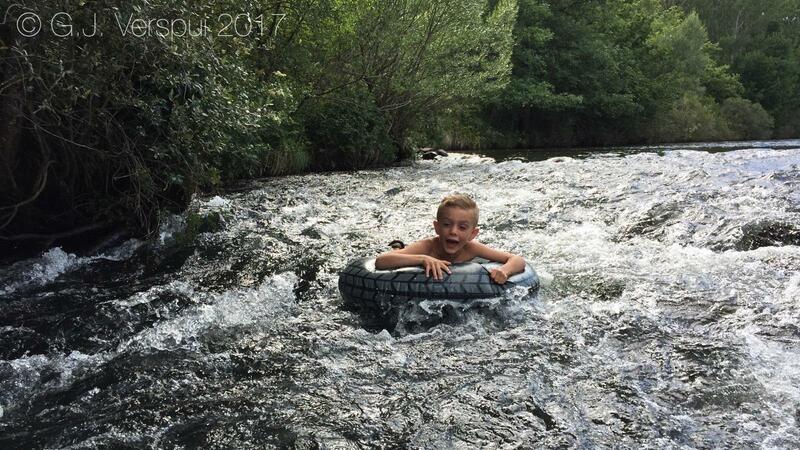 We visited a museum with some dinosaurs, searched for dinosaur tracks on the beach and we enjoyed the Covadonga Lakes in the Picos, at that place we had the best holiday weather and the kids were chasing Iberian Rock lizards and Common Wall lizards, within a short while they had many in a bucket, but all were released again. 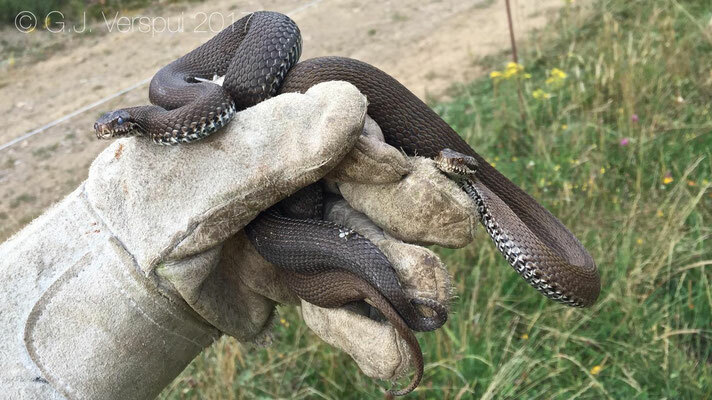 I also searched for vipers there and found 2 of them a big female and a melanistic male. We stayed in this area for a couple of days and I used my oldtimer MTB to go herping in the morning, I found a place with many vipers, but there were also many ticks around and it took some time to remove at least 85 of them that evening..
All of the seoanei vipers I found on that side of the picos have the bilineata pattern or they were melanistic. 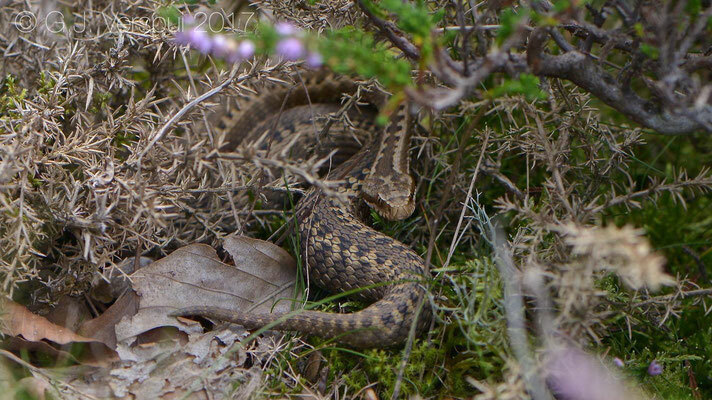 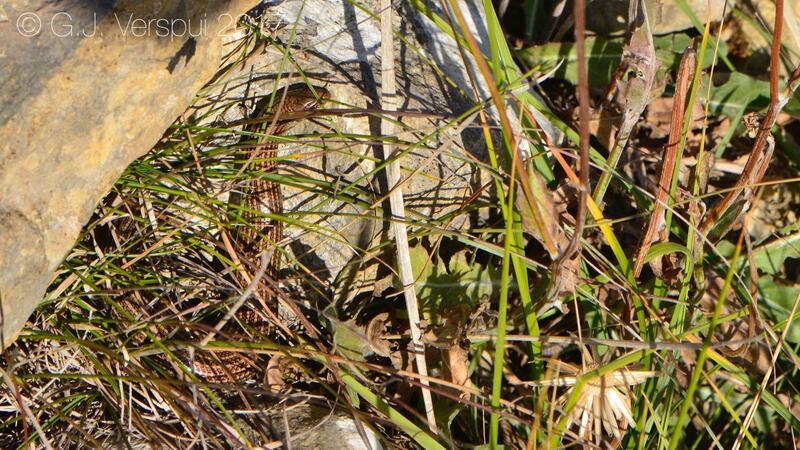 Next to the vipers I found also 3 Smooth Snakes, 1 at sea level and the others high up in the Picos. 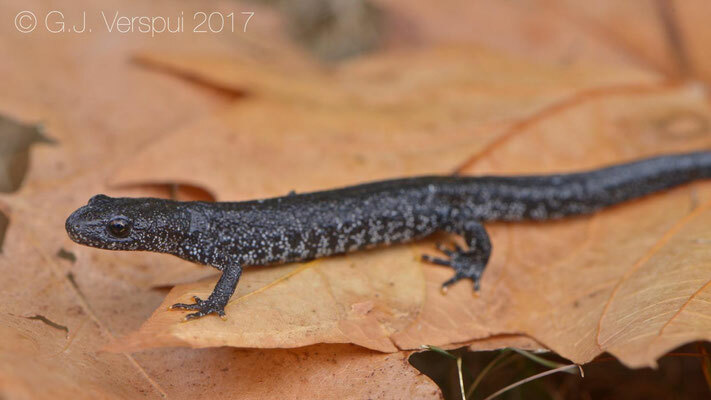 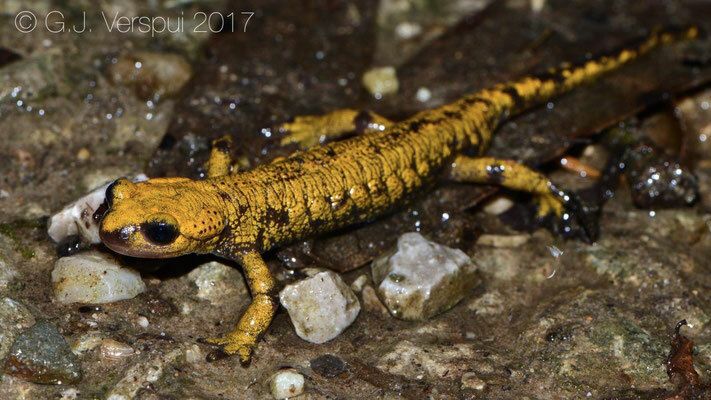 On the last night here we went to a good spot for amphibians, when it was dark I went out with Elin and Siem and we walked for 1,5 hours, on our way we found Fire Salamanders, Golden-striped salamanders and Iberian Newts. 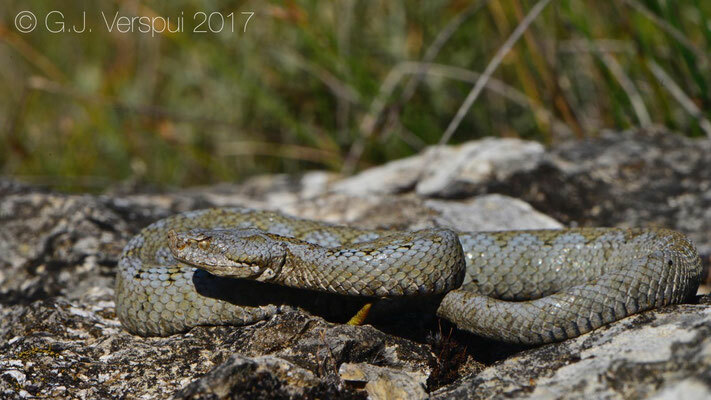 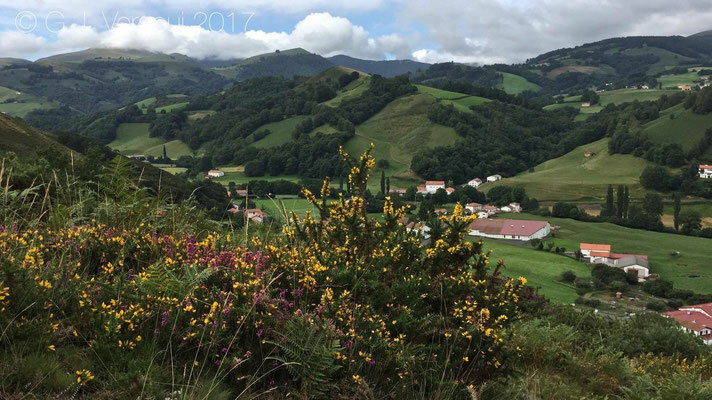 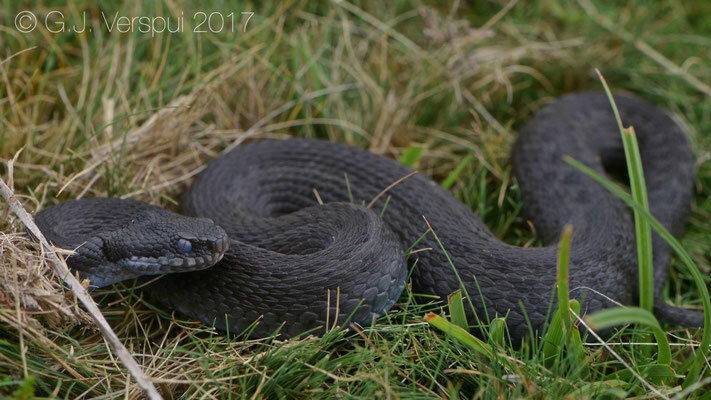 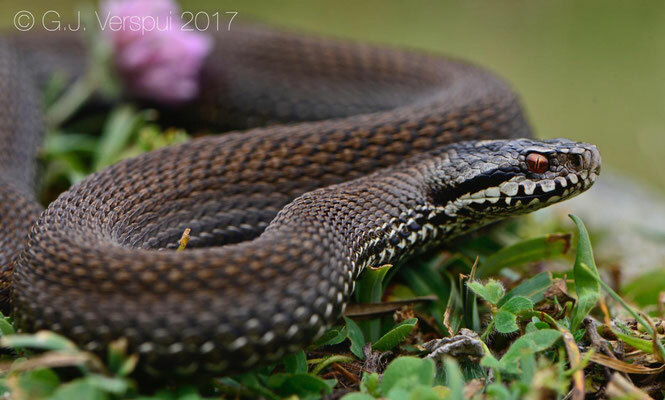 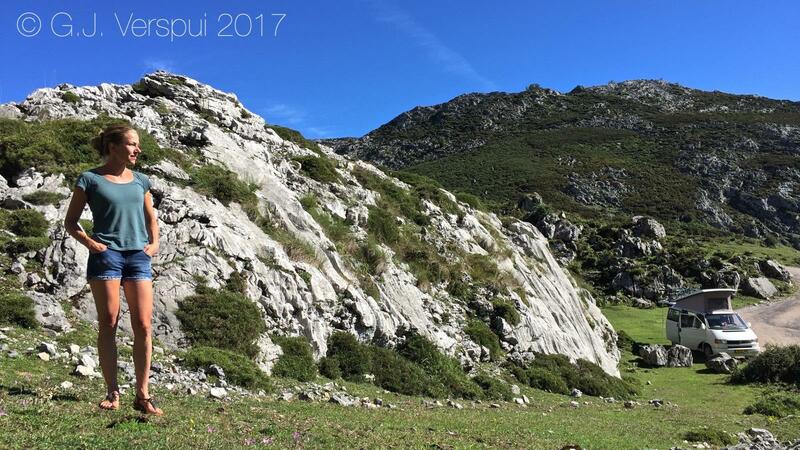 We left the north side of the picos again and drove south on the east side of the picos again, this was a very scenic route and at one of the stops I found a uniform colored Seoanei Viper together with a very good-looking Smooth Snake. 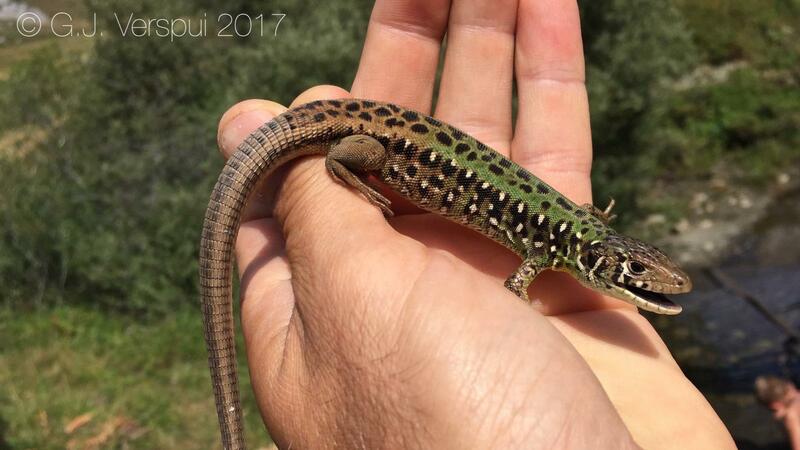 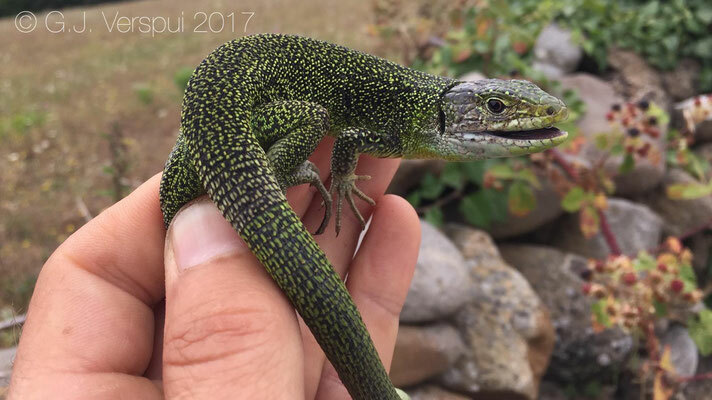 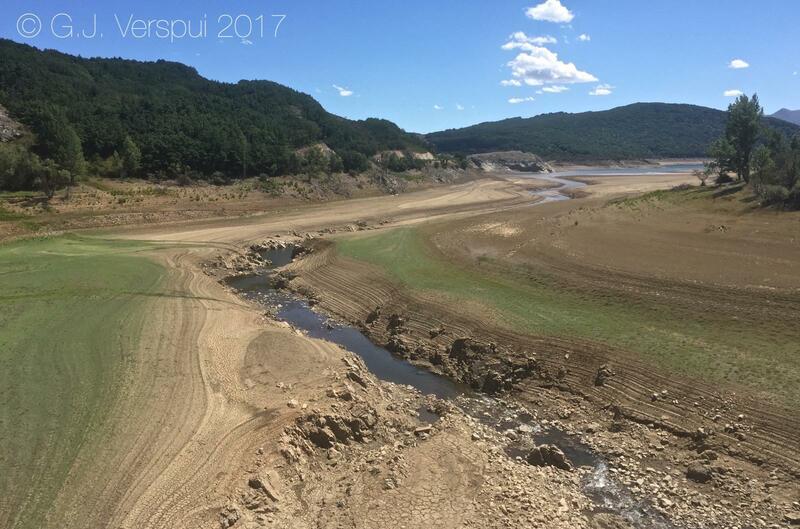 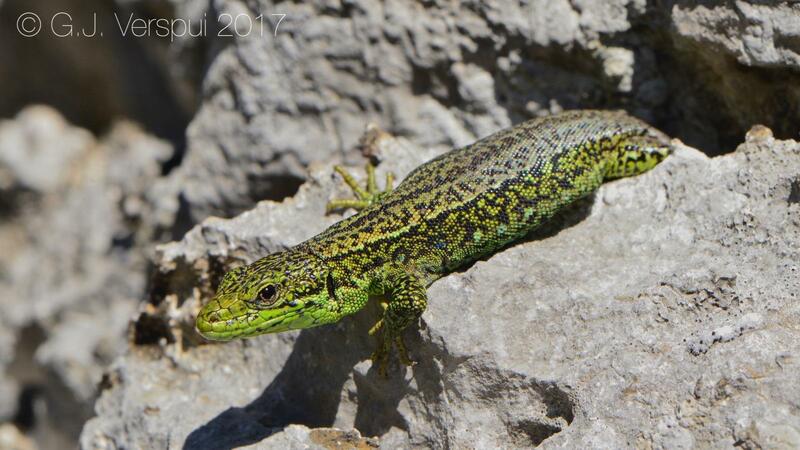 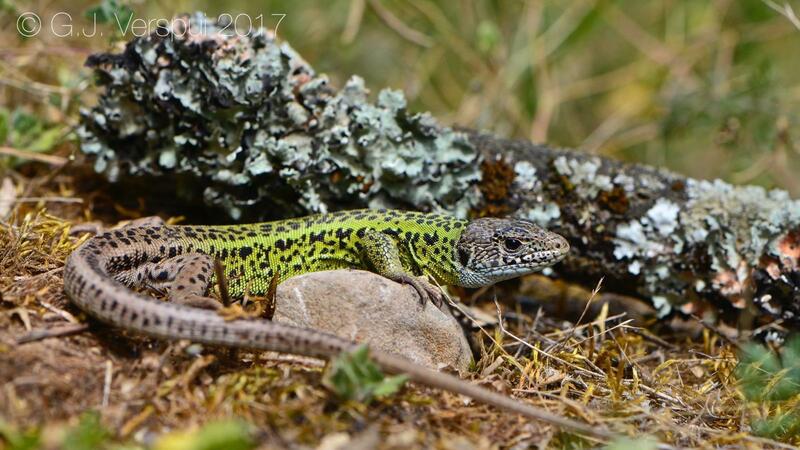 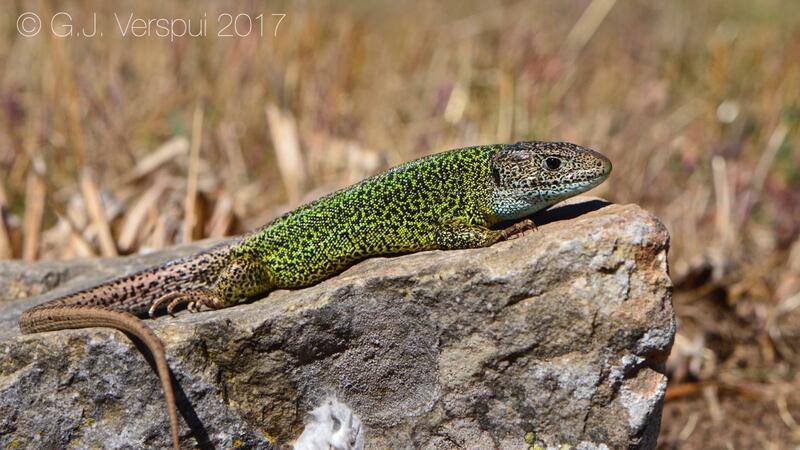 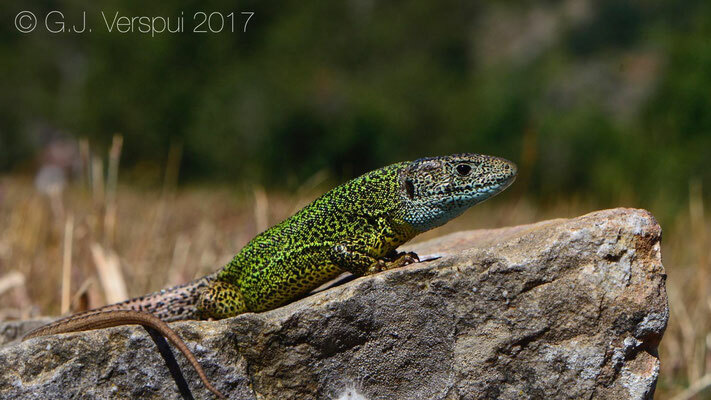 That day was a lot of driving past high mountains and small villages, at an other stop for some coffee we saw many Western Green Lizards, in the end we arrived at Embalse del Ebro again, but now on the other side. 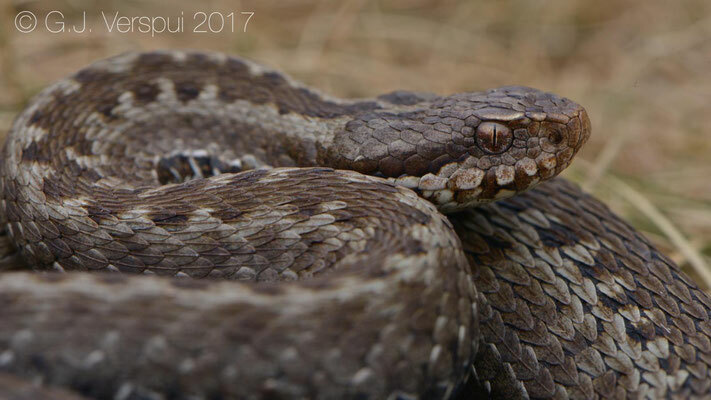 The moment we arrived there the weather was about to change from clouded to rain, so I looked around quickly and 20 meters from the car I found an other beautiful female Seoanei Viper. 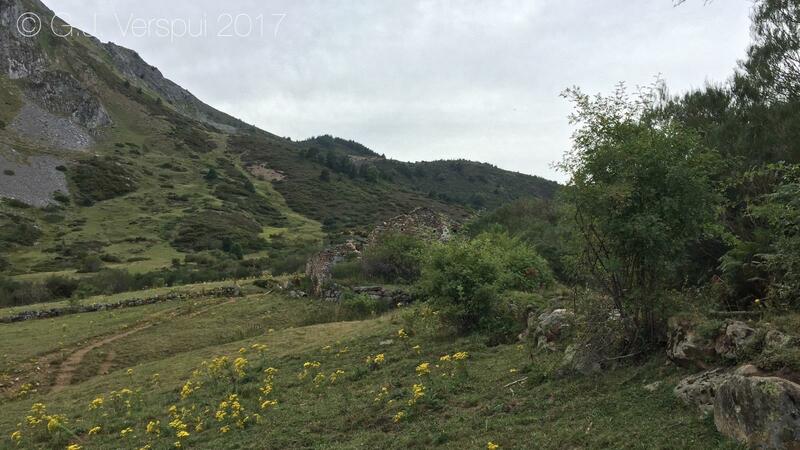 If the weather would have been better we would have stayed there a bit longer, but it was only rain and a lot of wind, so we decided to drive to the Pyrenees the next morning to spend the last days there. 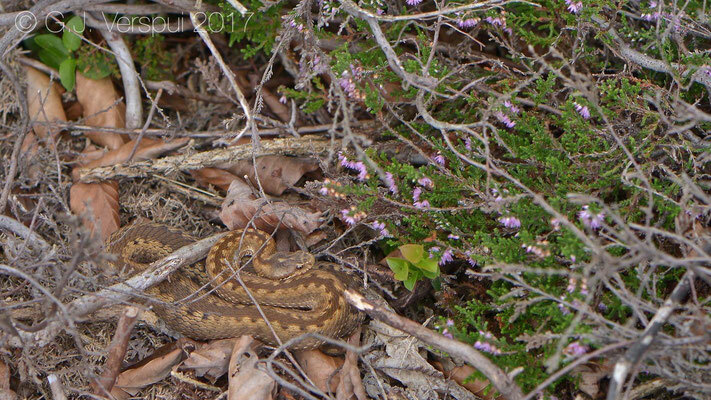 When we reached France again we knew we were in a country with a very bad cuisine, so we got pizza and the pizza was surprisingly good, I think the owners were Spanish or Italian, must have been Spanish because they didn't try to rip us off..
First we went to a place where there are 7 species of snake living together, but all I saw was a Slow Worm, pigs and a huge Griffon Vulture, who was sitting next to a river and because of some good rocks I was able to get pretty close to it, so it was a good morning after all! 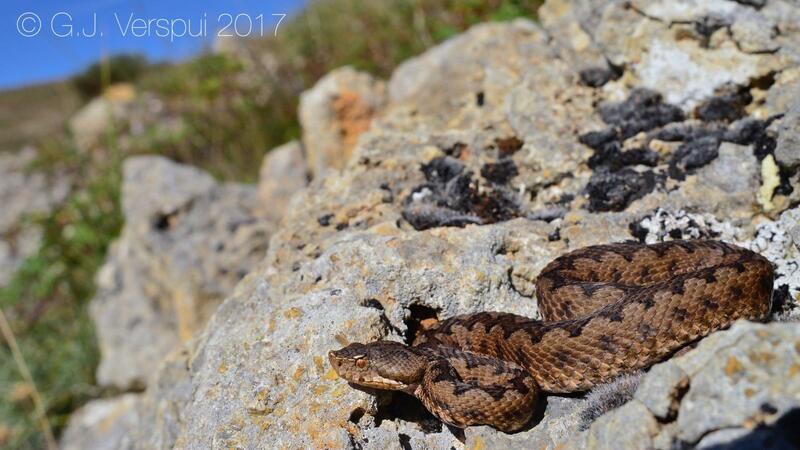 Next we went to one of my all time favorite places in Europe, I've been here since I was a kid and still think it is strange that I never saw Seoanei Vipers at that time while I was always chasing the lizards. 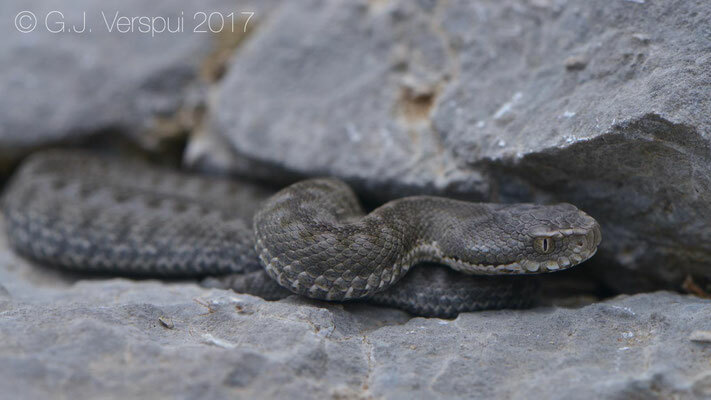 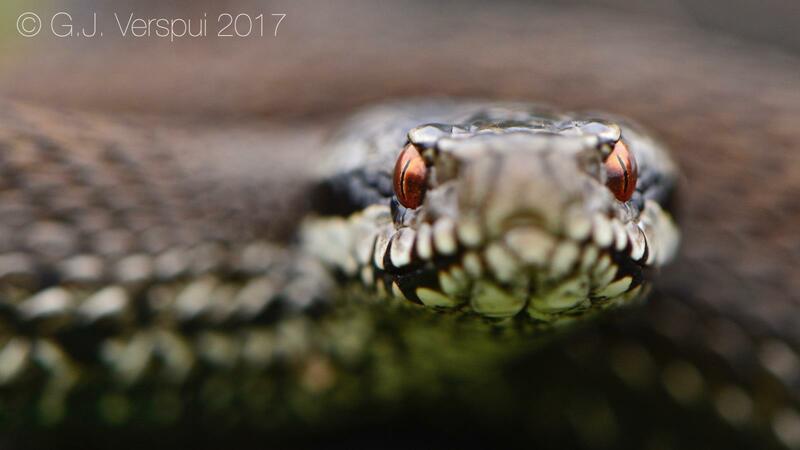 We arrived in the afternoon and it was cloudy and on the edge of being too cold, so first I did not see many reptiles, but when it became a bit more warmer I found almost 20 vipers, most of them females again. 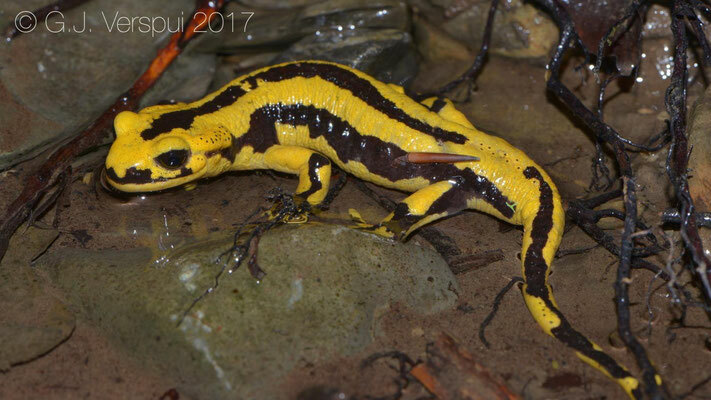 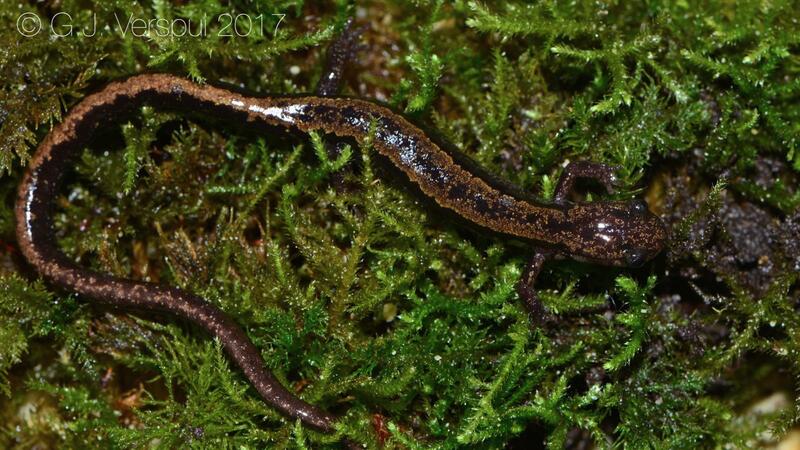 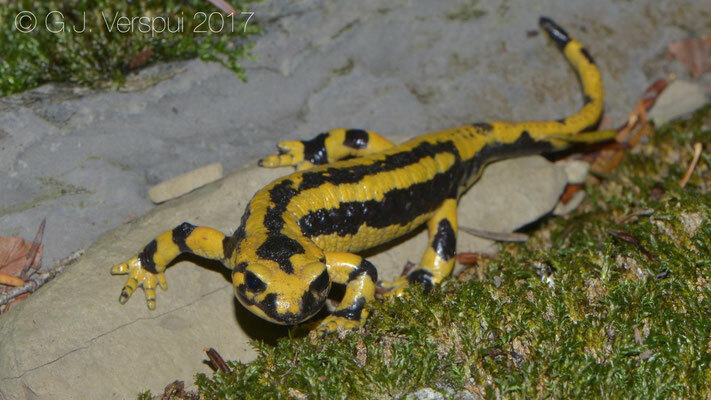 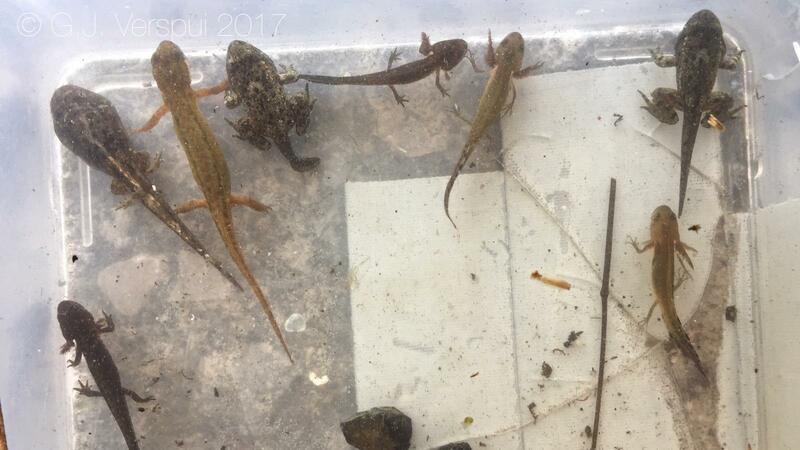 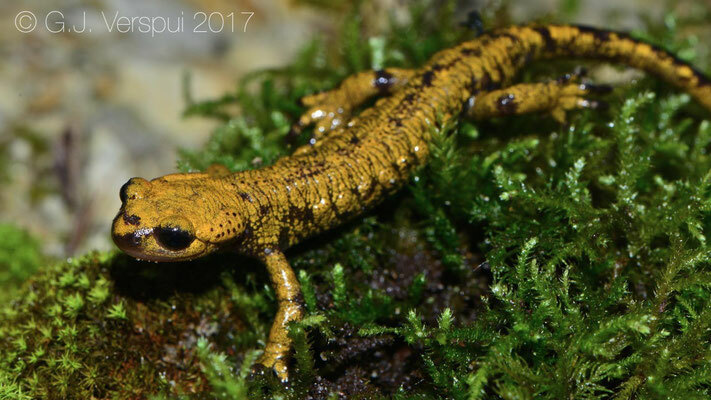 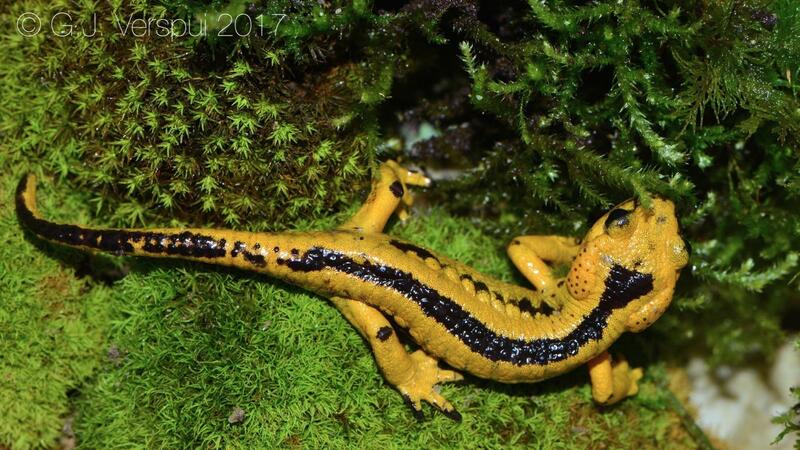 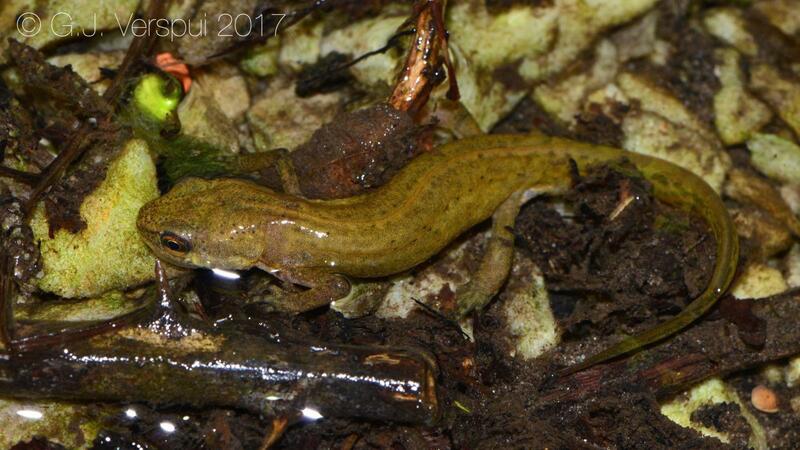 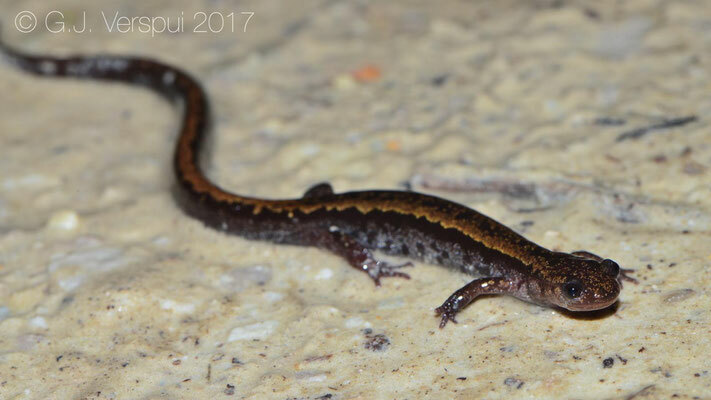 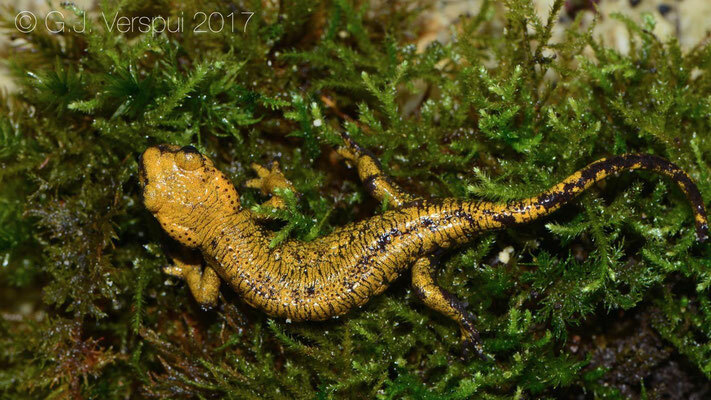 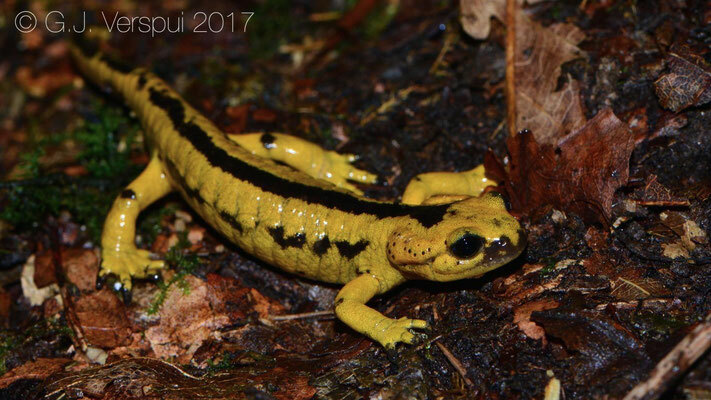 At night we went to a stream and together with Elin I looked for Fire Salamanders and around 6 of them were found, we did not see any Pyrenean Brook Newts which was weird to me, also not a lot of Pyrenean Stream Frog tadpoles around compared to other years in summer. The next day was very sunny and hot, the vipers were not so active, but still around 10 were seen in an other area as the day before, in the afternoon I went to a stream hinted by the God of European Herpetology to look for the Pyrenean stream Frog, I only saw tadpoles and some Pyrenean Brook Newts and Grass Frogs. 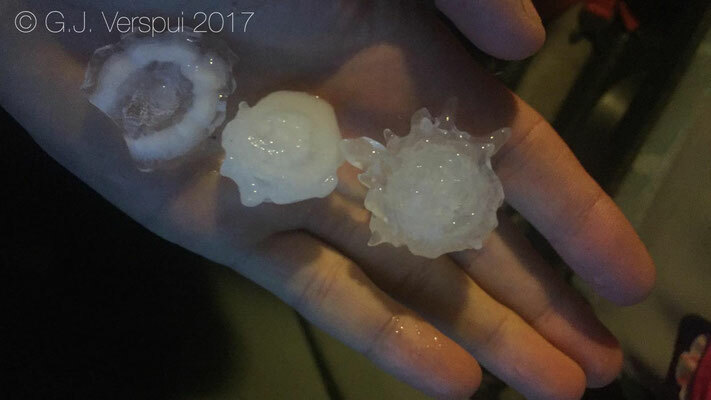 In the evening the weather changed and very big balls of ice came down. 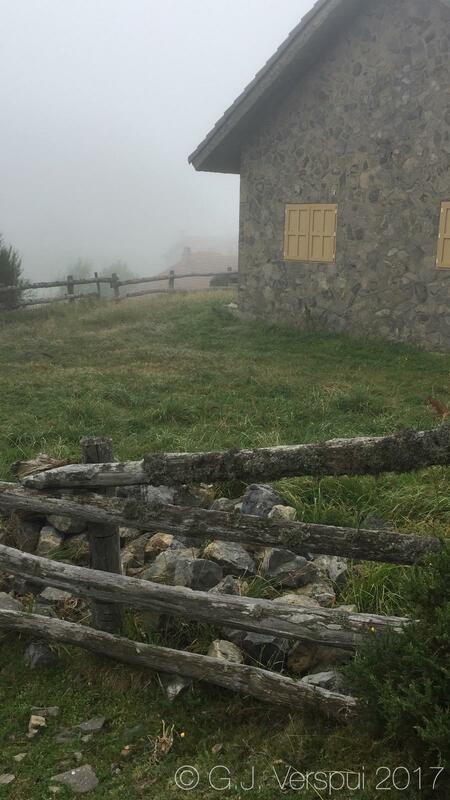 In the morning it was very cold and still raining so we left and drove out of the Pyrenees. 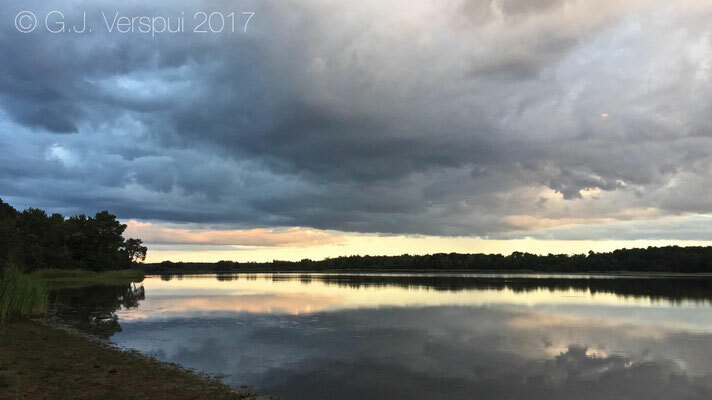 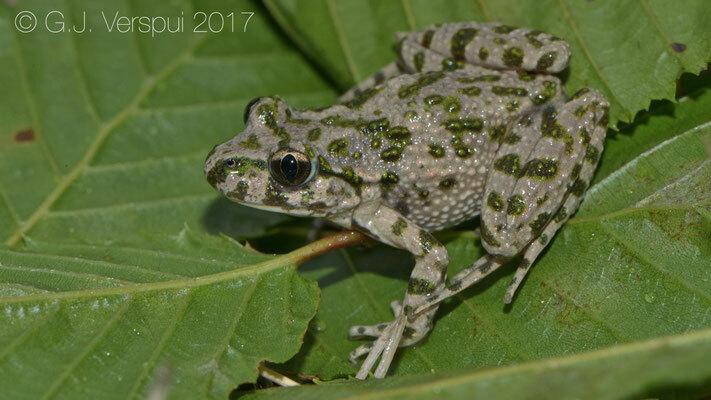 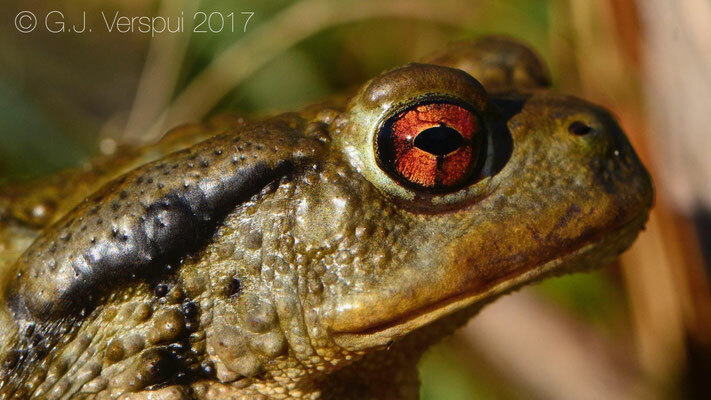 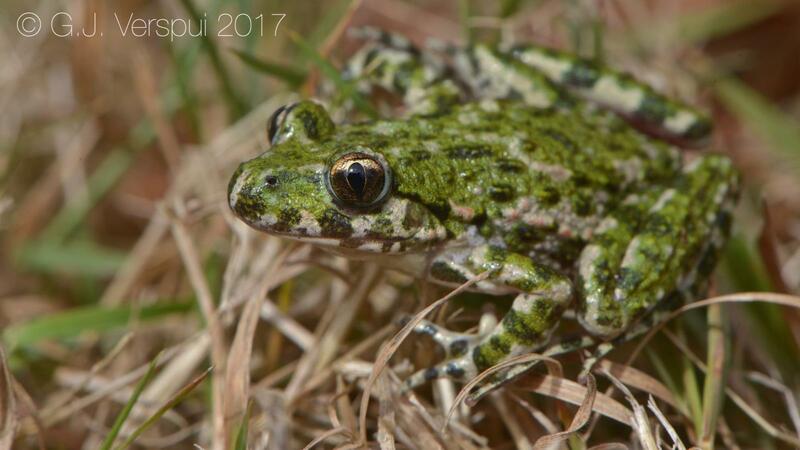 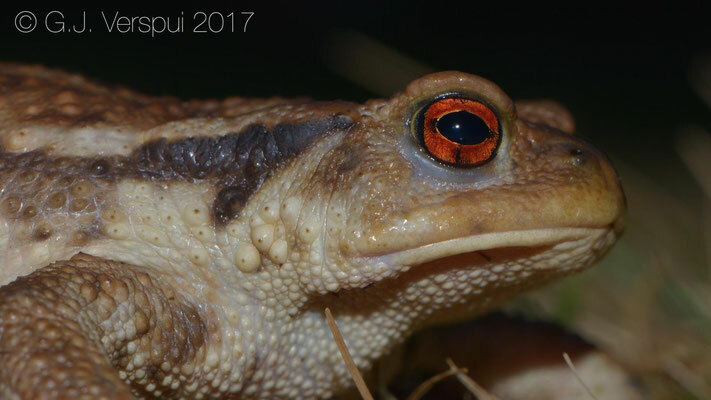 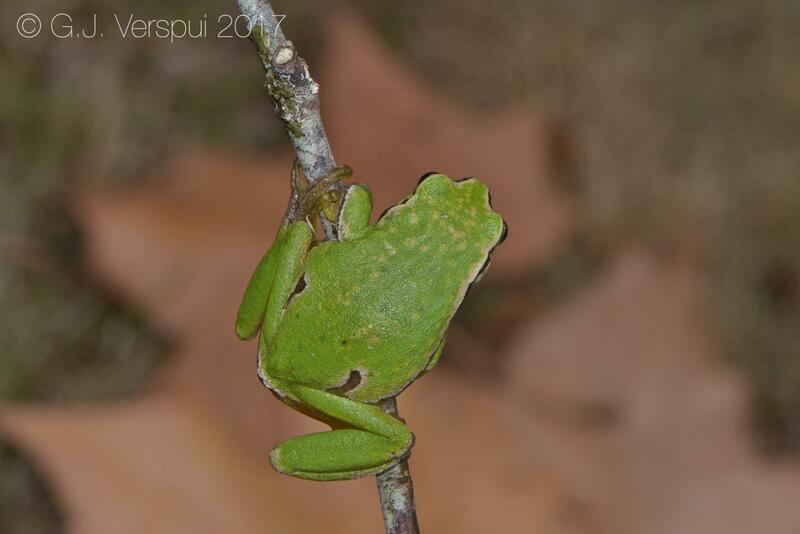 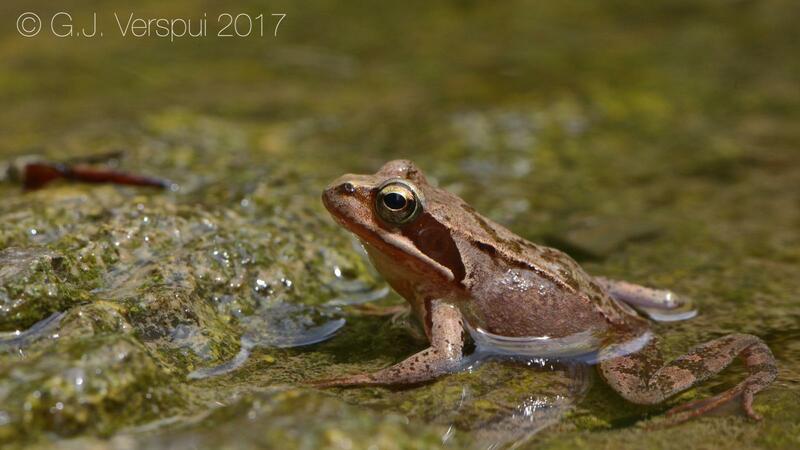 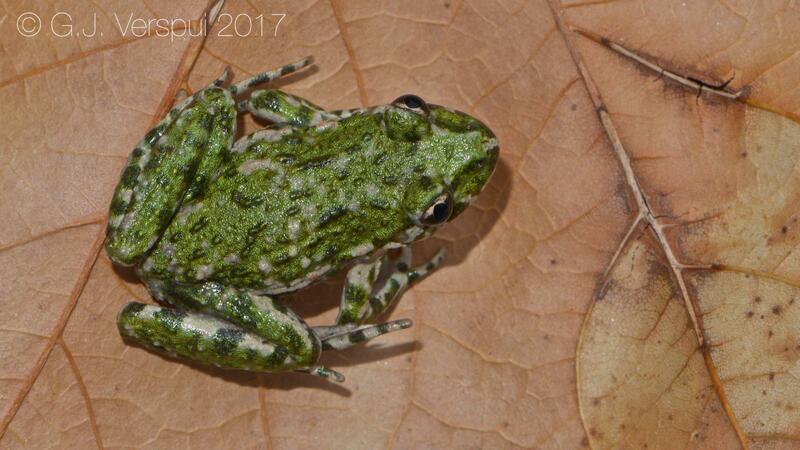 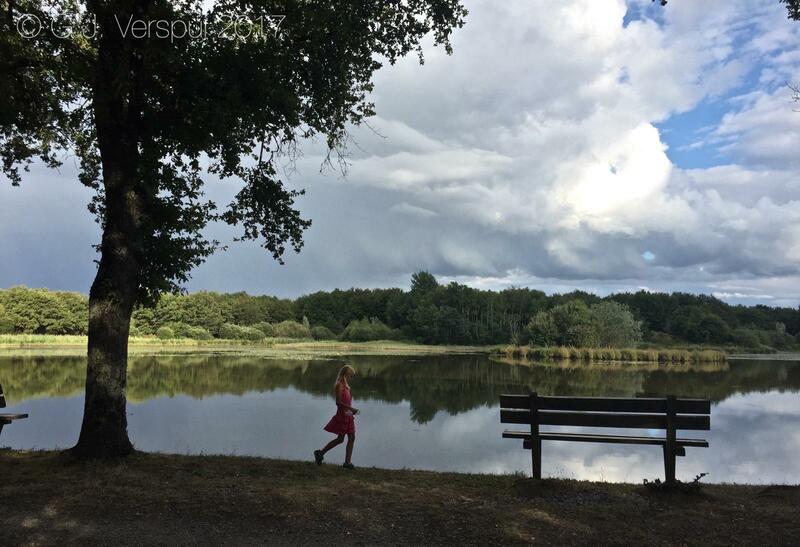 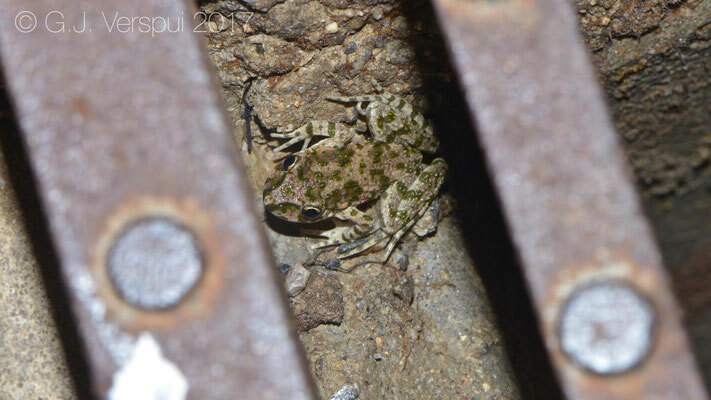 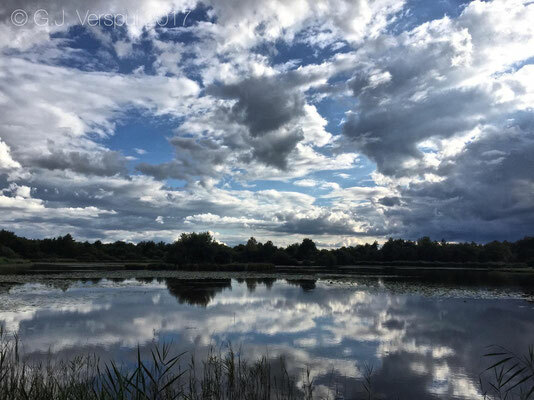 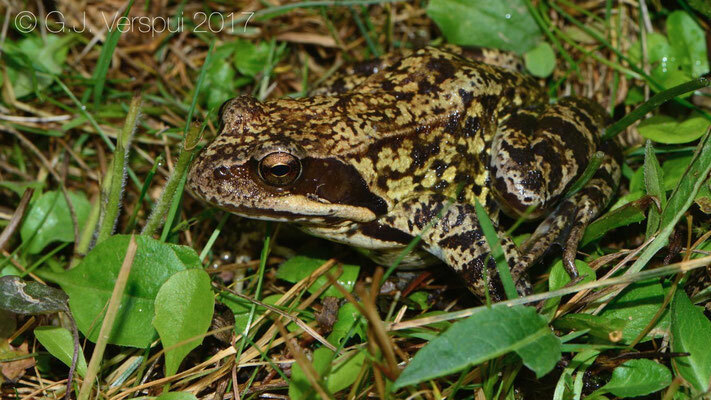 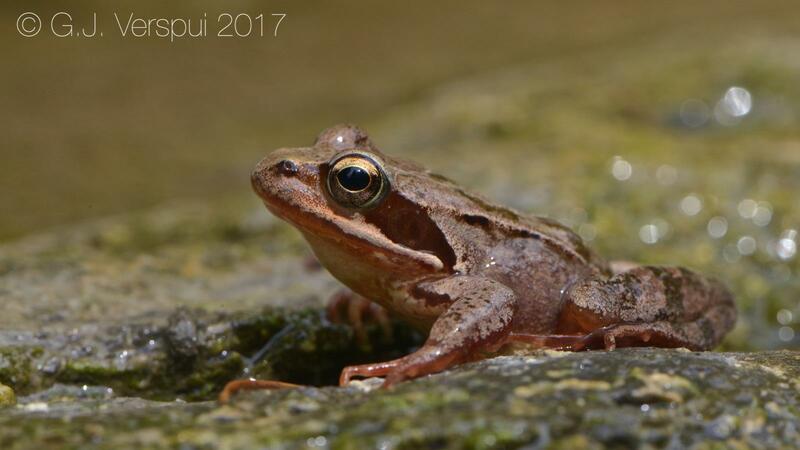 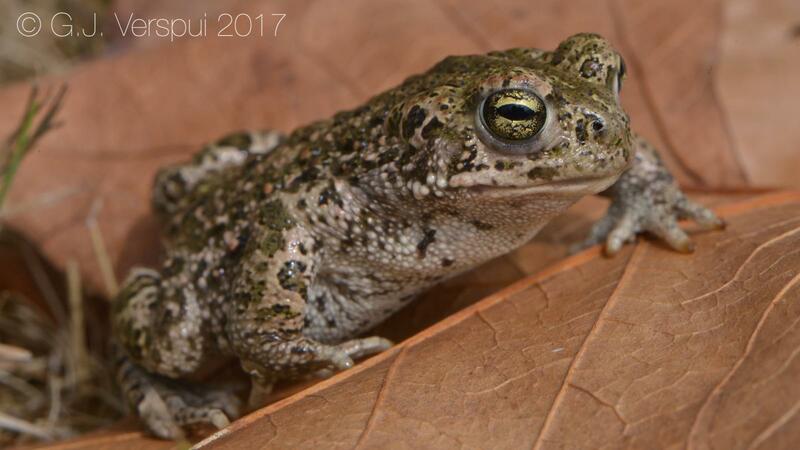 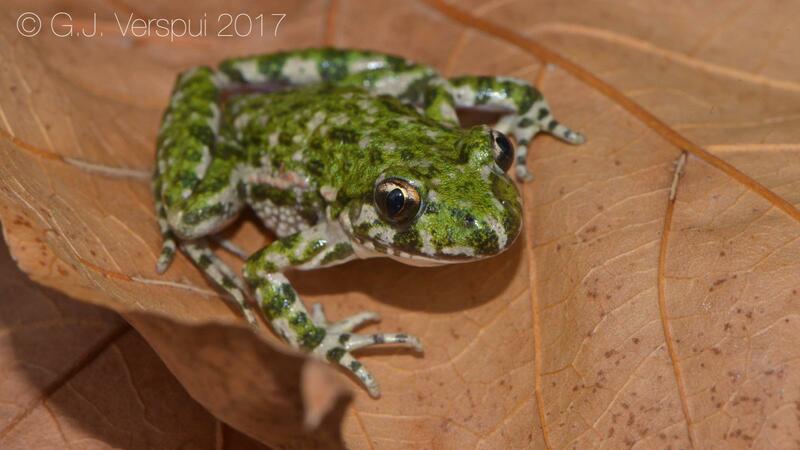 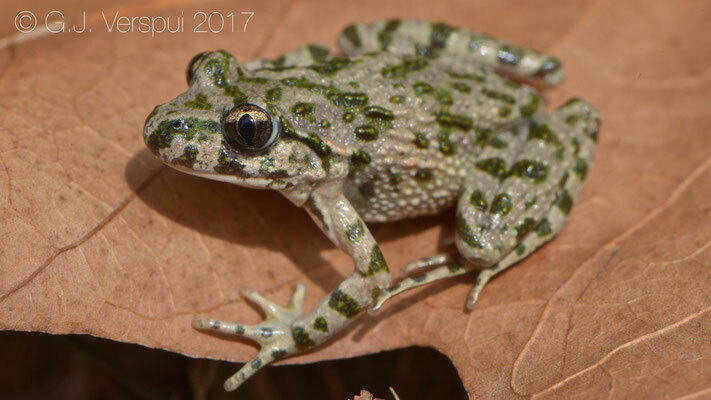 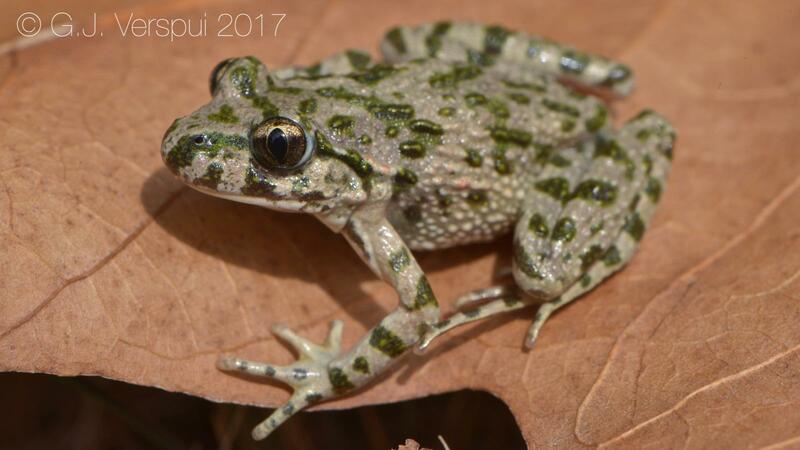 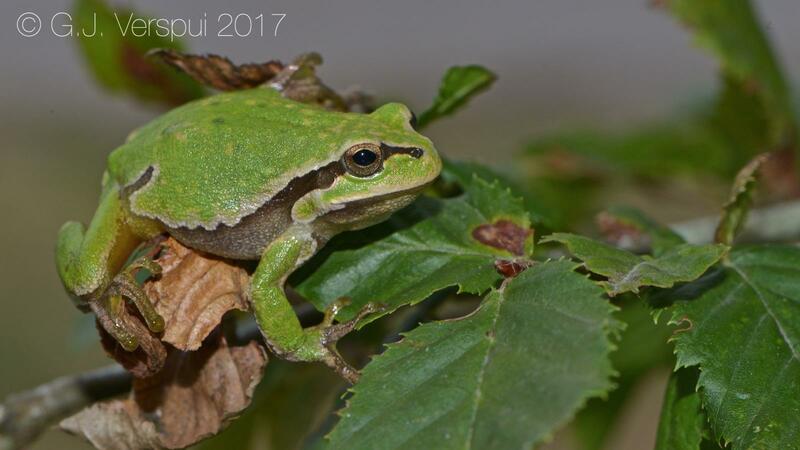 We drove towards la Brenne, a nice area with lots of lakes and they have a lovely campsite there, around the campsite there are many good herps to find, in the evening I searched with Elin and found Natterjack Toads, a Crested Newt and Parsley frogs. 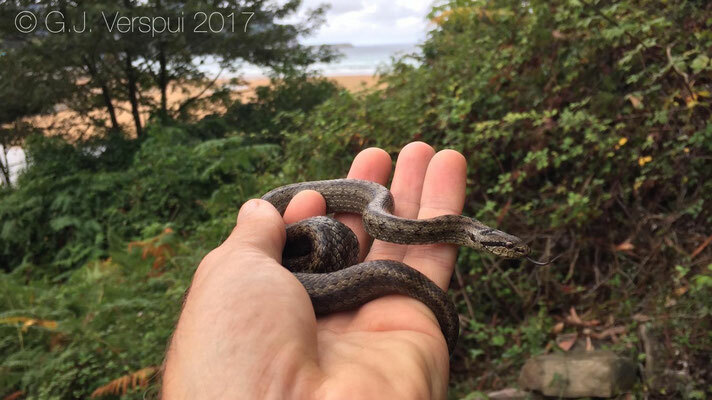 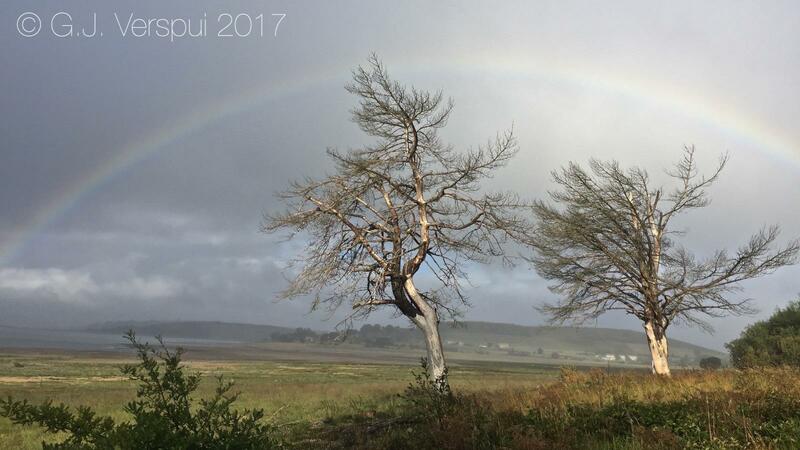 The next day it was a mix of sun, clouds and rain, but the wind was strong and even during the sunny parts I did not see any snake, only some Western Green Lizards and a Tree Frog that was in a hole in the tree next to our camper. While I was searching I met a Belgian guy who was also looking for snakes, but he was not having any luck either, his name was Bert and in the afternoon he dropped by and I showed them the amphibians from last night, we made some photos and released them again. 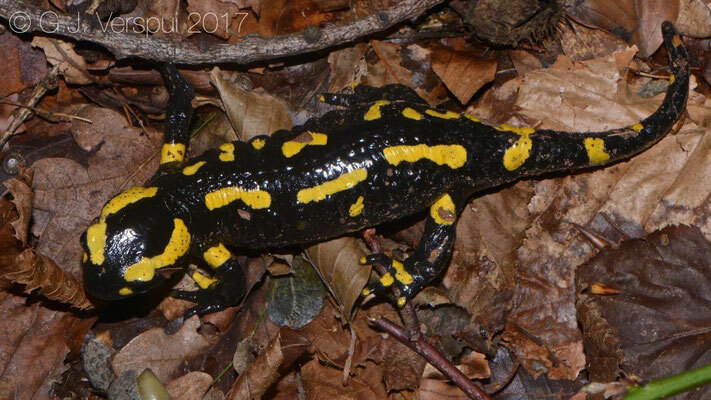 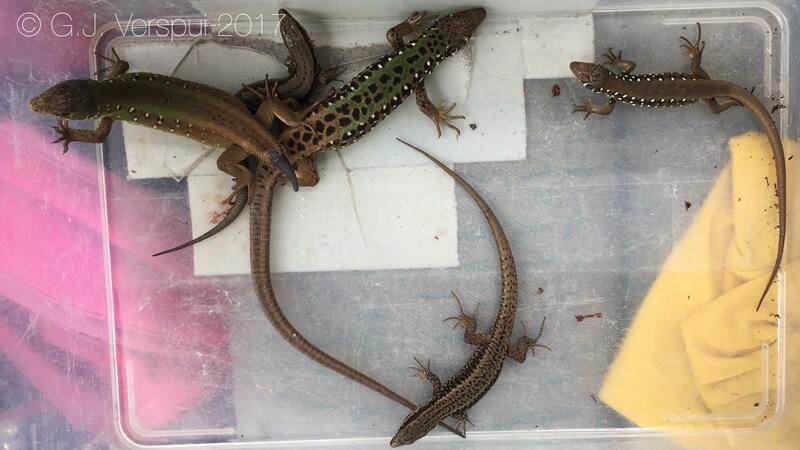 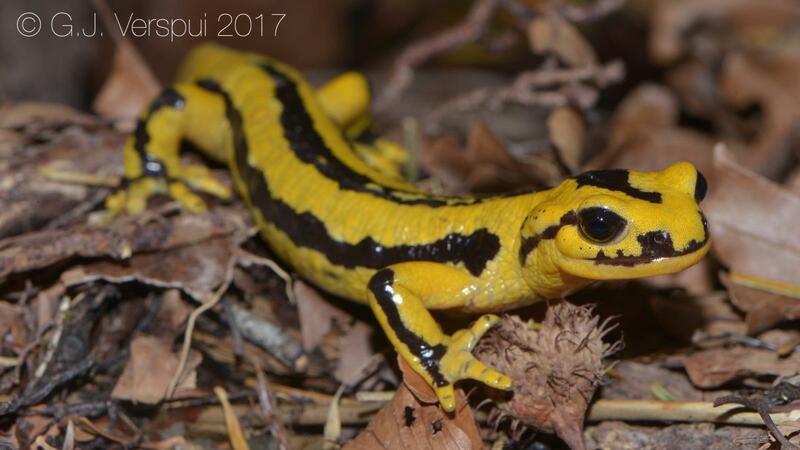 After releasing the animals we drove to Belgium where we wanted to meet with Jeroen Speybroeck and hopefully see some Fire Salamanders in one of the places that he is monitoring. 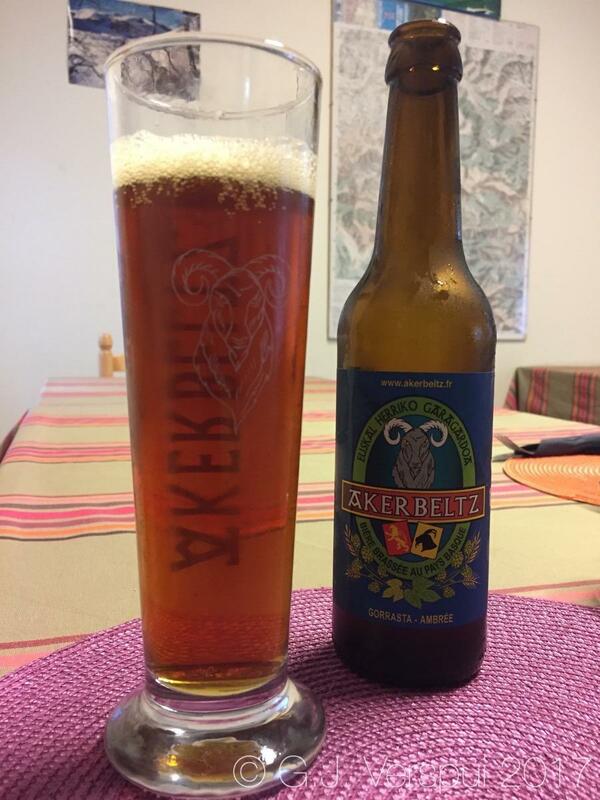 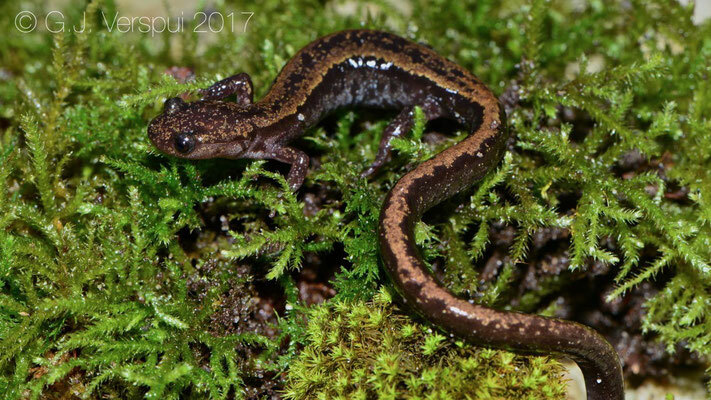 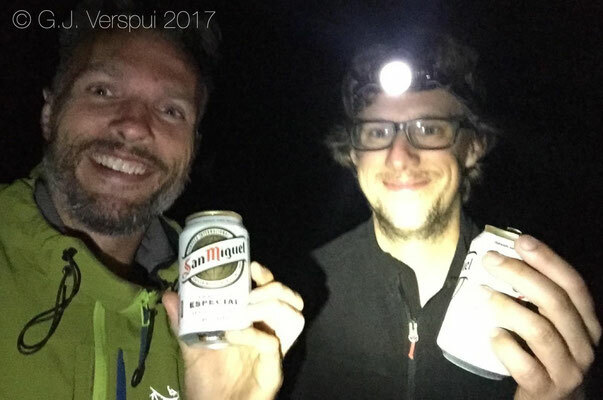 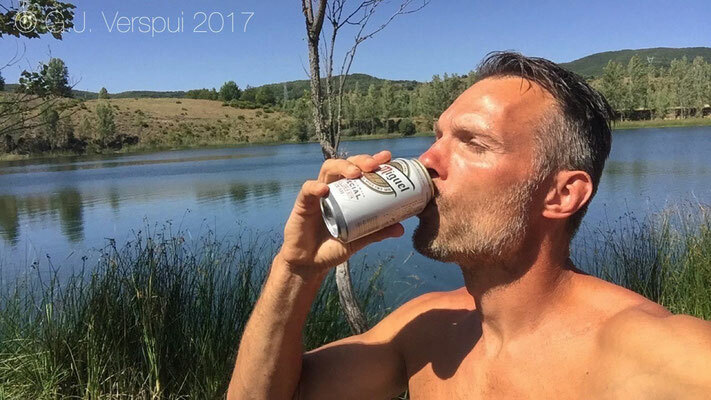 When we arrived we started with some beers and now I must say that I took them all, but thats not true..
We searched in 2 different areas and found 2 salamanders and a hedgehog, which was a big contrast to the night before when Jeroen counted around 180 animals, but it is as it is.. I was very cool to meet up again and I still had a blast! 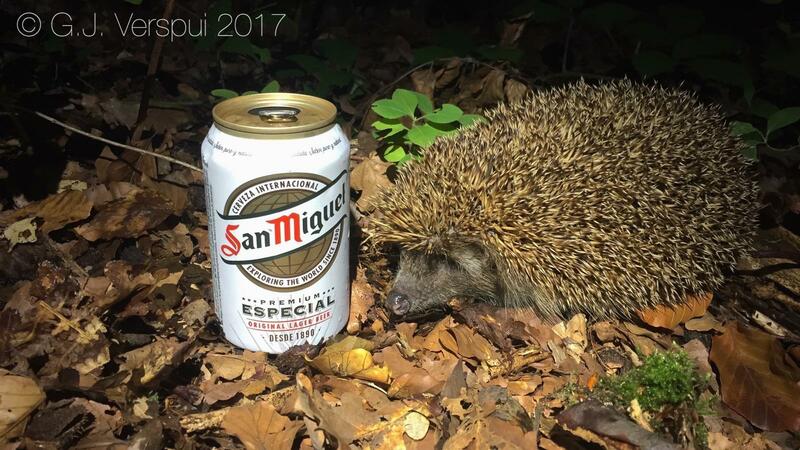 Cheers mate! 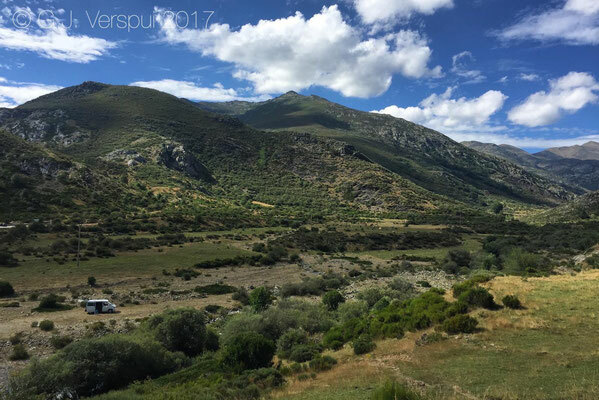 From here we drove home where I had 4 days before my next adventure would start, 3 weeks to USA & Mexico with Tim Warfel, Andy O'Connor and many more. 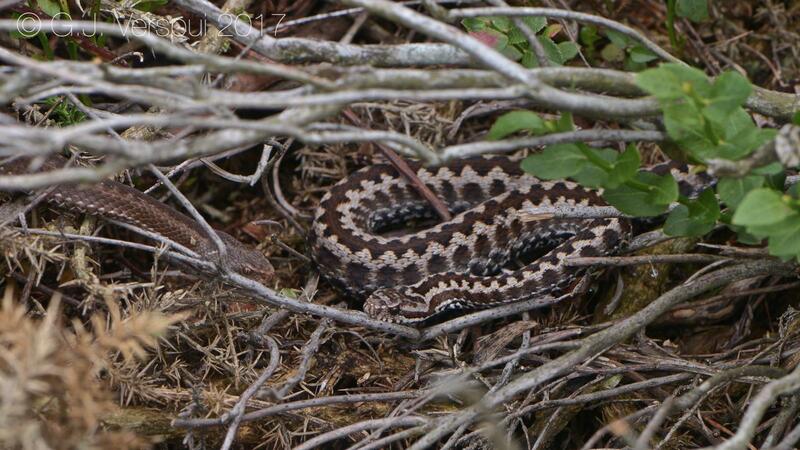 A great way to spend the summer, Im very happy with all the vipers that were found, around 60 in total. For the Vipera seoanei cantabrica I have to go back again, I only found 3 of them over the years so far and thats nothing compared to at least 100 of Vipera seoanei seoanei. Thanks to my friends who helped out a bit! 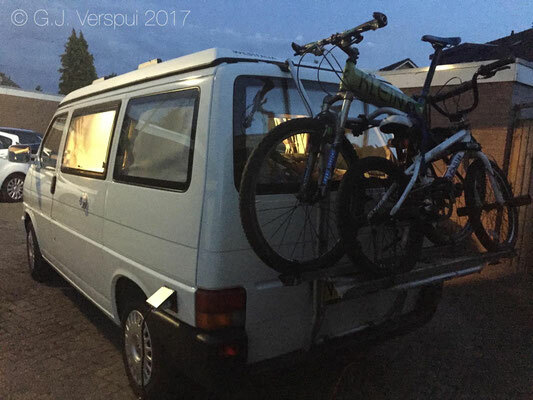 Sjuul, Matthieu, Frank, Jeroen, Wouter and Bobby, thanks amigos!